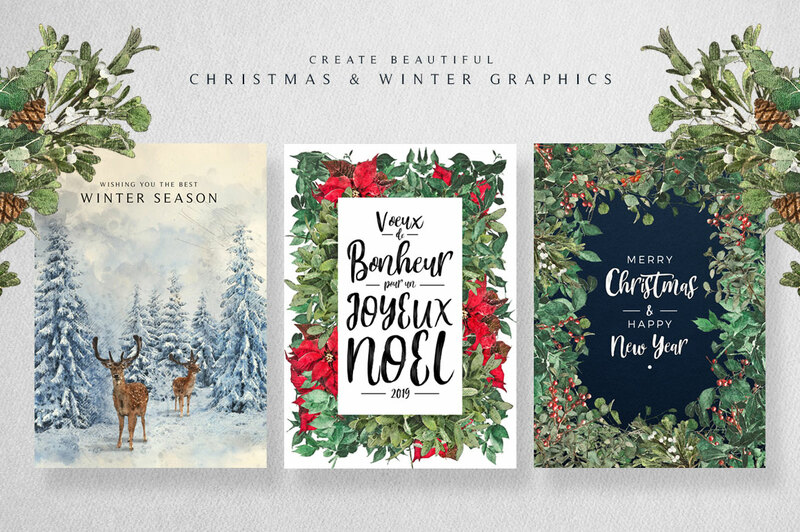 Introducing the Magical Christmas Creation Bundle – your chance to own the most incredible festive design packs at a massive discount. 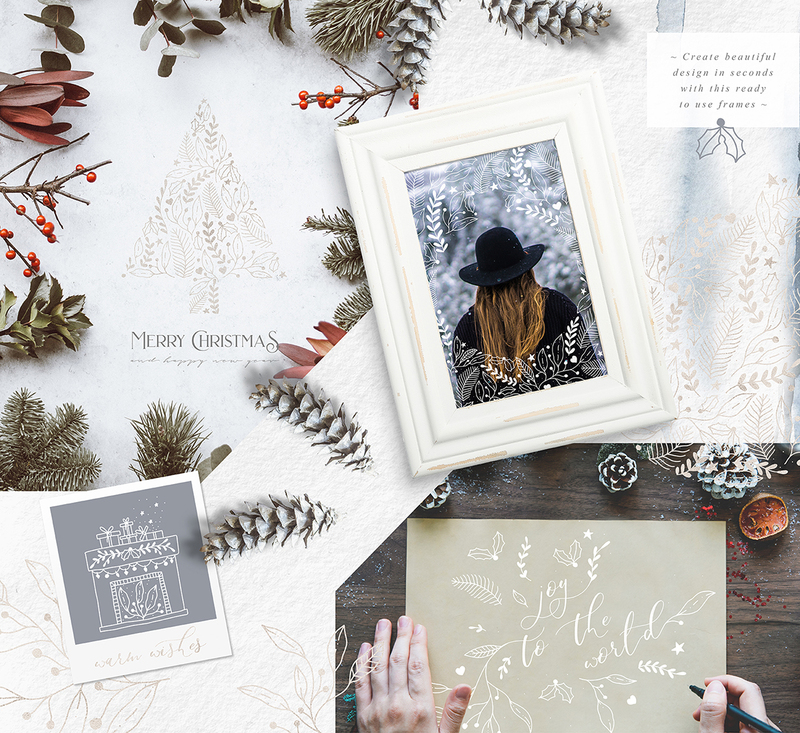 We’ve included a wide range of holiday resources ranging from fonts to photo editing tools, textures, illustrations, patterns, creation packs and more! 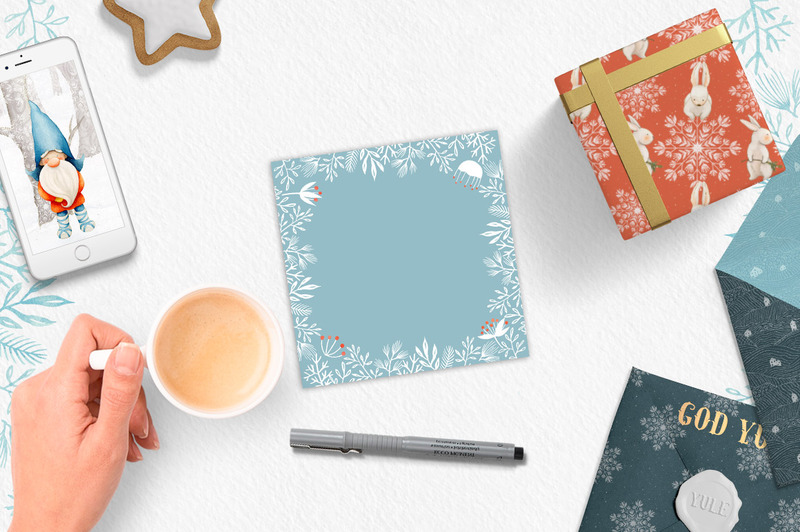 Add some festive flair to your regular projects, and create anything from wrapping paper to cards, home-made gifts and whatever else your imagination can dream up! 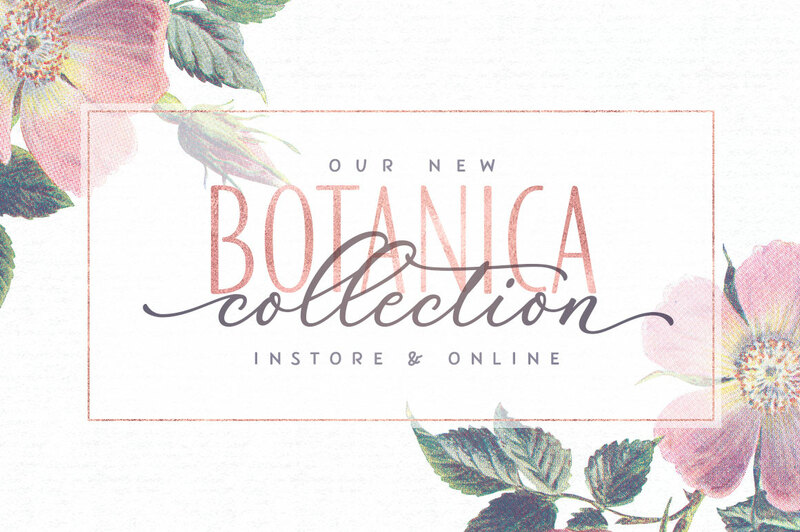 We’ve teamed up with some of the most talented designers in the industry to bring you their very best products. 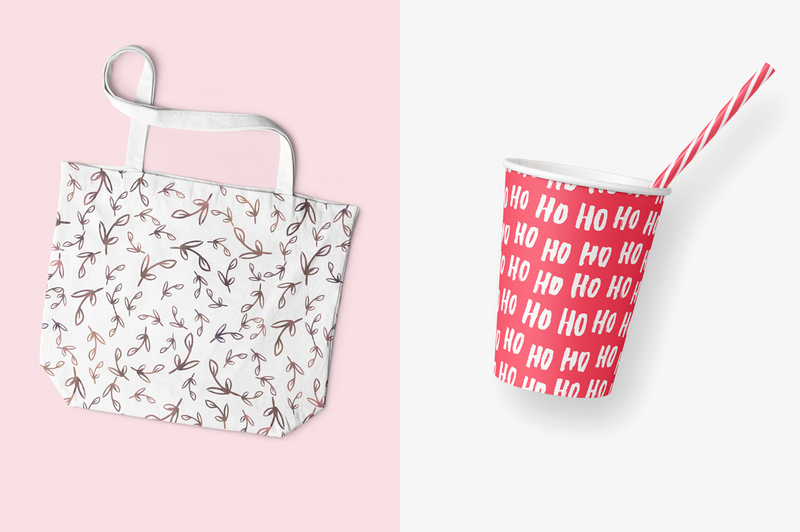 Even the Grinch would love this collection! 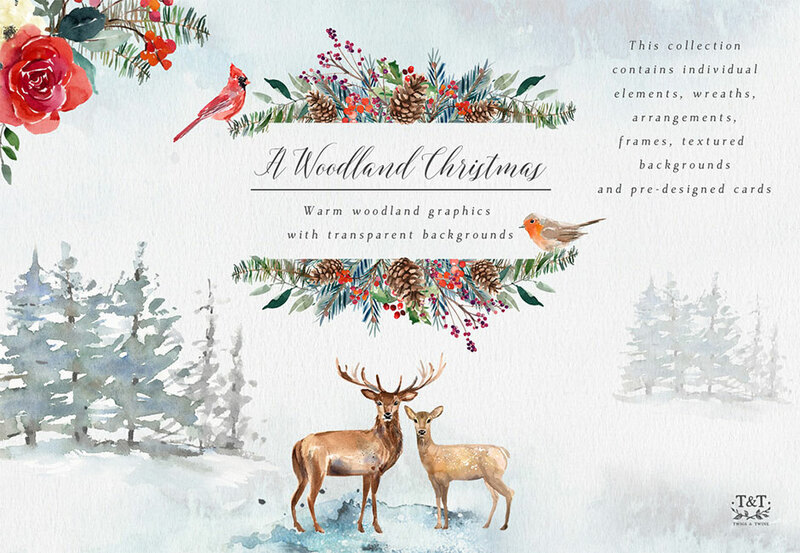 Curious animals live amongst the fir trees, foliage and berries, creating a magical Christmas backdrop. 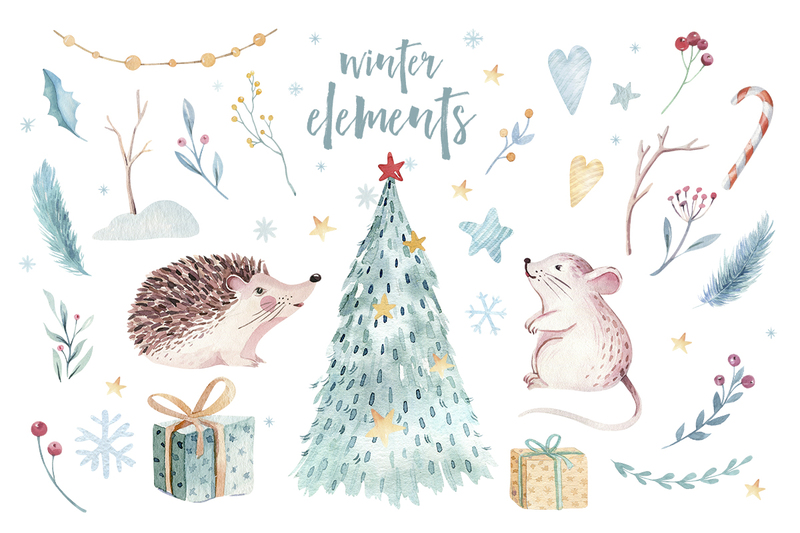 Each element is carefully hand-painted in watercolours and then used to create many designs which you can use for your festive projects. 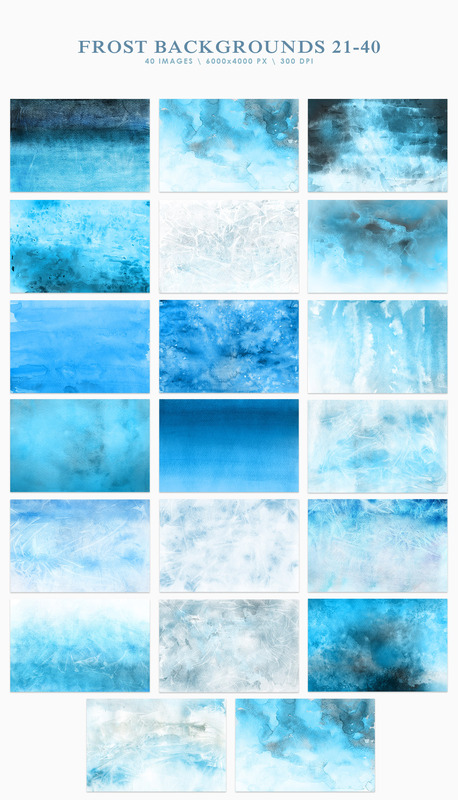 I have also created some washy watercolour snow backgrounds to create scenery and for backdrops to more minimal abstract designs. 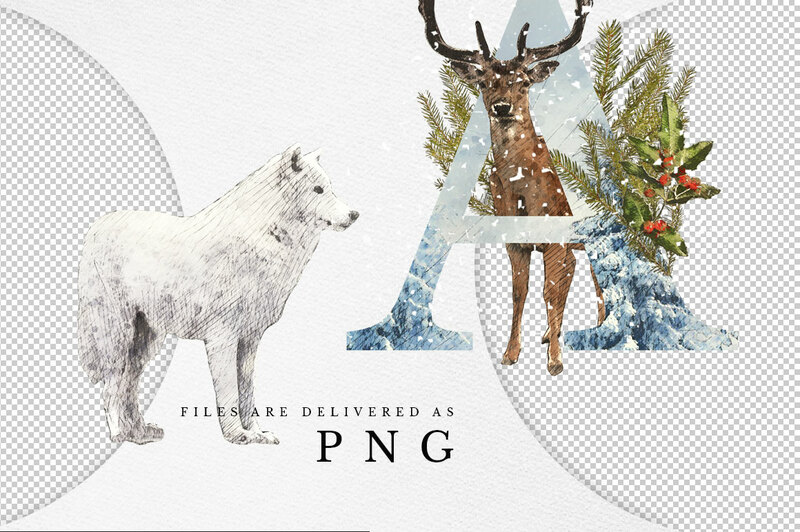 • 37 individual elements (animals, foliage and objects) in .PNG format with transparent background. 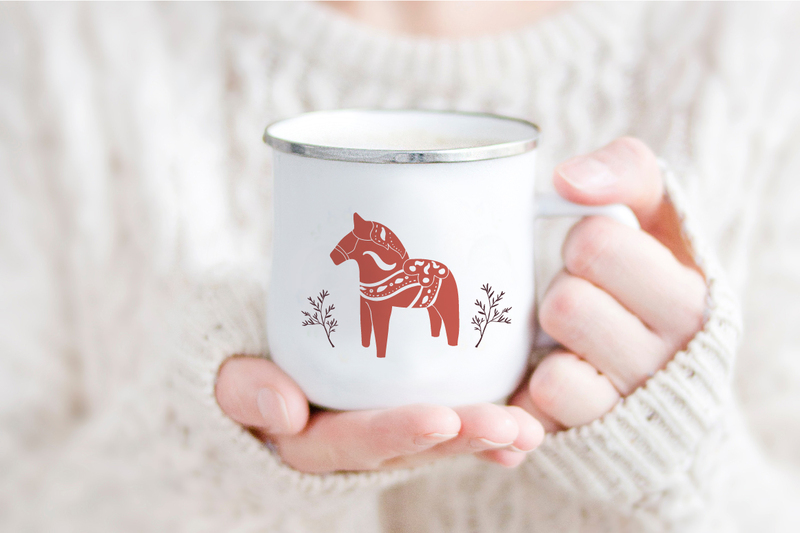 It is time for a Winter mood and Christmas gifts. 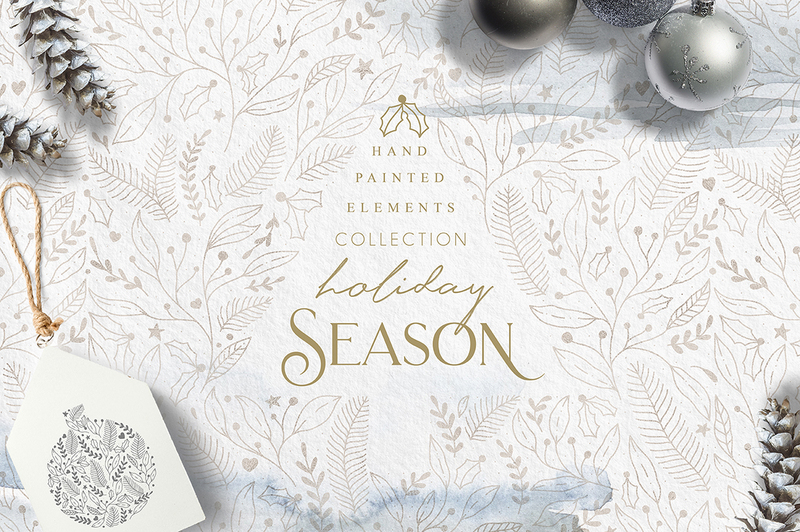 Holiday Collection has all you need for your Christmas projects! 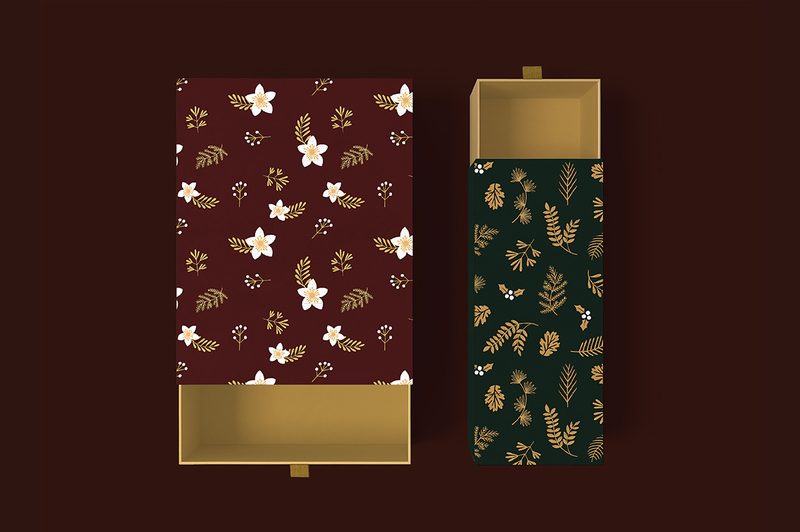 Just add ready-made graphics: patterns and frames. 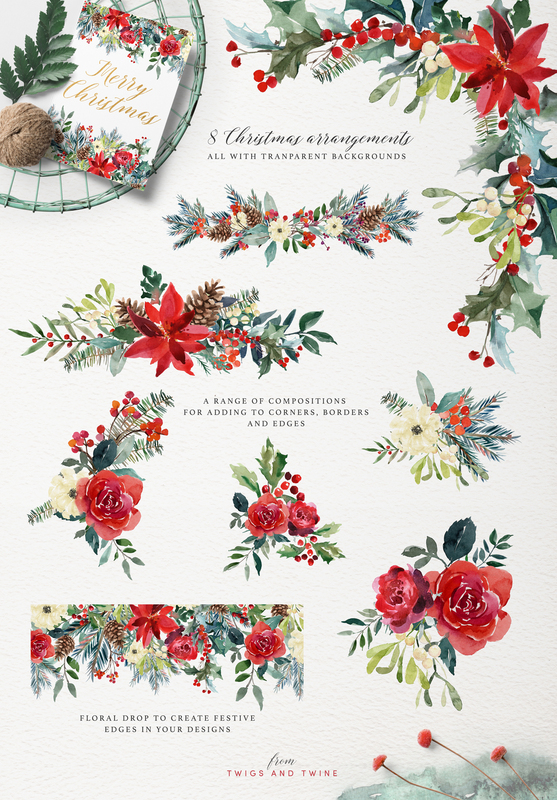 But also a big variety of individual elements: florals, illustrations and elements. 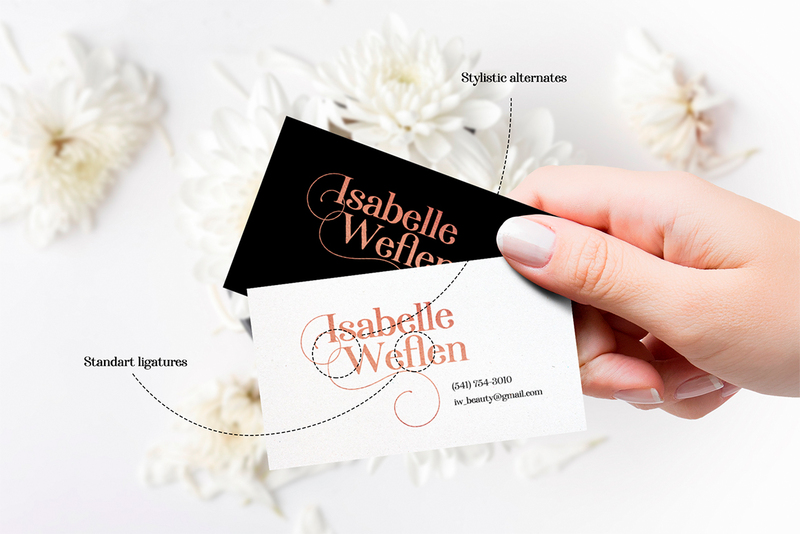 These elements are ideal for the creation of the corporate identity of your shop or your small store. 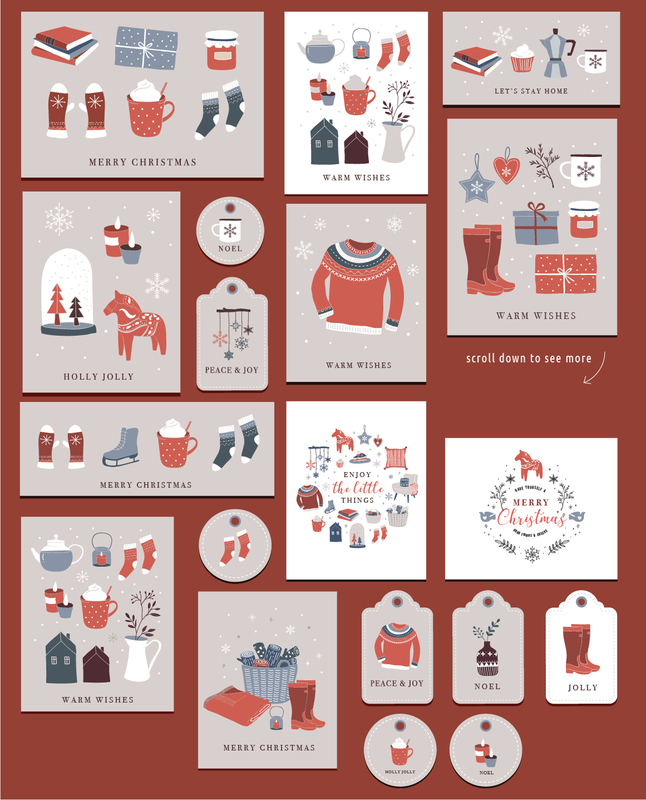 Or if you suddenly need to decorate your room or create a Christmas invitation. 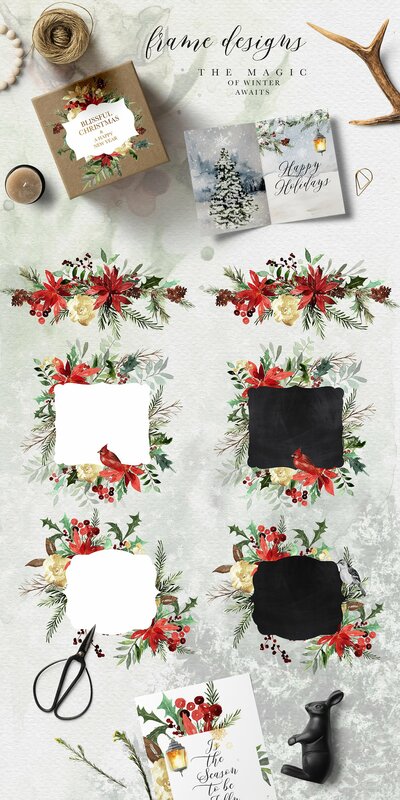 Add this beautiful hand painted elements and florals to create a postcard. 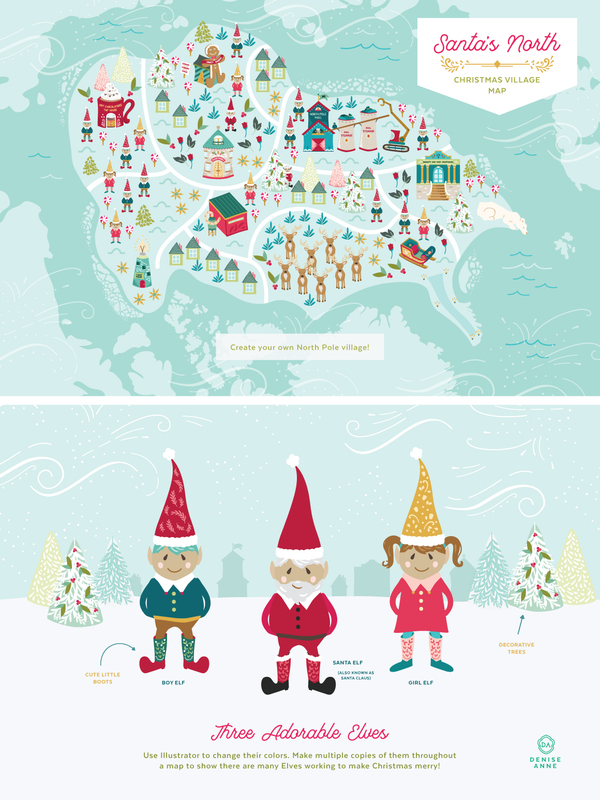 So thrilled to share this playful, and highly festive North Pole Christmas Village Map design Set! 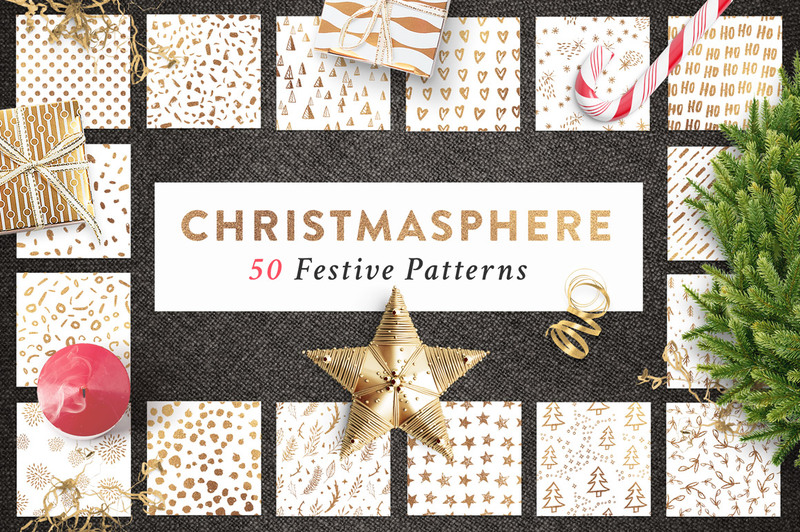 This Christmas map set contains no ordinary buildings! 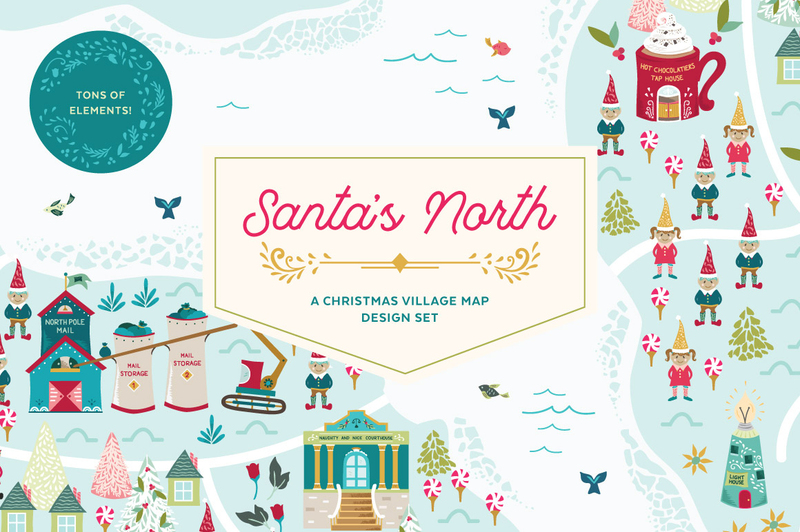 It is a map of Santa’s North Pole Village complete with Polar Bears, Elves, a North Pole Mail sorting facility, Santa’s Sleigh, Reindeer, and of course Santa. 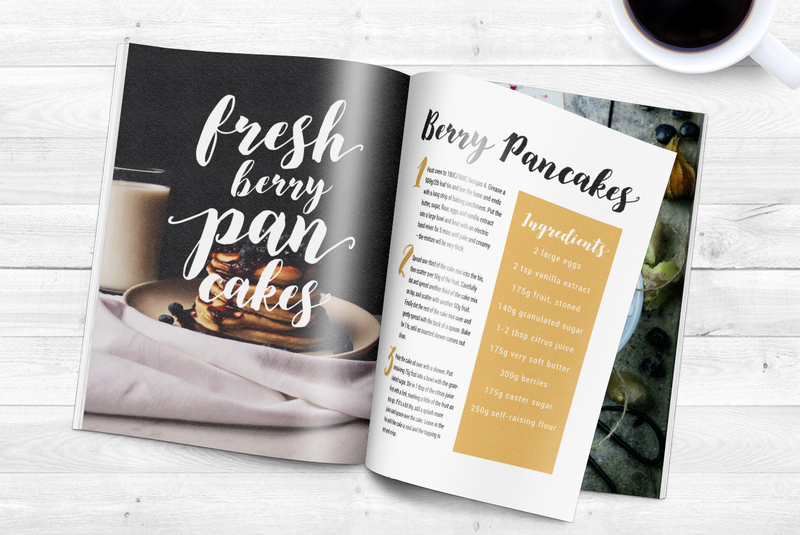 All the elements can be manipulated separately by utilizing the layers in Illustrator, or using the high-quality PNGs included. 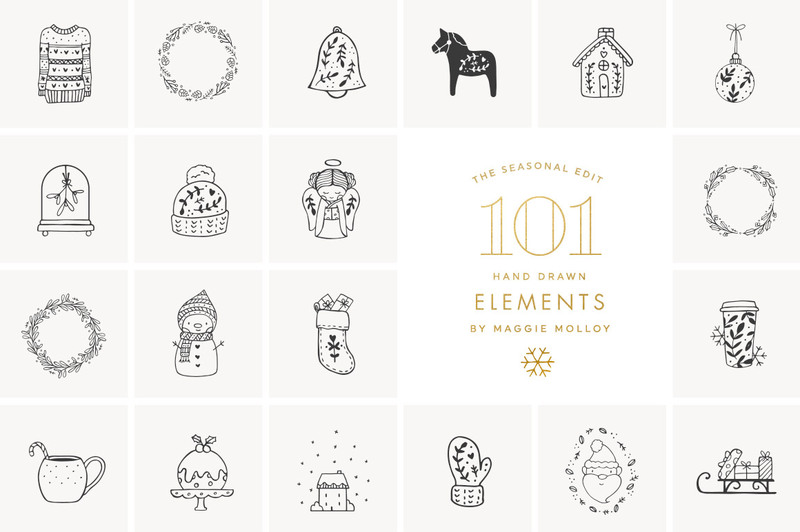 Create fun holiday products with elements including stationery sets, packaging, home goods, seasonal apparel and more! 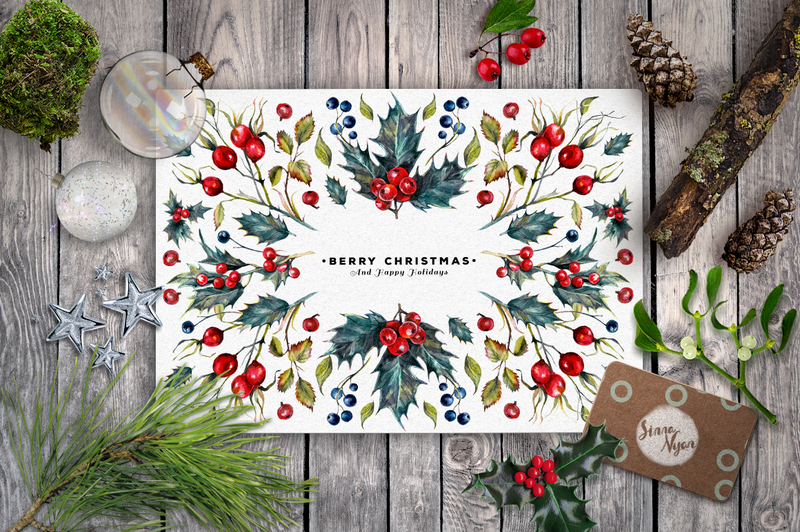 • Map Accent details including Peppermint Pop, Ground & Snow Cover Lines, North Star, Runway Lights, Floral Elements & Leaves, Berries, and more! 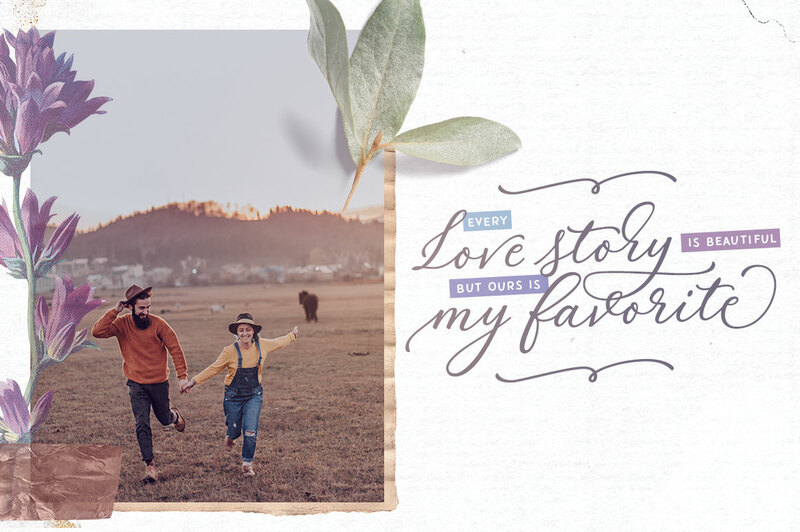 Please welcome, Palomino Clean – a carefully digitized brother (or sister) of Palomino calligraphy font family created using an amazing Palomino Blackwing 602 pencils. 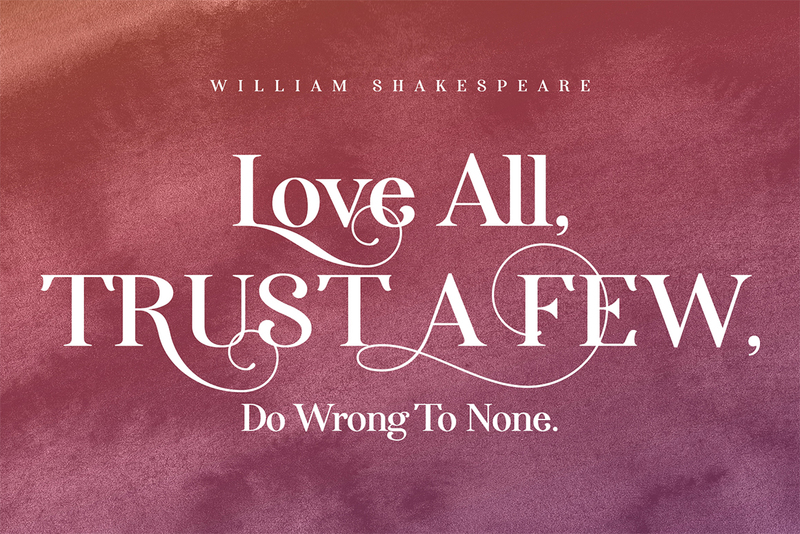 All features are identical to Palomino Original – the script font is loaded with initial, medial and terminal alternates and swashes. 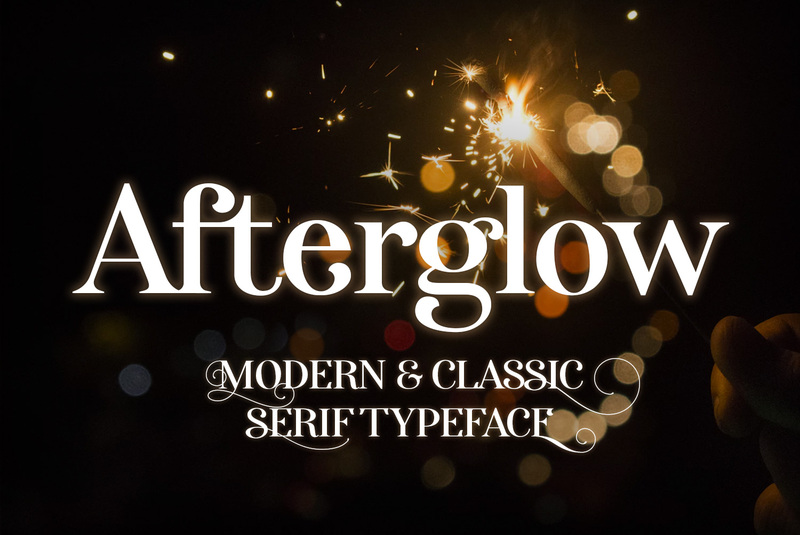 Along with a help of three other fonts – condensed sans, simple sans and design elements font – you’ll be able to create stunning designs with a click of a mouse. 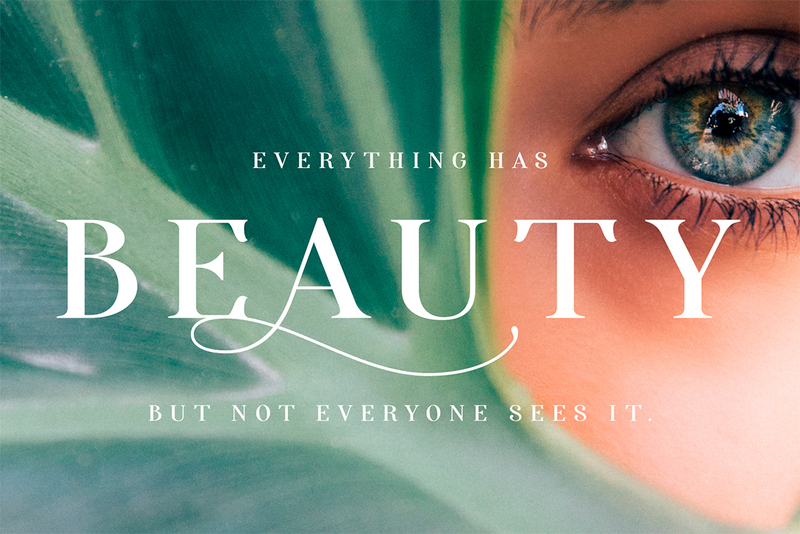 This versatile font family will work perfectly for fashion, e-commerce brands, wedding boutiques, photography, quotes design and a lot more. It has extensive language support and fully Unicode mapped. 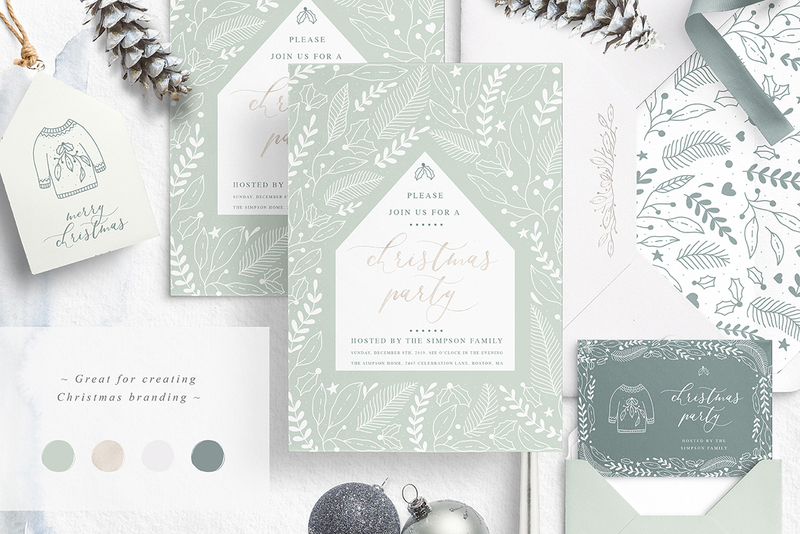 Evergreen is a classical/rustic celebration pack made with the pine and spruce scent as . 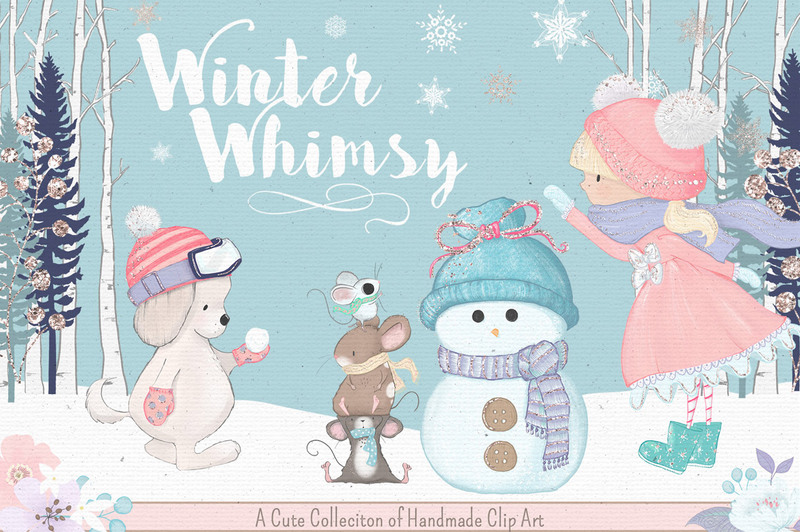 It features a great variety of elements for creating dreamy winter landscapes with everything you need, from backgrounds to snow overlays. 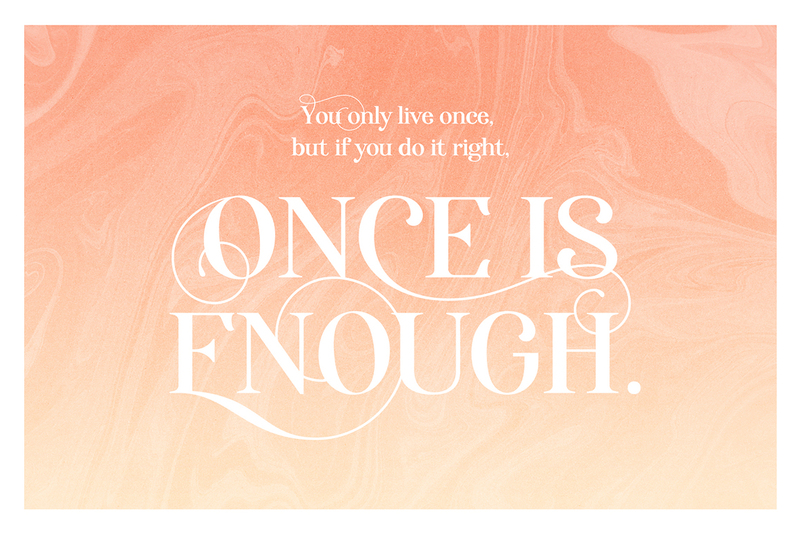 Elegant and stylish serif typeface full of contrast lines, a lot of Stylistic Alternates with thin swashes. Tons of capitals alternates, some have up to 12! Use only capitals for headers or quotes, it looks strong and refined, or use Caps with lowercase for block texts, or subheaders. 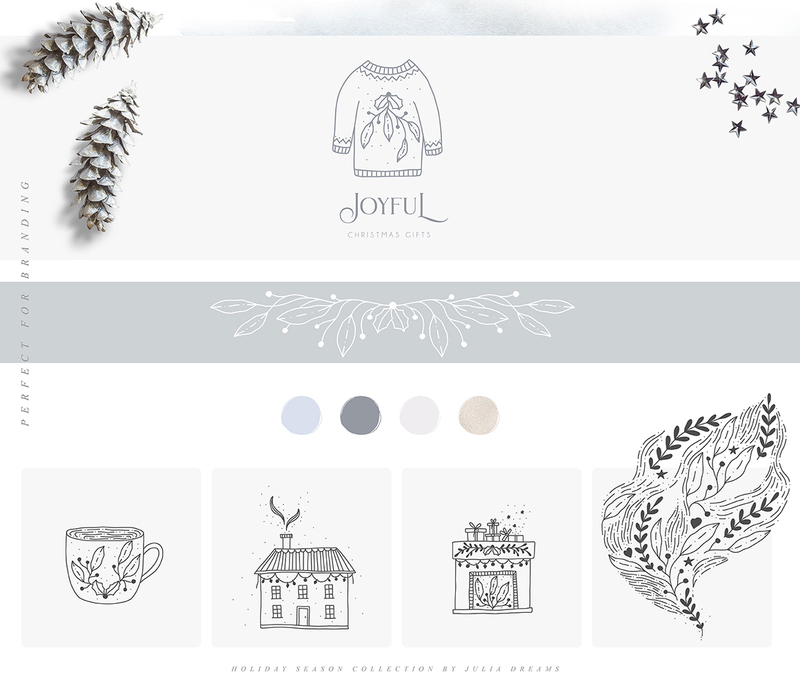 Design your art- or beauty blogs, t-shirts or websites, posters, magazines or cards, and logo’s of course. Language Support: Czech, Danish, Dutch, English, Estonian, Faroese, Finnish, French, Galician, German, Icelandic, Irish, Italian, Norwegian, Portuguese, Polish, Spanish, Swedish, Swiss German. 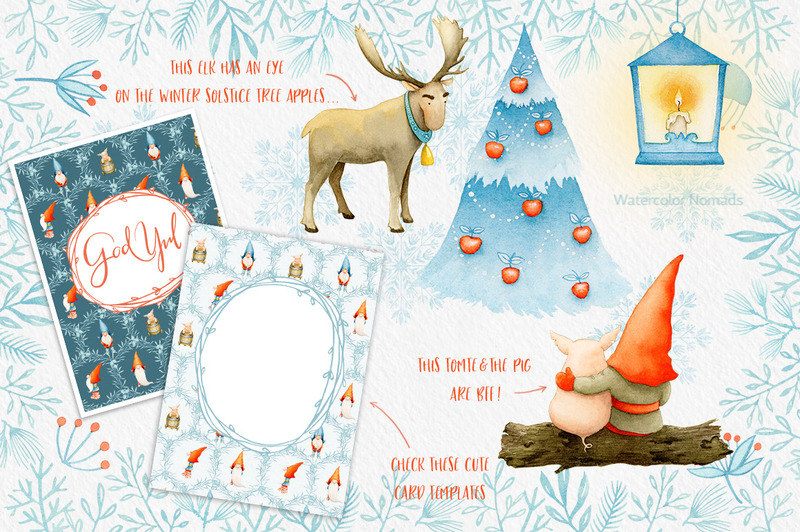 This delightful pack was a joy to illustrate, especially for such a wonderful wintery time of year. 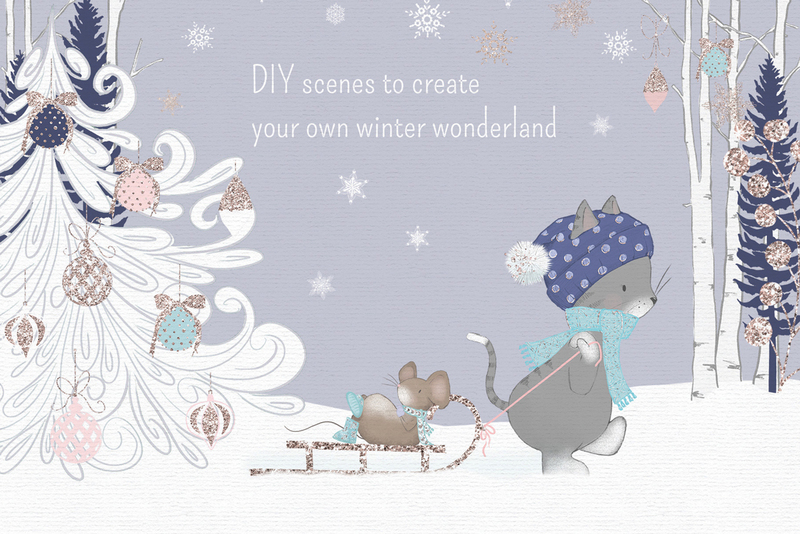 Enjoy creating all your fun and festive projects with cute little critters and a sparkly splash of glitter. 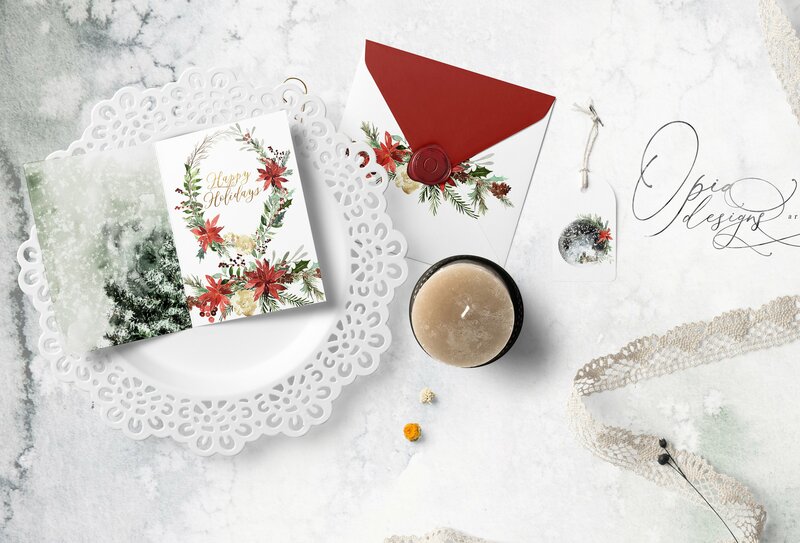 This set is perfect for all your Christmas needs including greeting cards, invitations, wall art, fabric design, party supplies, wrapping paper and more! 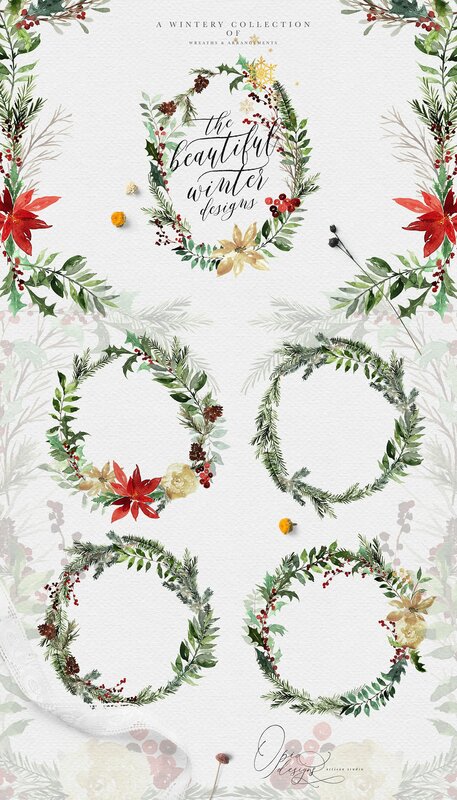 You’ll be inspired by the sweet hand crafted floral arrangements, wreaths, ornaments and individual DIY elements to easily create adorable festive projects. 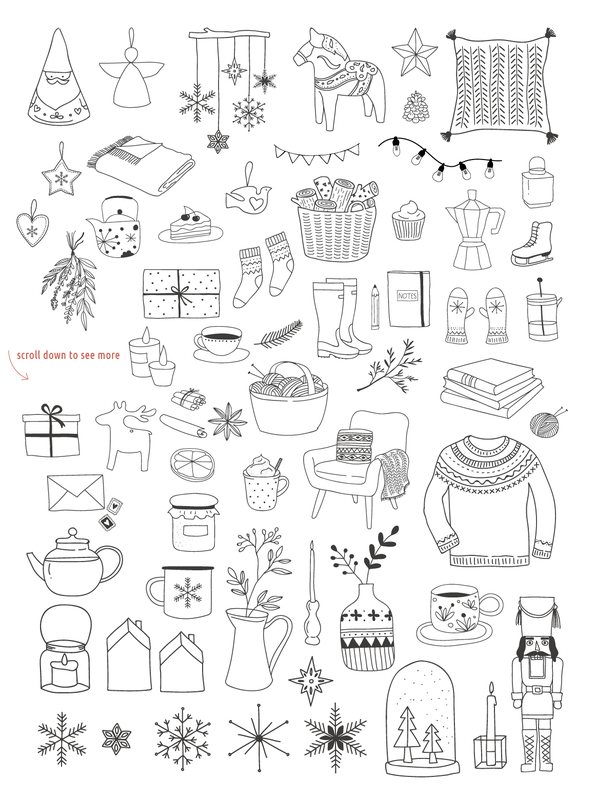 With over 180 elements in this clip art kit you will have all the ingredients you’ll need to have a blast creating this Christmas season. 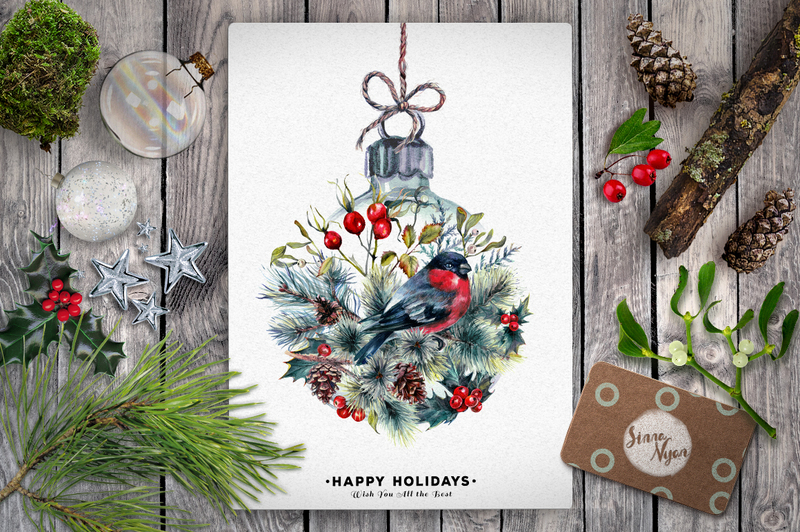 Have a wonderful time creating holiday projects! 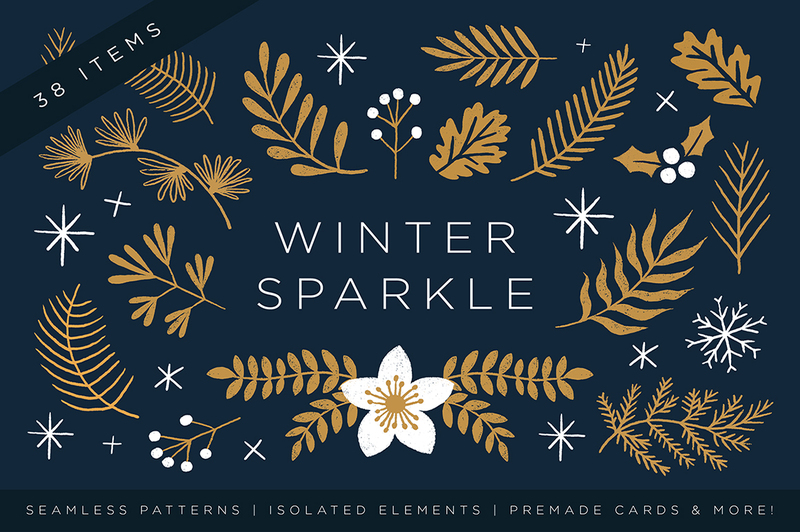 December Sparks is a modern, brush, calligraphy font with a dancing baseline and decorative swashes. 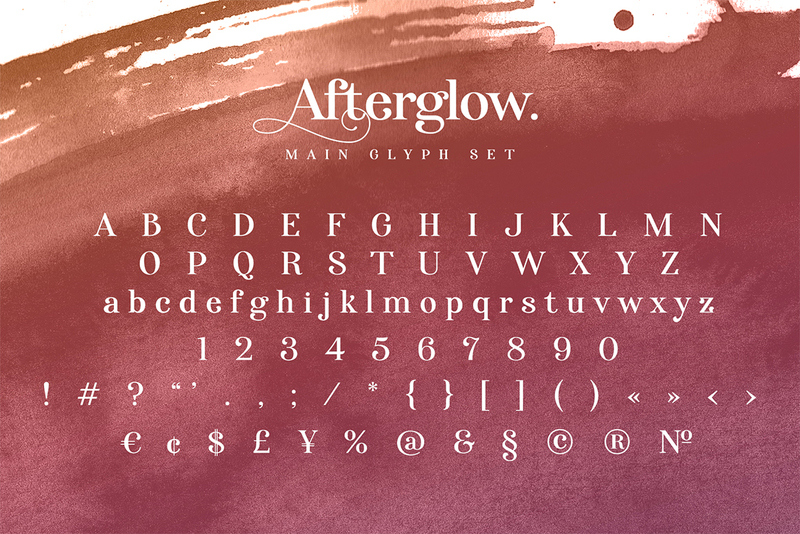 This playful script will look gorgeous on all your branding materials, cards, invites, and any other lovely projects you are working on. 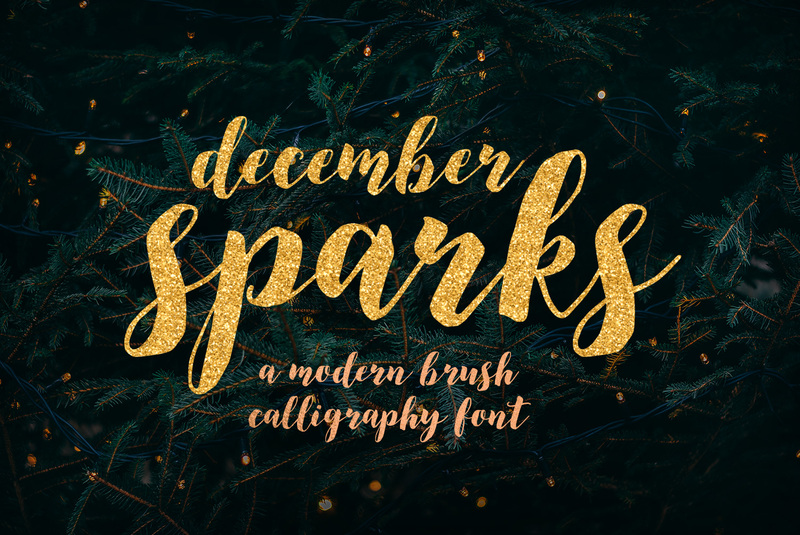 December Sparks contains standard characters, lowercase, uppercase, numbers, punctuation, ligatures, and international characters. 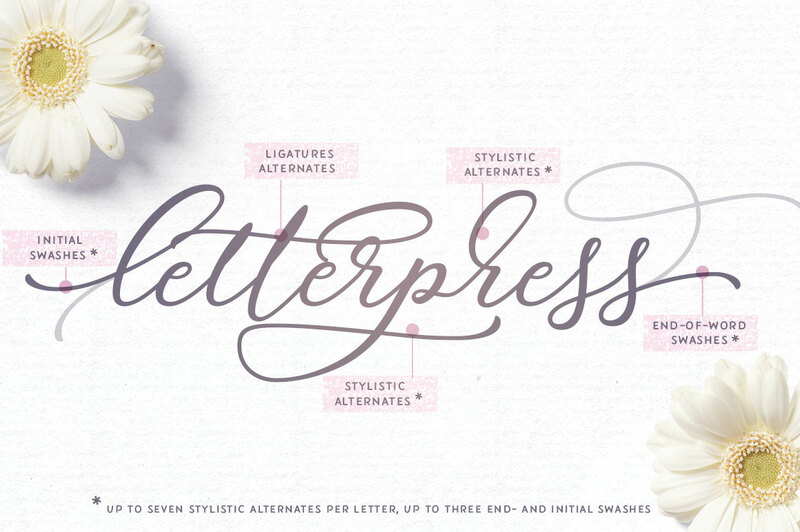 The lowercase letters include alternates with initial and end swashes. 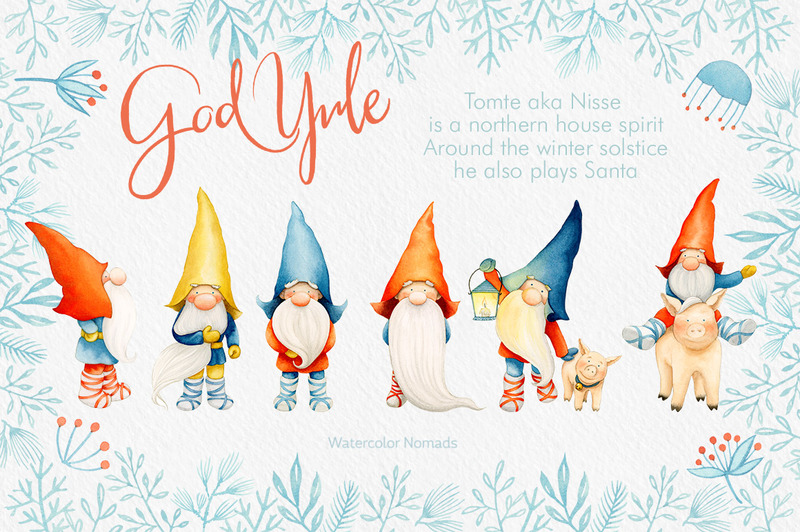 Yuletide is the time when in the North the Winter Solstice is celebrated. 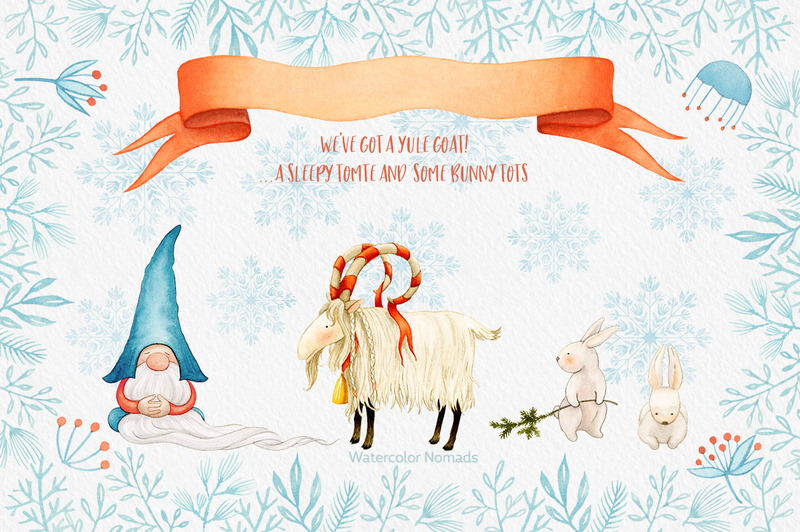 It is the Tomte and the Yule Goat that bring the presents. It is a magical time full of songs, love and good food! 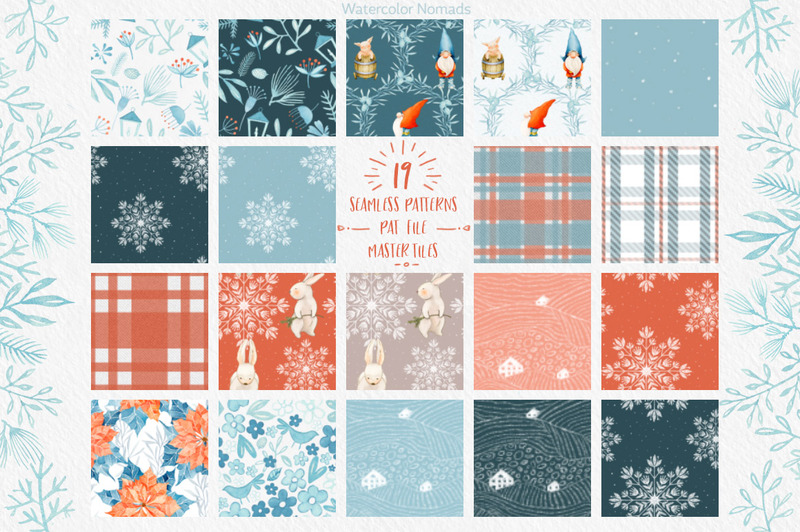 To make your design job really easy we have added 19 seamless patterns made with elements from the collection or drawn to complement them. 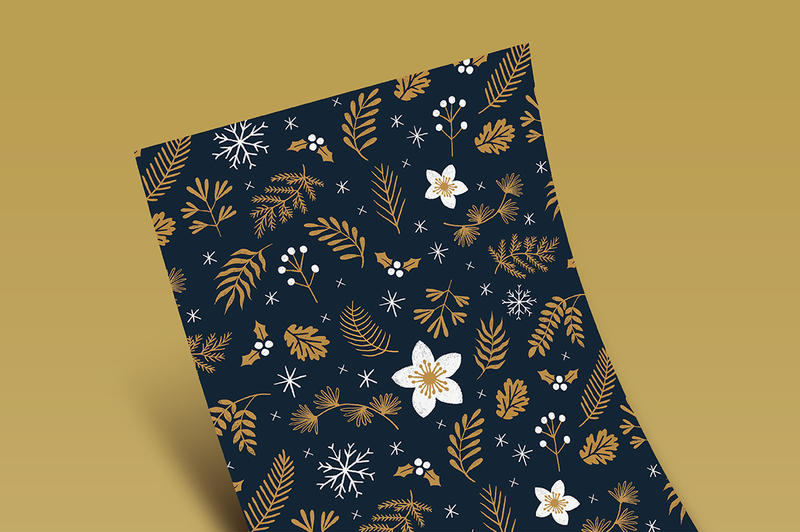 The patterns are available as 12×12” .JPG at 300 ppi, as .PAT file that you can install in Photoshop or Photoshop Elements and also as a Master tile that you can duplicate to make a seamless pattern. 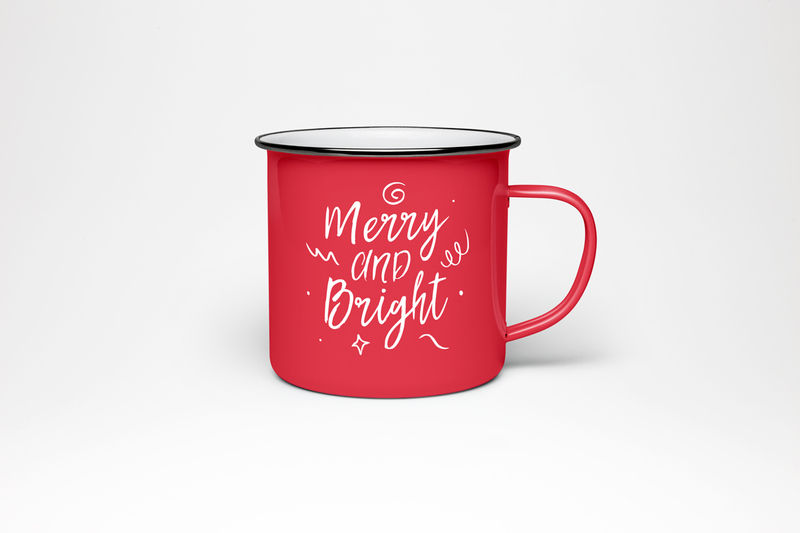 If the holiday season has already got you and you’d prefer enjoying the cocktails rather than designing? 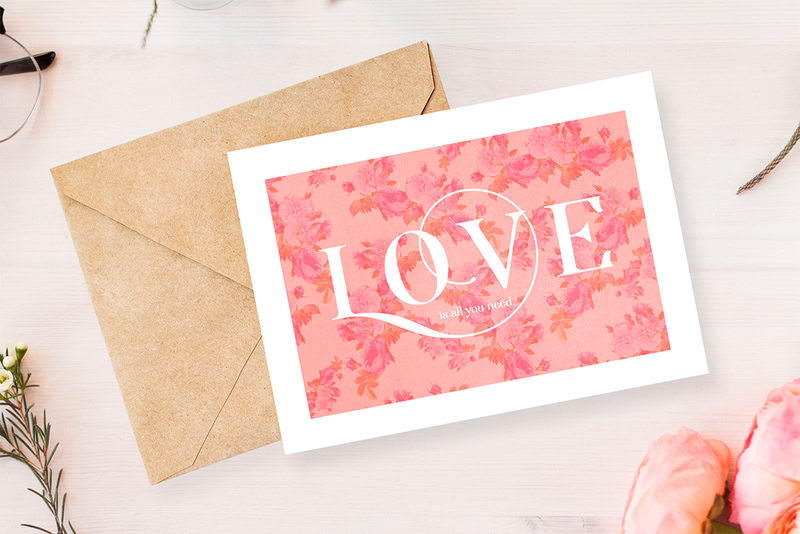 We got you covered with 14 pre-made card templates! 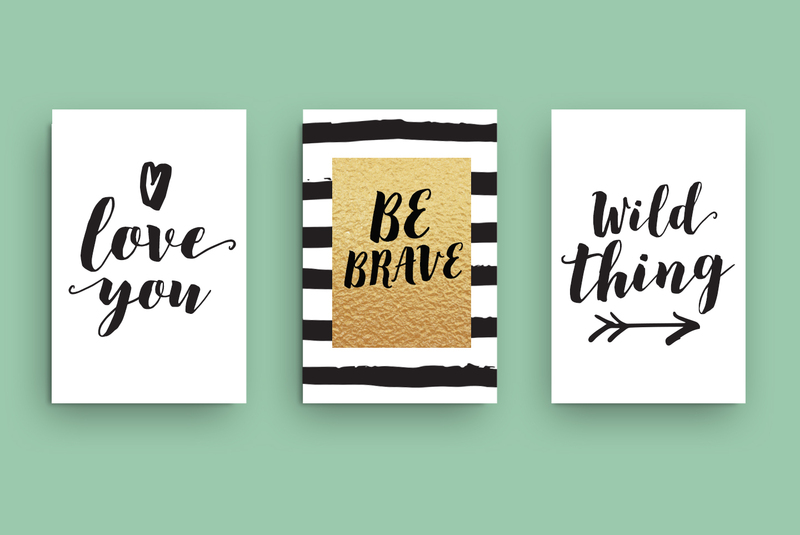 You can customize the layered .PSD files or just use the flat .JPGs and hand-write over them. 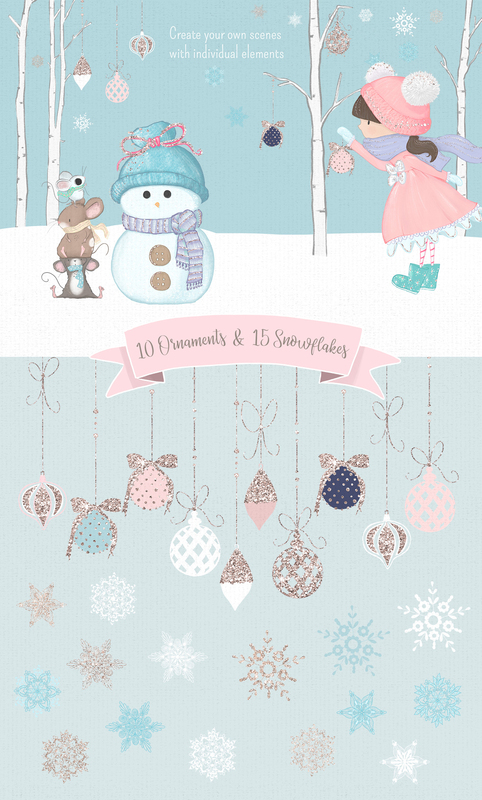 • Here is a list of what’s inside this magical set of 106 illustrations + 19 seamless patterns + 14 greeting card templates! 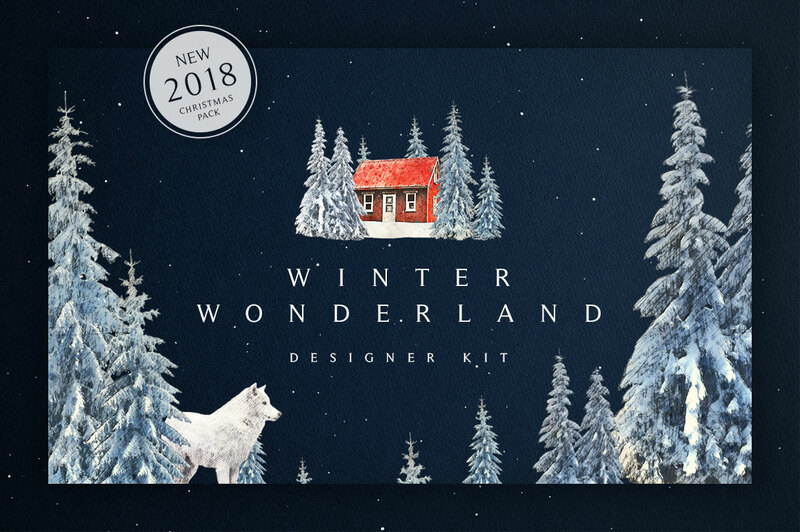 We are very excited to present our Winter Wonderland Designer Toolkit featuring more than 200 illustration and graphics. 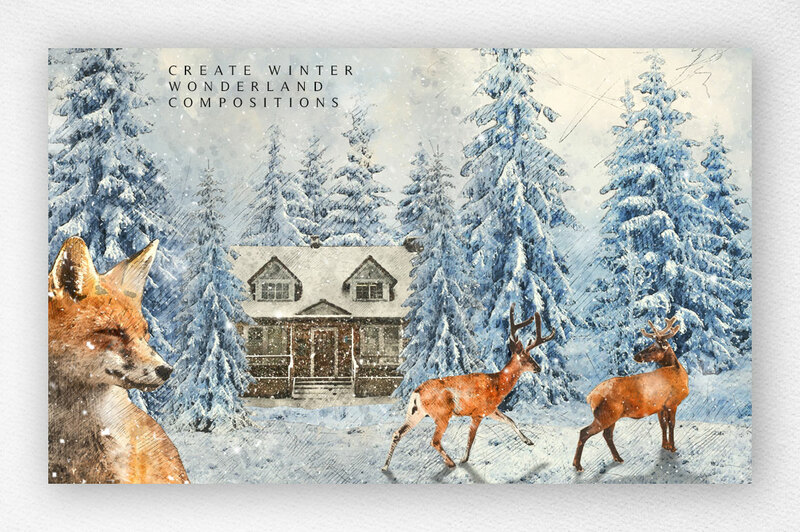 Create amazing winter and Christmas layouts with this kit. 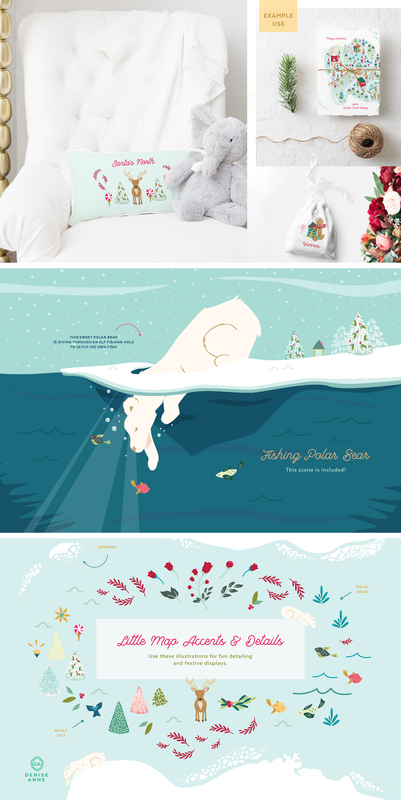 All illustrations are delivered as PNG files with transparent background. 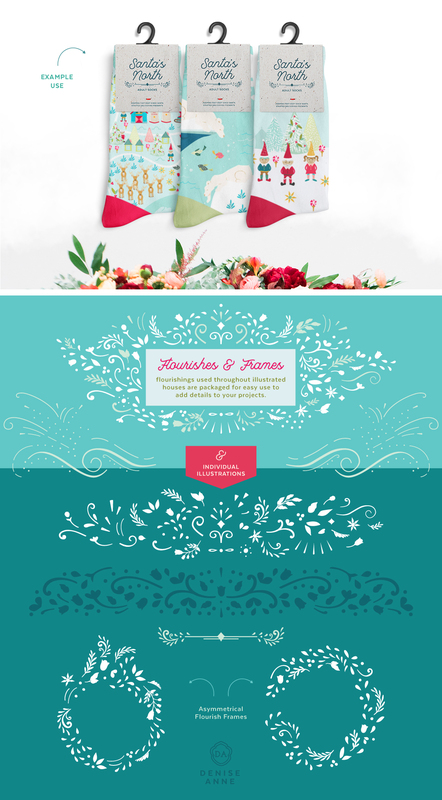 There are also 20 premade card designs delivered in .JPG and fully editable .PSD files. Software compatibility: Adobe Photoshop CS4 (and higher), .JPG and .PNG files will work with most graphic software. 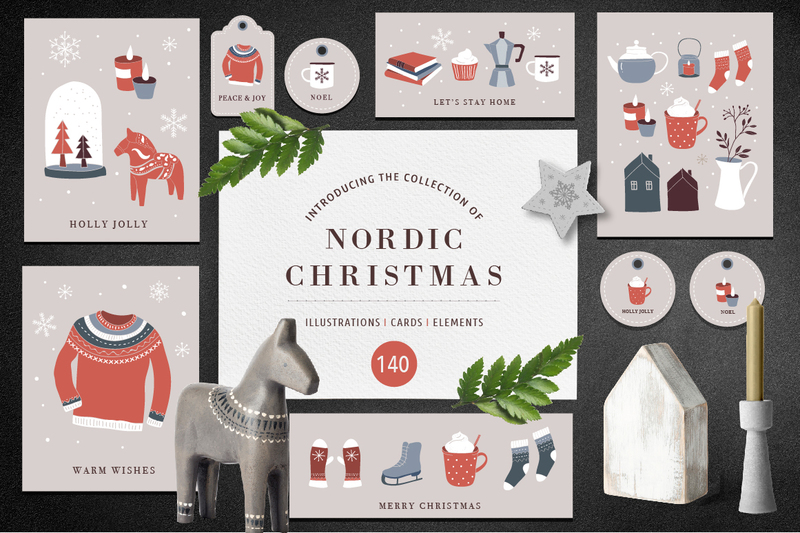 Nordic Christmas collection is a set of more than 140 hand drawn icons, elements, illustrations, labels, banners and greeting cards designed in the Scandinavian modern style. 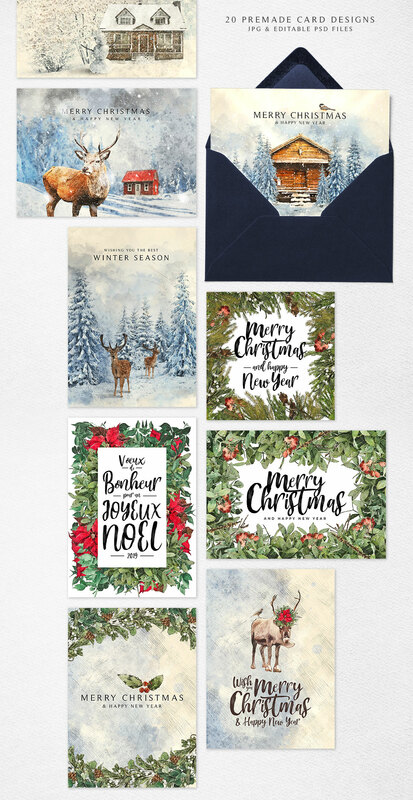 This collection is all that you need to design your Christmas party invites, nursery design, posters, greeting cards, social media promotions, apparel design and more! 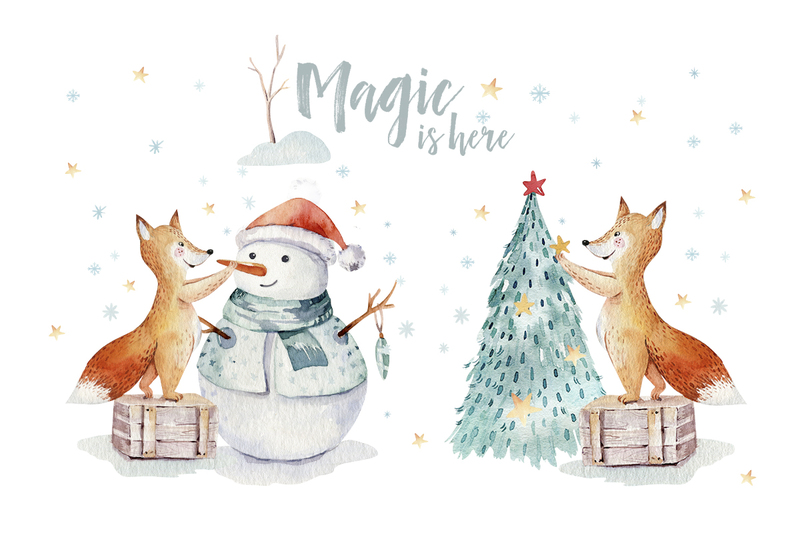 We are so happy to introducing the magical font My Dear Santa – a hand painted typeface, created specially for the Christmas Spirit. 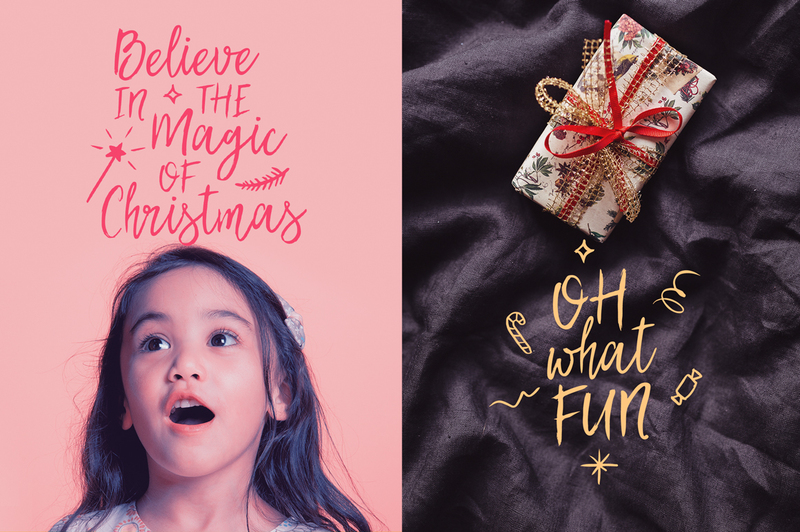 Crafted with love, magical font My Dear Santa – a hand painted typeface, created specially for the Christmas Spirit. You can have so much fun with this script! 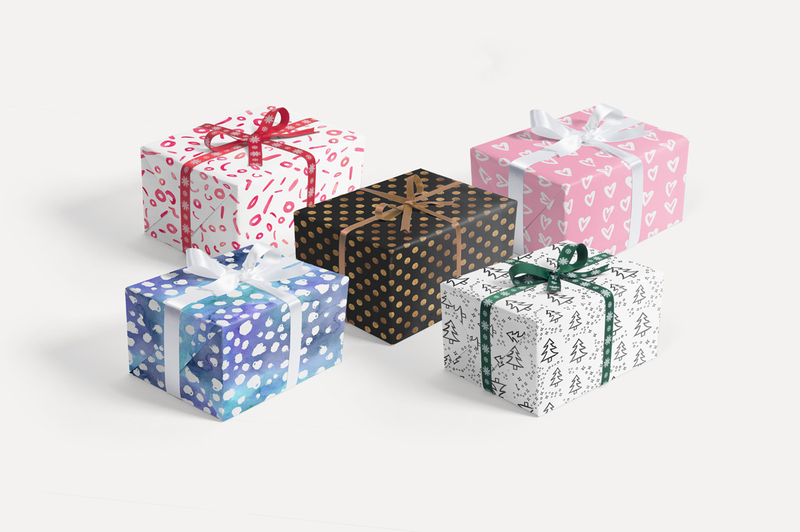 You can write your own letter to Santa! Isn’t that awesome?! 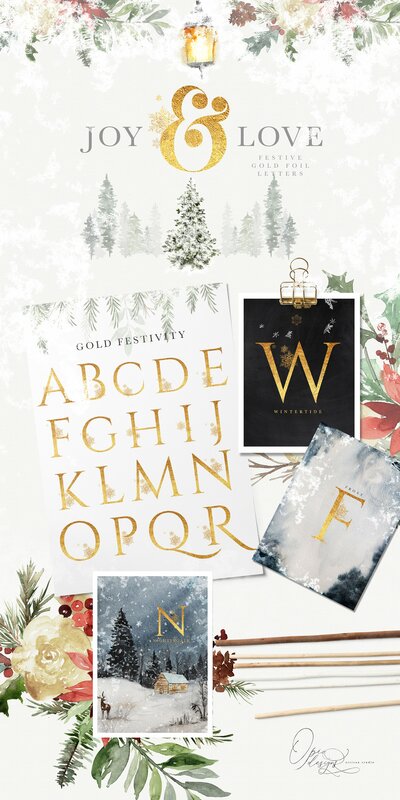 Also, this font is perfect for invitations, cards, and gift DIY projects this holiday season! 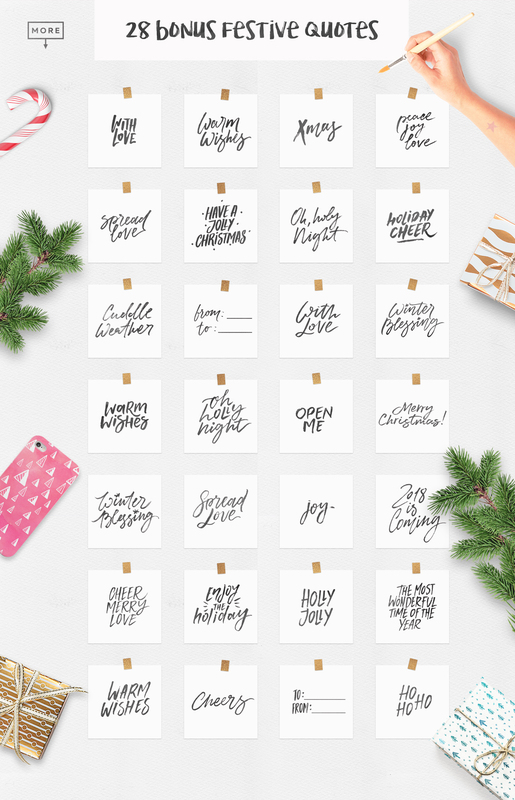 This font can really helps you to design that look of truly hand-drawn and also festive touch to any of your typographic projects. 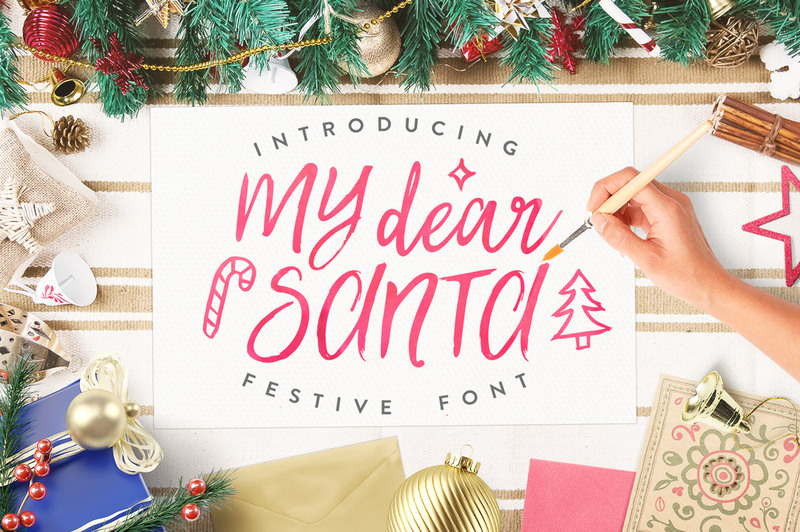 My Dear Santa typeface (Regular, Slanted, Upright and Extras) comes with upper and lowercase characters, set of numerals and punctuation as well as 60 beautiful hand drawn holiday icons, which help you to create more fun projects! 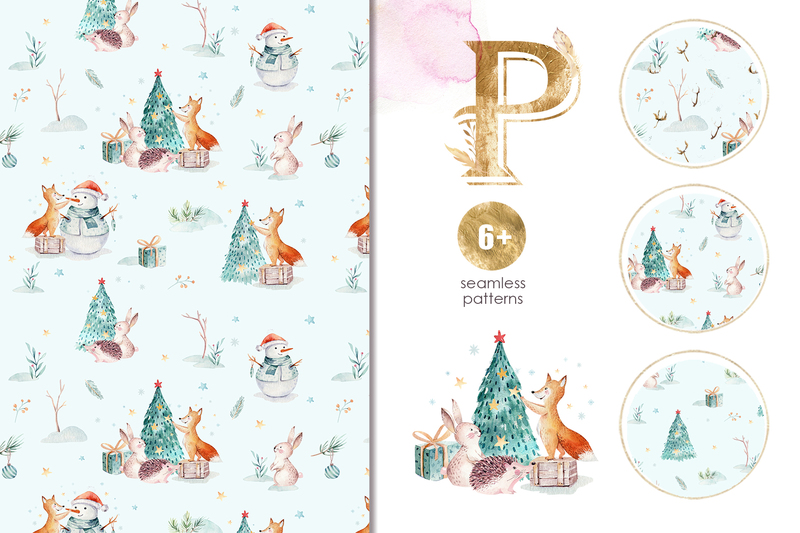 Meet our new magical collection of 50 Christmas Seamless Patterns. 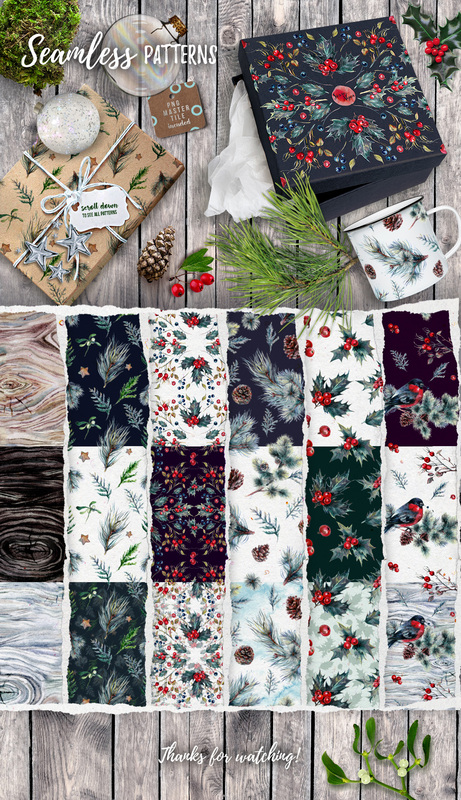 This Holiday pattern collection includes everything you need to add that festive touch to any of your beautiful projects. 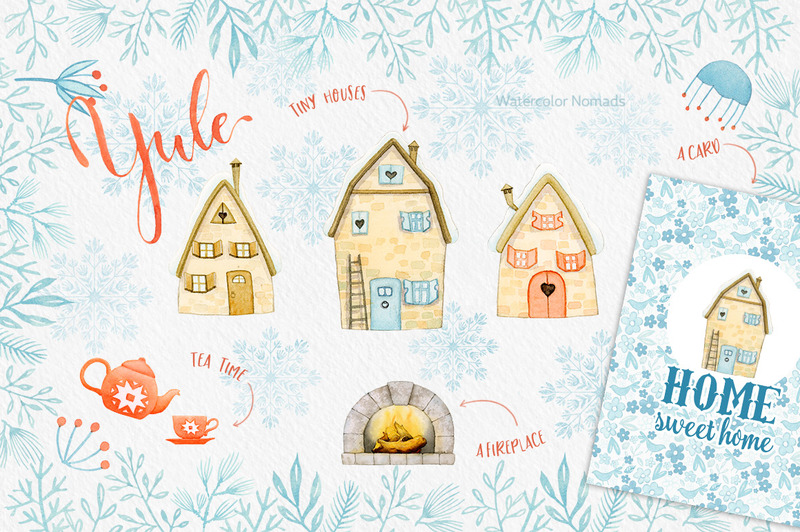 Sit back, make yourself a cup of hot chocolate and dive into adventure with Christmasphere. 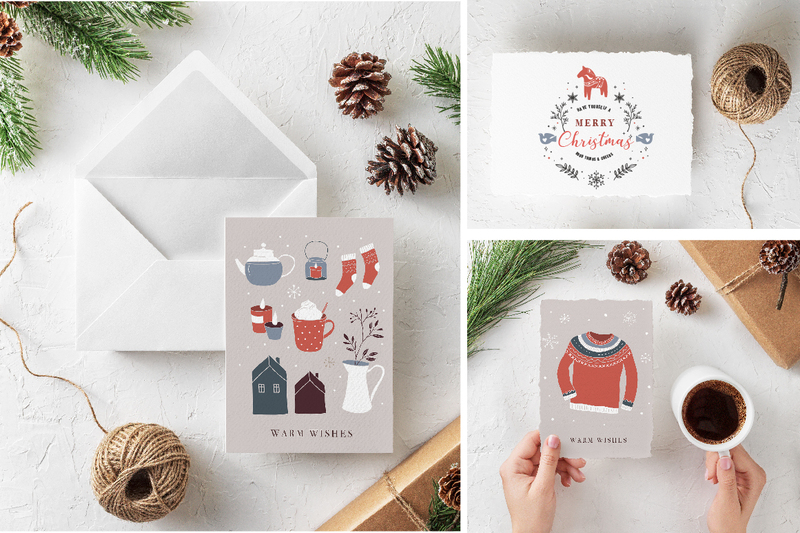 This pack is perfect for invitations, festive content for your social media, greeting cards, home decor (pillows, bedclothes, towels, napkins) festive tags, printables, stylish merch designs, crafts, fashion, gift DIY projects for this holiday season and so much more. 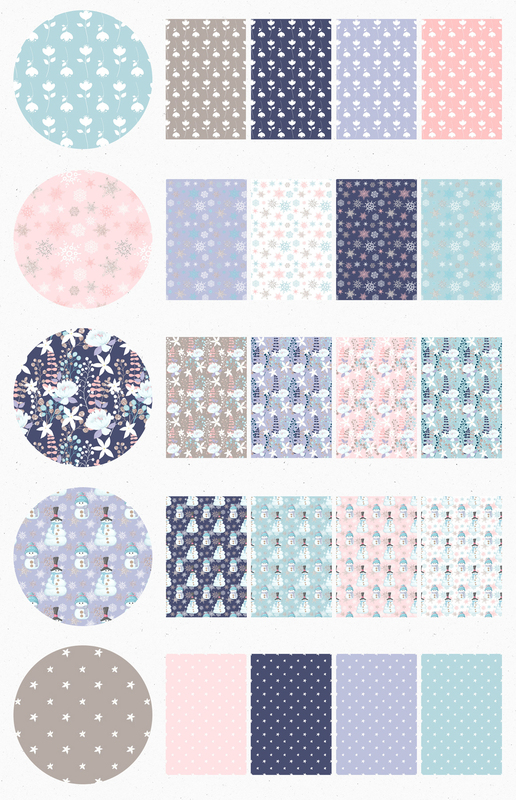 • 50 .PNG files of every pattern with a transparent background. Dimensions: 4000 px x 4000 px. 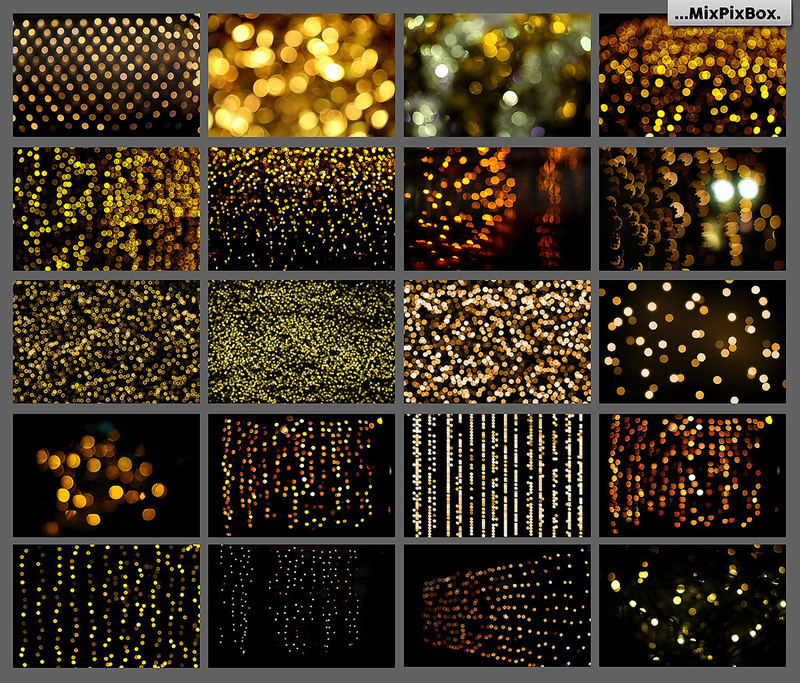 • 50 .JPG files of every pattern. Dimensions: 4000 px x 4000 px. 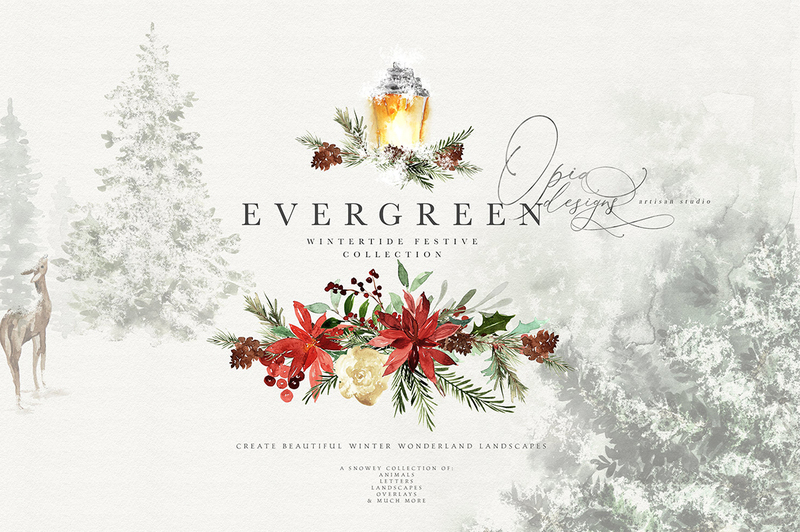 Winter is the time of festivals which creates countless occasions for your design work. 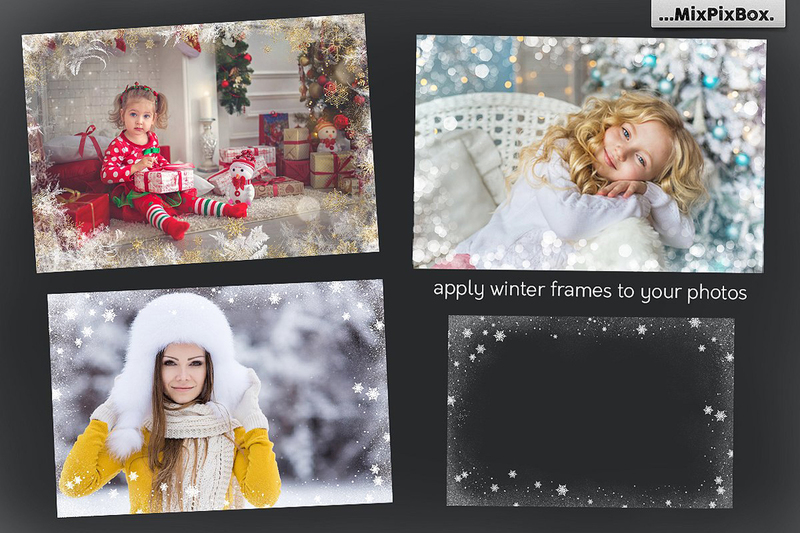 Crown your compositions with our snow crystals! 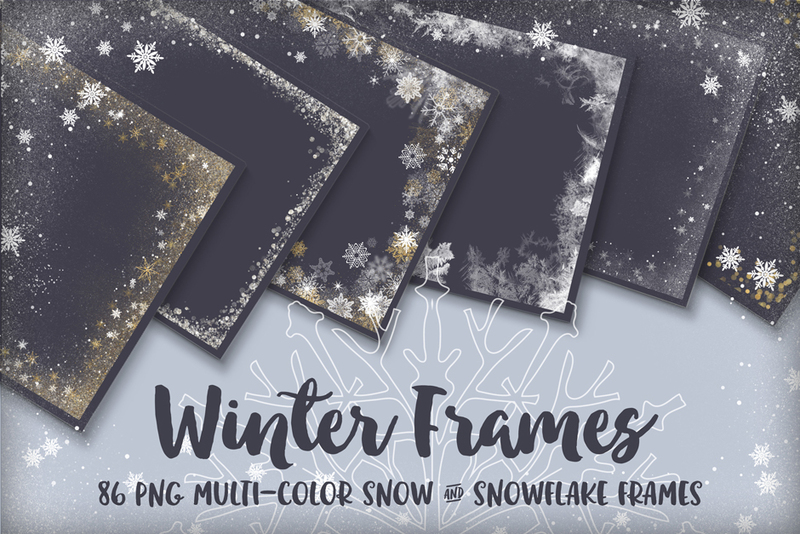 You are able to purchase a unique super-pack consisting of 86 .PNG multi-color snow & snowflake frames and 15 versions of digital paper. 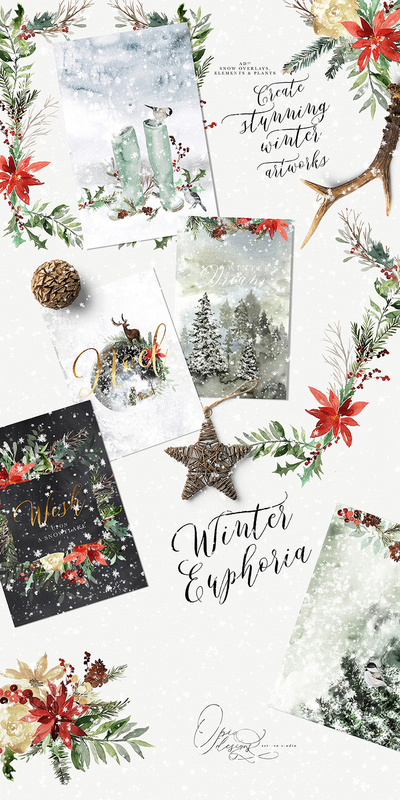 Use the winter holiday messengers, for example, for flyers, posters, thank-you and congratulation cards, Christmas and New Year’s greetings. 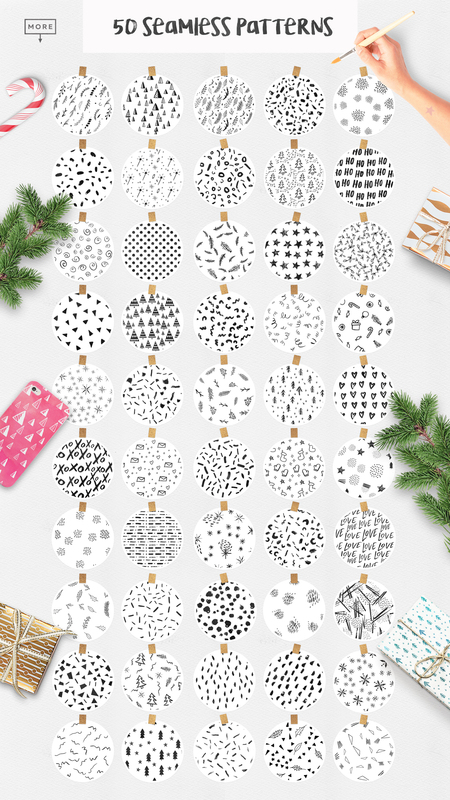 You’ll get one-of-a-kind shapes finely honed down to the last detail! 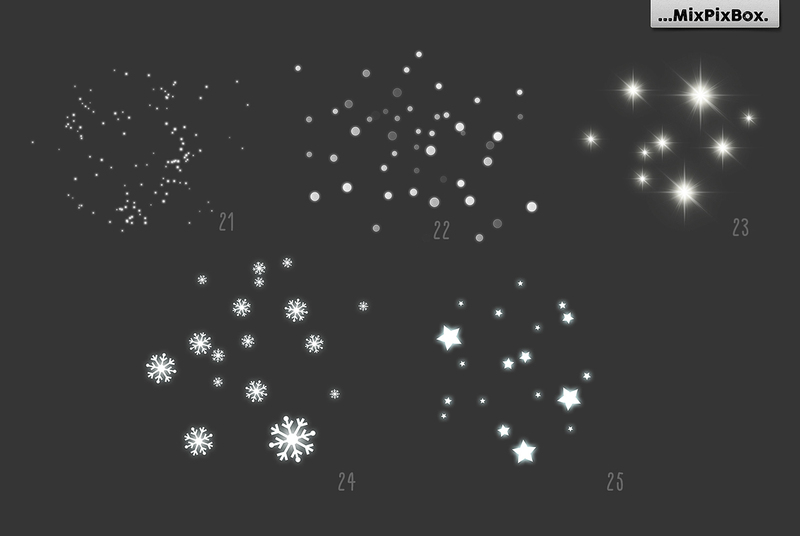 86 high-resolution snowflake frames are compatible with most popular graphics programs. Just add them to the software and adjust ice crystals and framing as you please. 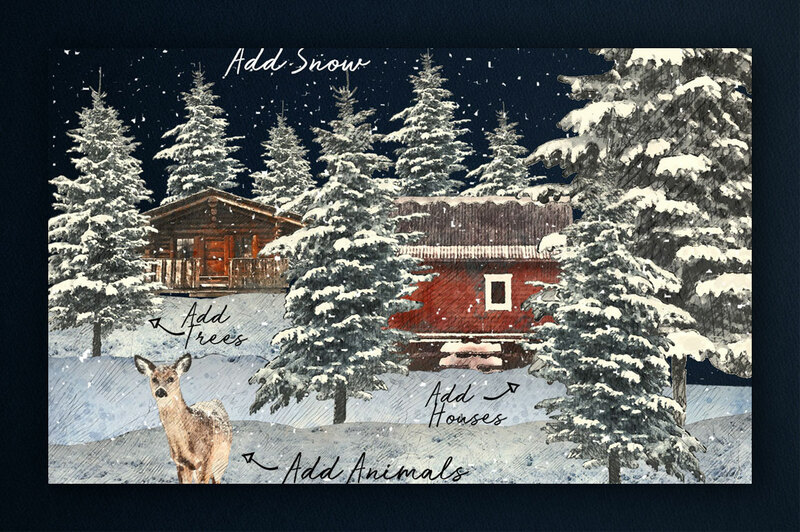 Resize, rotate, and easily combine multiple snowflakes to create a fairytale trickle. 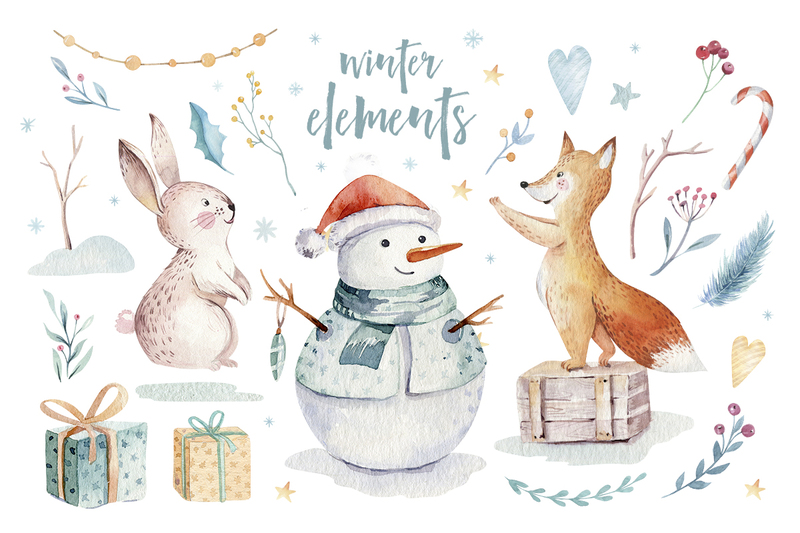 This fuzzy pack allows you to invite the diamonds and crystals into your wintry designs! 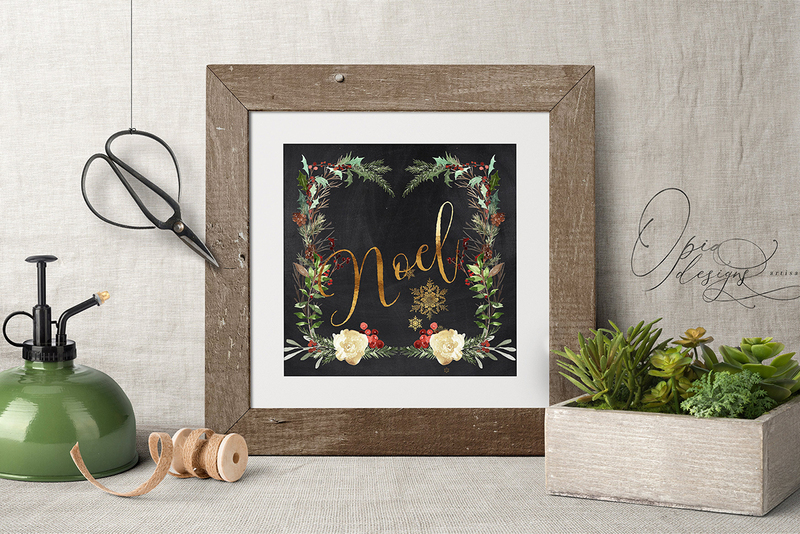 Every picture is unique and each snowflake framing brings an individualized glitter and sparkle. 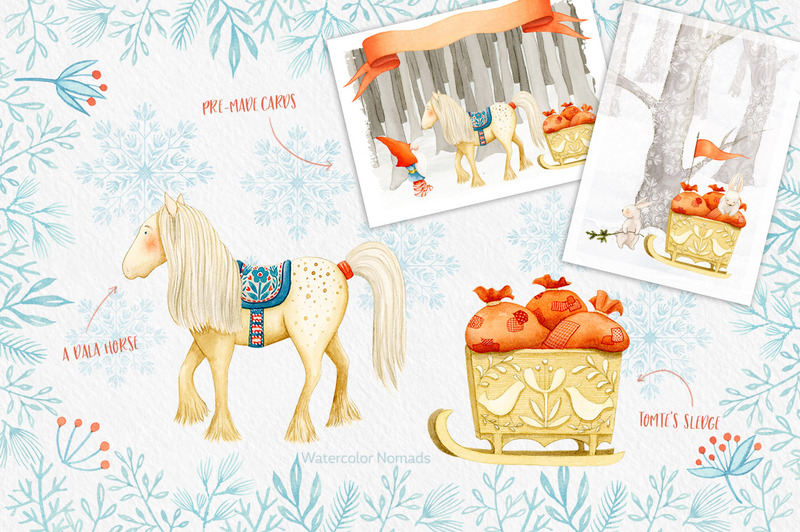 Use the splendid pack of snow decorations for your winter designs and Christmas cards! 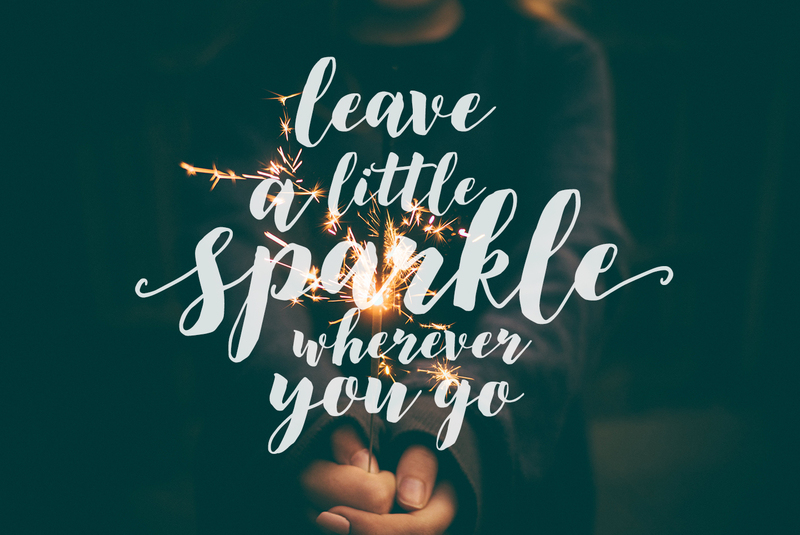 Add glittering effects and glistening illumination to your pictures. 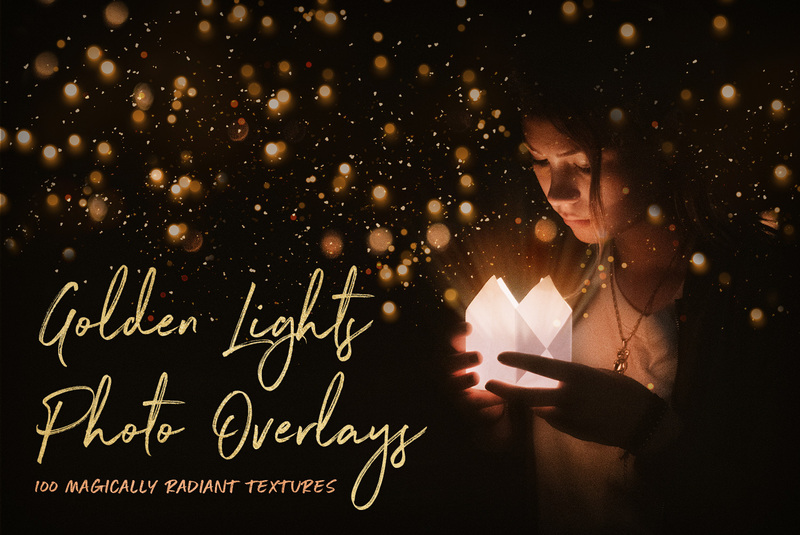 Here you’ll find 100 textures with the sea of golden lights and a variety of shapes and textures: galactic bands of light, glowing nebulae and color-rich explosions of shimmering particles, etc. 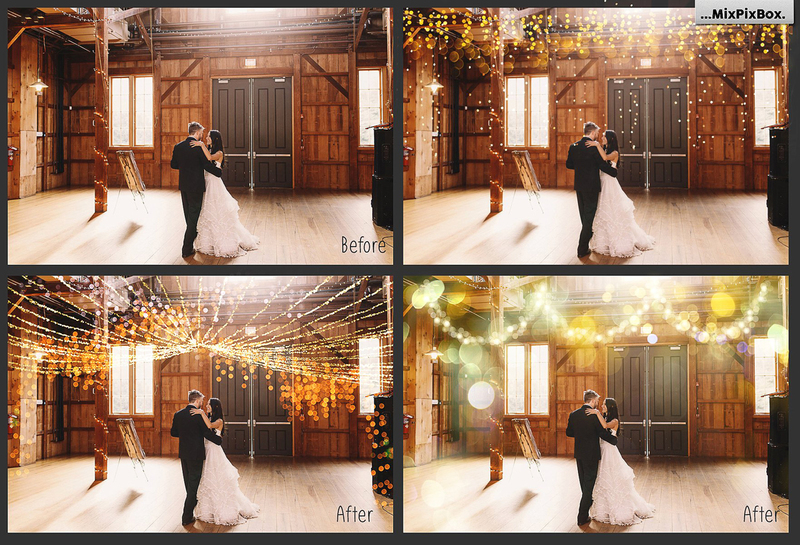 Just put these .JPG files on your photos, pictures or texts, adjust the lights in shape, size or orientation – and voila! 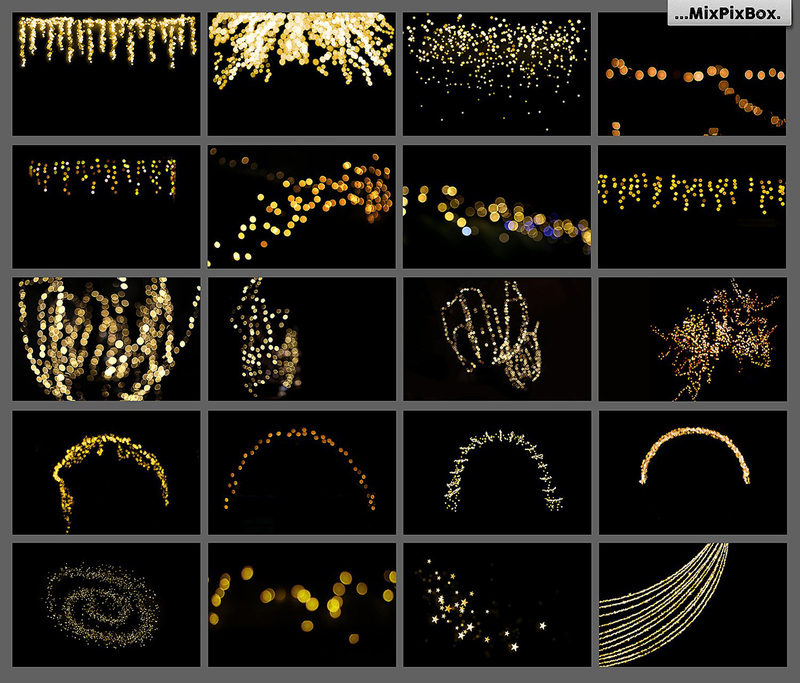 A burning fireworks display for New Year, a radiant viewing experience for your photos, a dynamic dancing swirl for a party, and cozy Christmas sea of lights are ready. 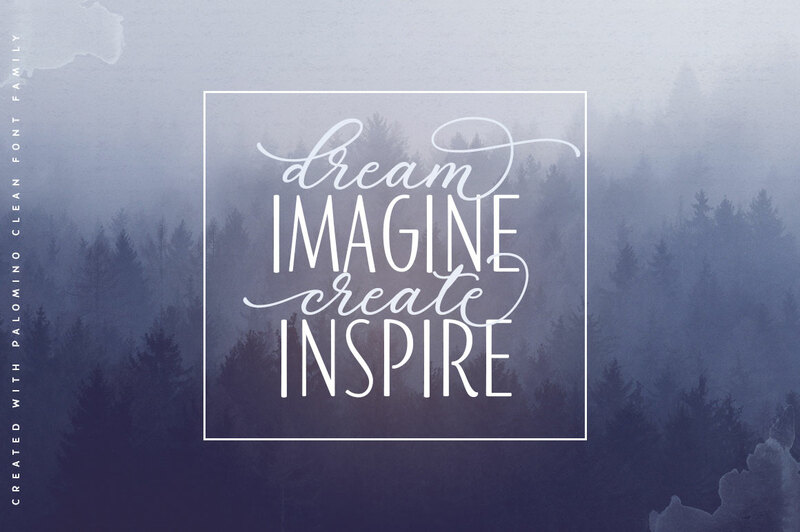 Anyway, you can make something different and involve your imagination! 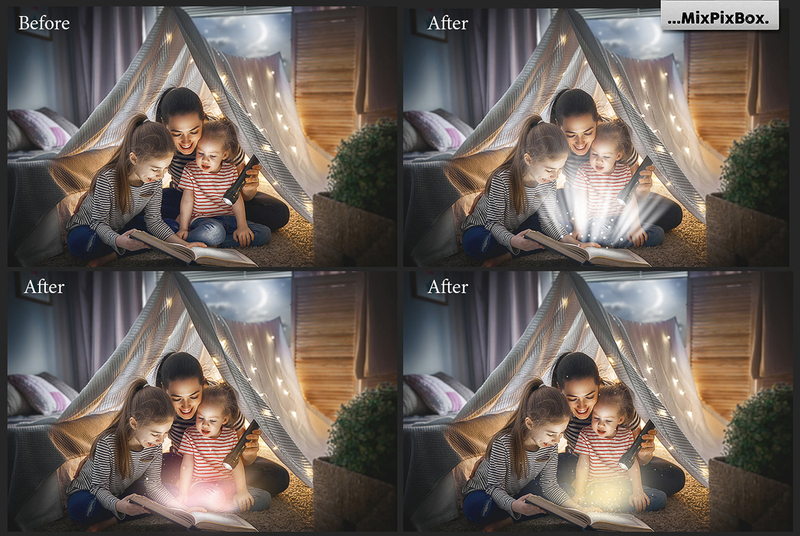 Illuminate your designs in just a few clicks: just drag them on your images via most popular graphics programs (Photoshop, Elements, GIMP, etc.) and simple as that! Expand your spectrum to a whole universe of color splendor, shape variance and structural diversity. 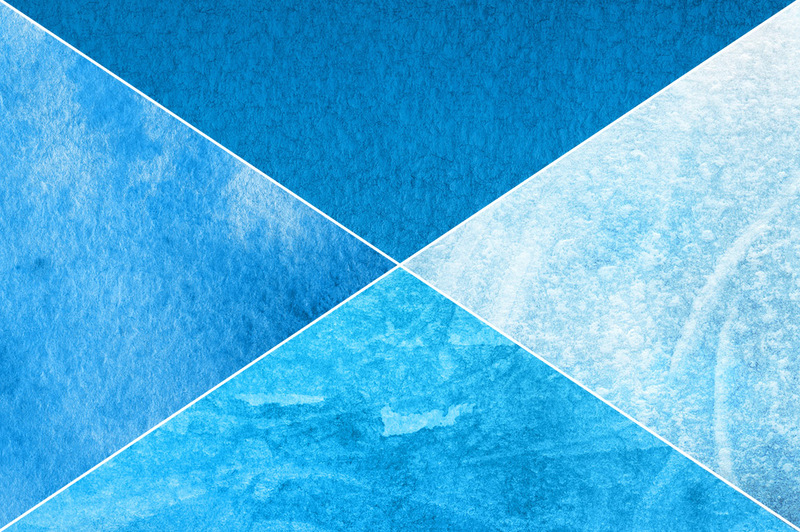 Paint falling and settled snow, as well as photorealistic frozen effects with this photorealistic​ high-resolution brush for Photoshop. 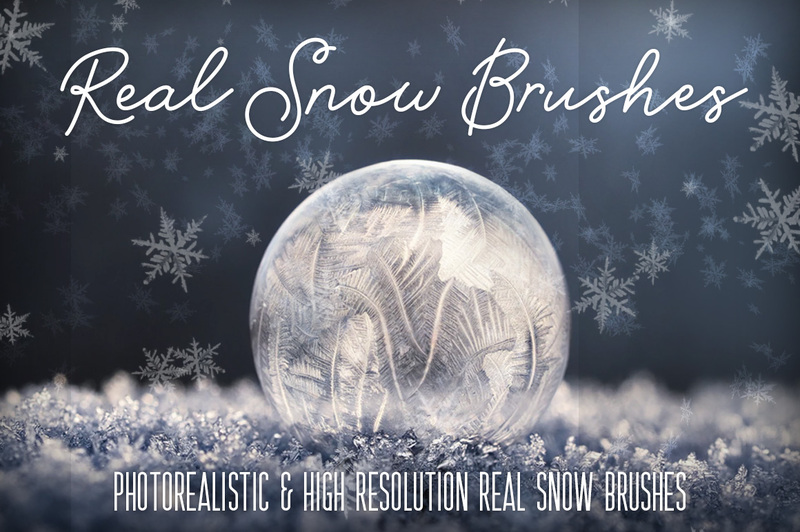 We used specially produced photographic material of real snowflakes to create the most photorealistic snow and frost brush possible. 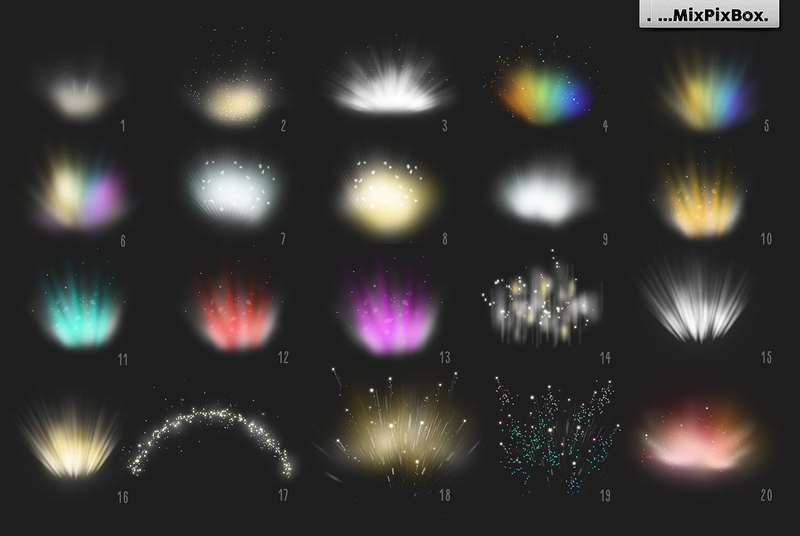 Different well-labeled brush settings simulate different types of snow and can be used to paint falling and settled snow, as well as photorealistic frozen effects. The download also includes an illustrated quickstart .PDF guide about the installation of brushes in Photoshop and special tips for good results. These brushes are compatible with Photoshop Elements, Photoshop CS1-CS6 & CC and were often described as a basic must-have for designers and photographers. 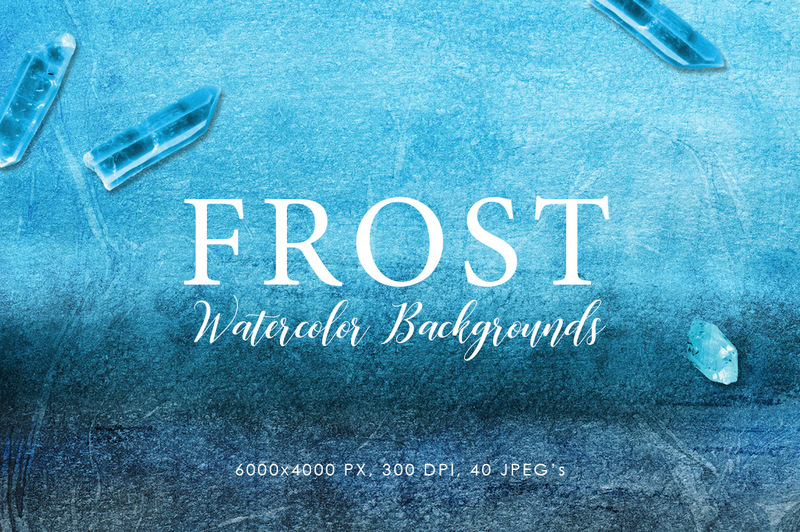 Glad to present to you this beautiful collection of Frost Watercolor Backgrounds! 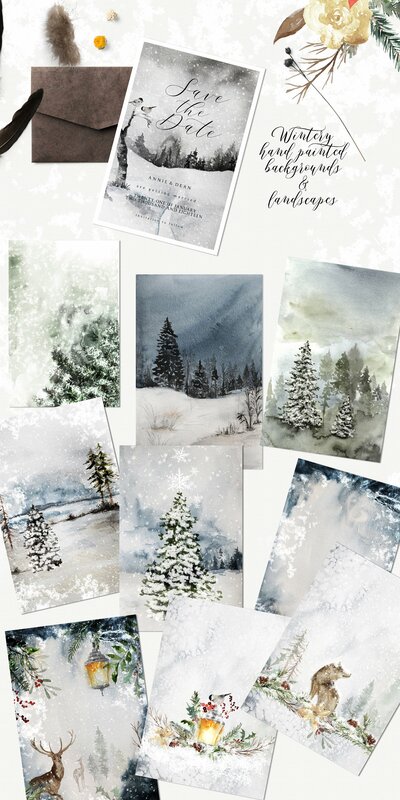 Beautiful, natural and modern looking winter watercolor images! 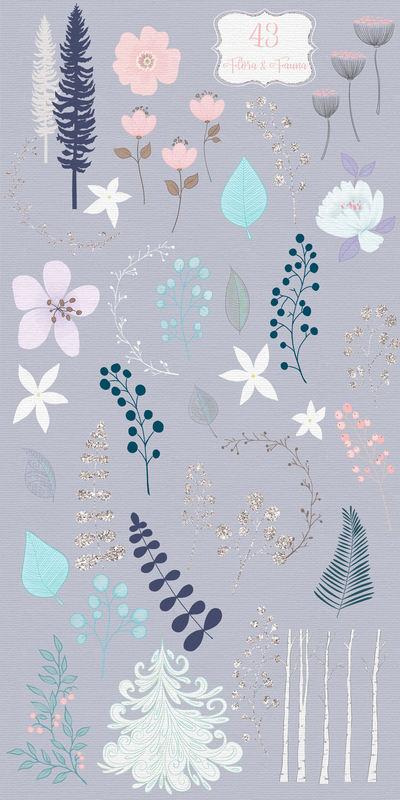 Perfect backgrounds to any kind of contemporary, print, web or social media project. 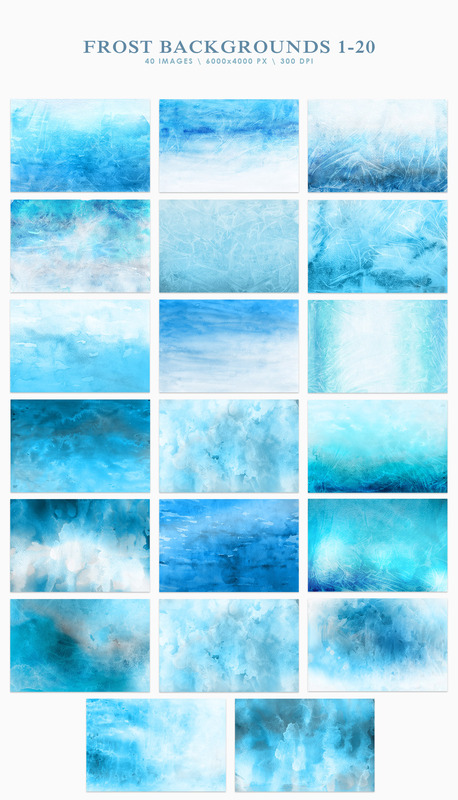 Classic clean and realistic hand-painted texture with the huge resolution! 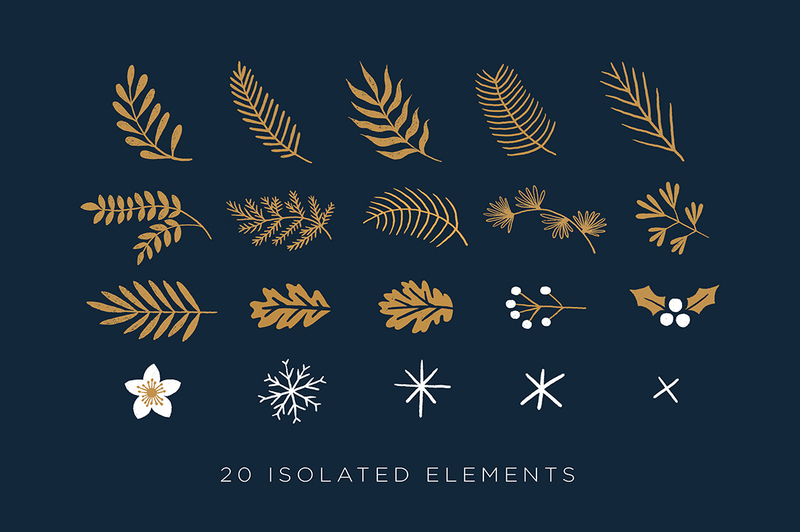 This kit is made up of 101 vector elements. 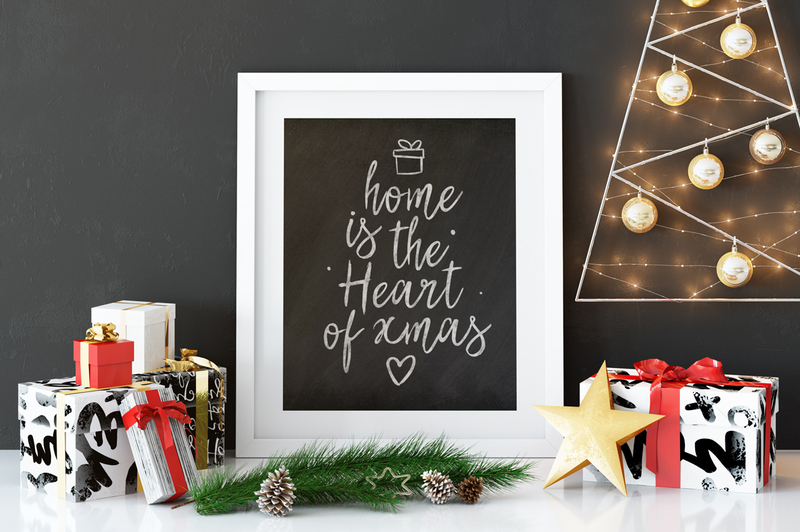 You will find everything from snowglobes, to santas to festive travel mugs to mistletoe wreaths. 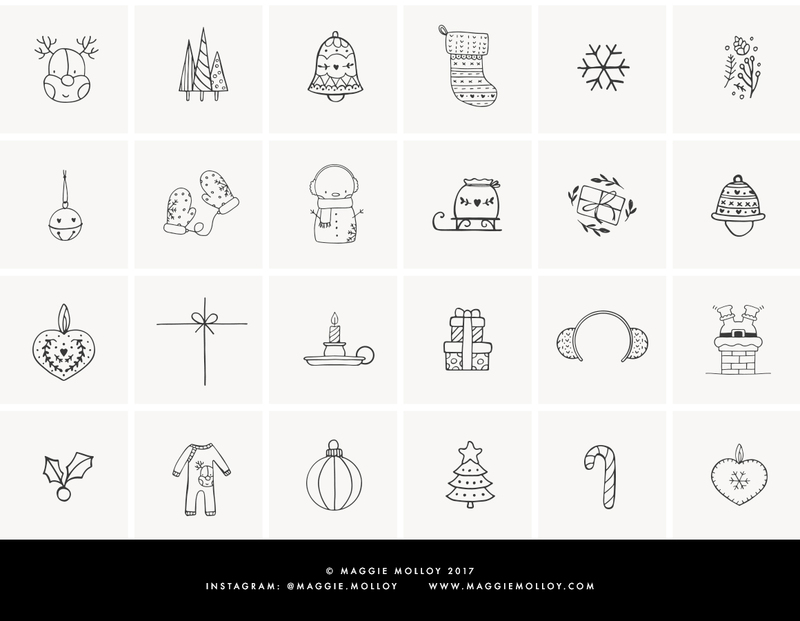 Dont forget to click on the image above to enlarge it and see every element side by side! 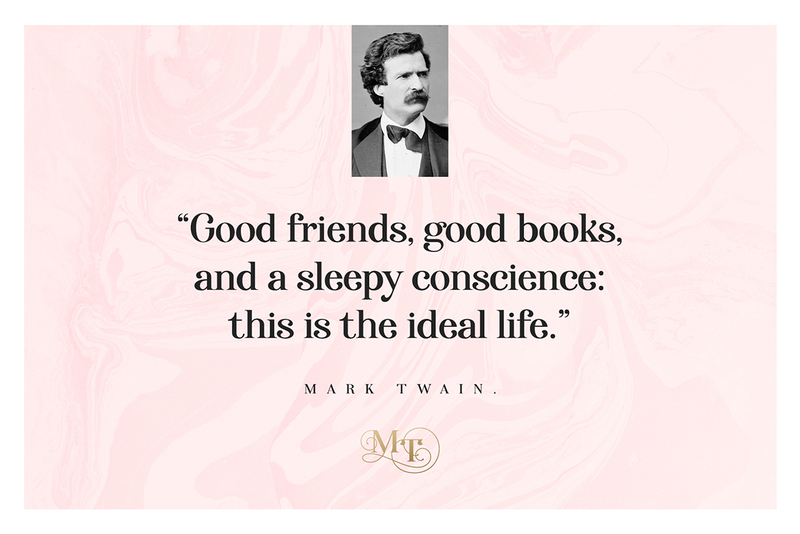 I’ve tried to keep the mix modern, fun and balanced so everyone can find something useful in it. 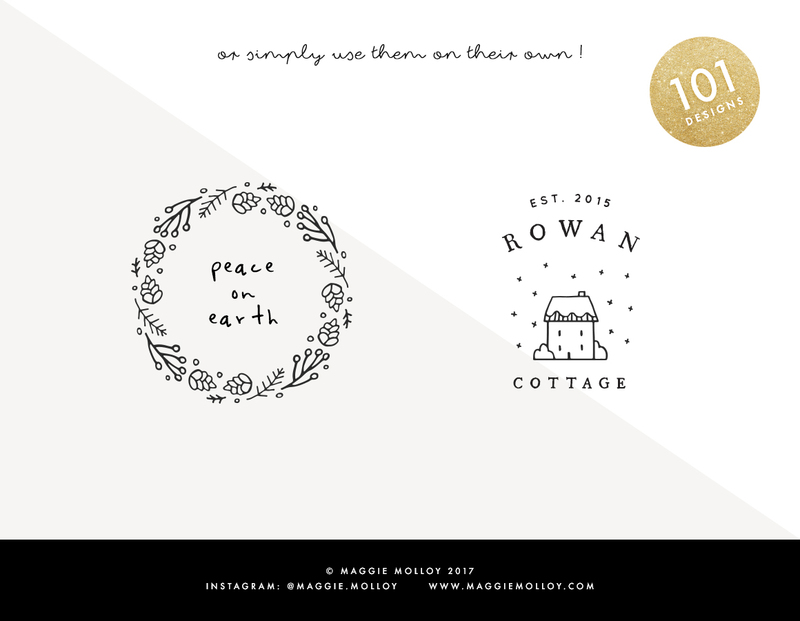 These little icons are great for custom & premade logo designs & even full branding projects. 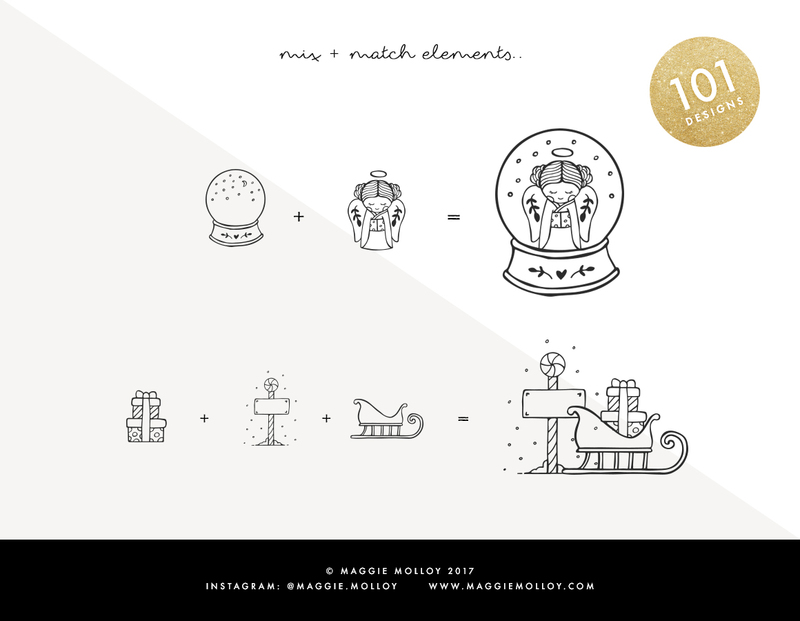 All the elements in the bundle come in infinitely scaleable EPS format. But dont worry if you dont have access to vector editing software, I’ve also included a layered .PSD file with each of the elements included as a custom shape. 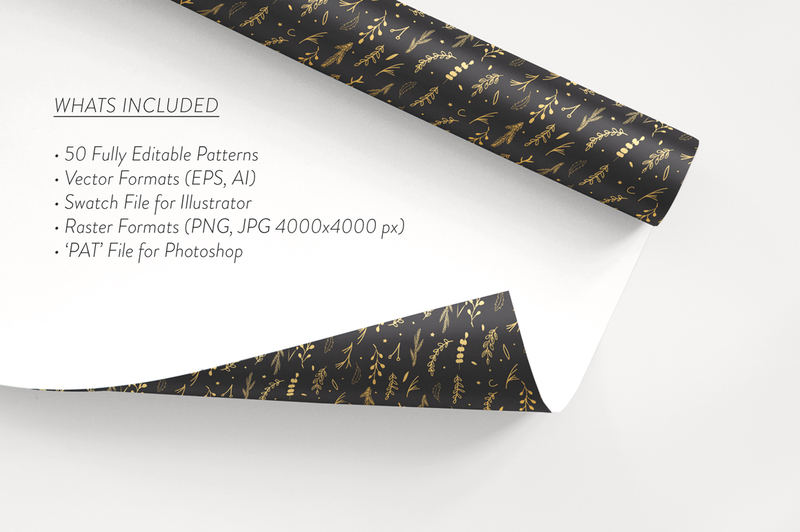 This means you can get all the benefits of vector files without owning vector software! Software compatibility: Adobe Photoshop CS1 (and higher). 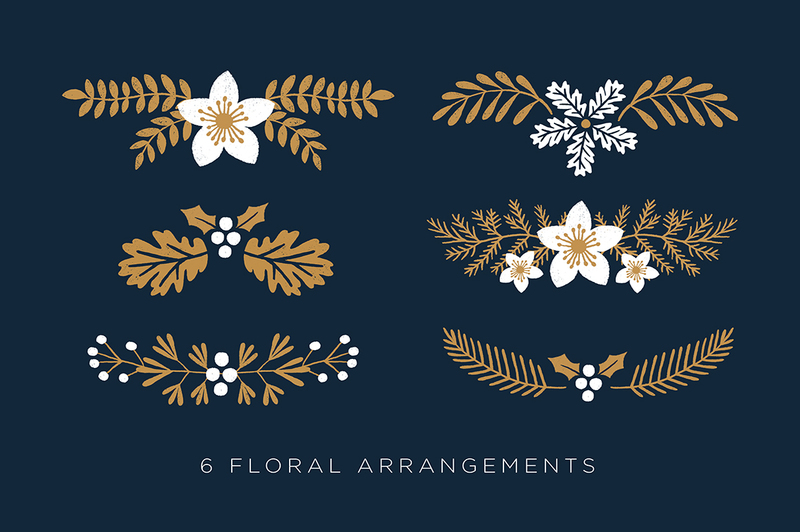 Introducing the Elegant Christmas Graphic Set – a graphic bundle packed with tastefully hand-drawn winter floral-themed elements and assets perfect for your Christmas design projects! 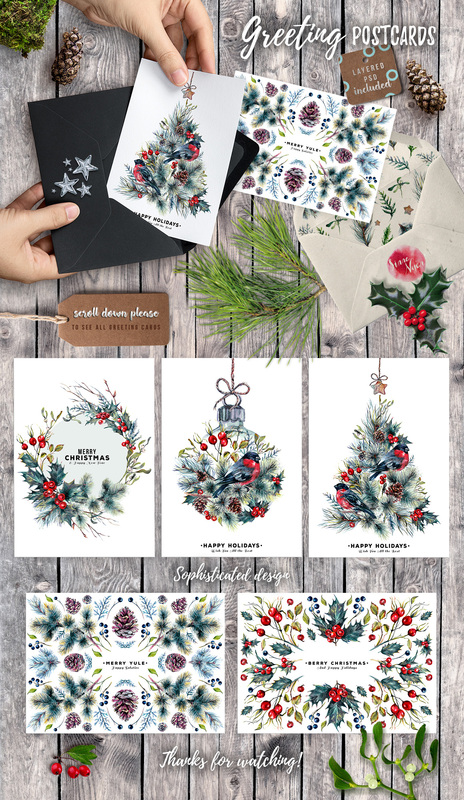 This set comes with different hand-drawn winter themed floral elements/arrangements, seamless patterns, backgrounds, and greeting card templates. 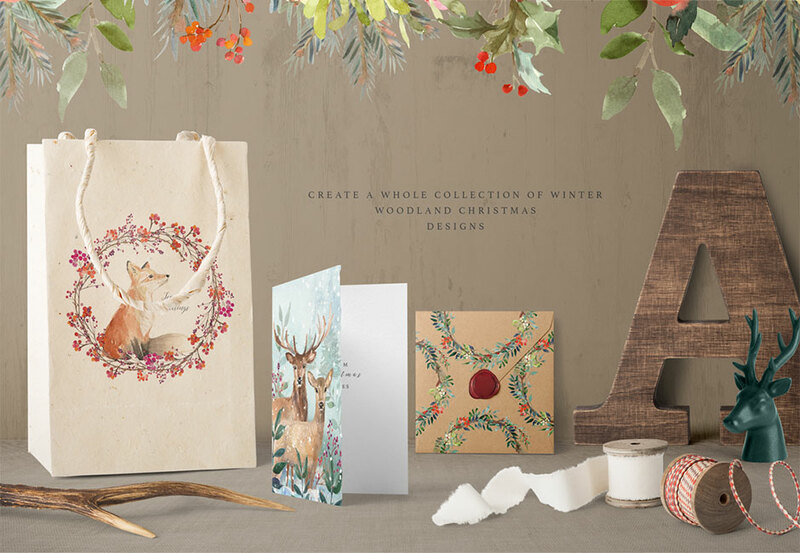 It’s perfect for creating personalised Christmas wrapping papers, gift tags, paper bags, packaging, stationeries, greeting cards, invitations, holiday social media posts, posters, flyers and a lot more! Not a fan of white and gold? Customise and tweak the colour combinations according to your preference. 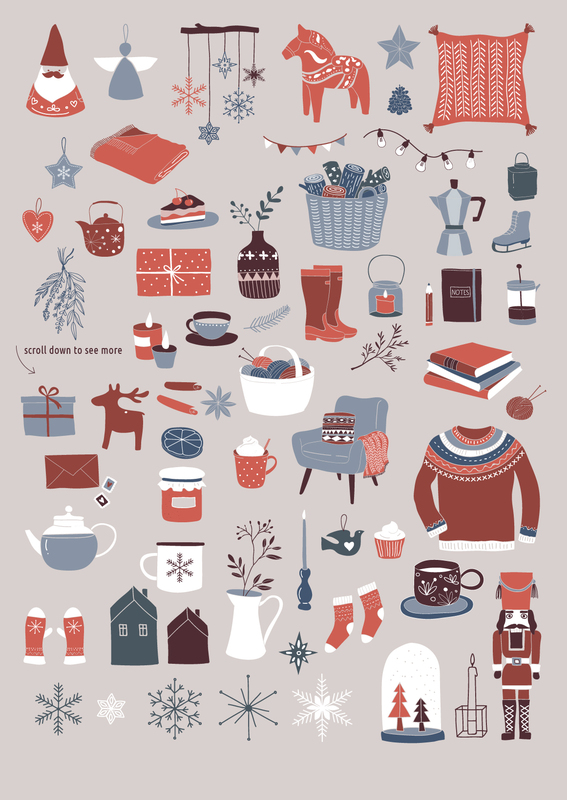 Get creative with the isolated vector elements, rearrange or create your own patterns/arrangements to spice things up! 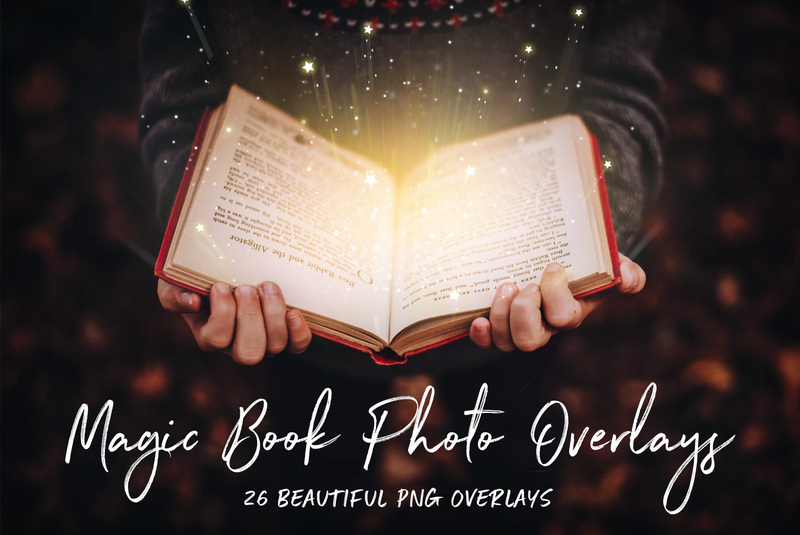 All .JPG files are saved at 300 ppi and RGB color mode. All .PNG files have transparent backgrounds. All vector files were created using Adobe Illustrator CC 2015 but were saved to Adobe Illustrator CS2 version and above. To open the .EPS and .AI files, you need to have Adobe Illustrator (CS2 or higher version) installed in your computer. The Christmas card templates are editable on Adobe Illustrator, but the texts are outlined to avoid font issues. Software compatibility: Adobe Illustrator CS2 (and higher) .JPG and .PNG files will work with most graphic software., .EPS files will work with a variety of programs such as Adobe Photoshop or Illustrator, Sketch, InkScape, Affinity, Corel Draw, etc. 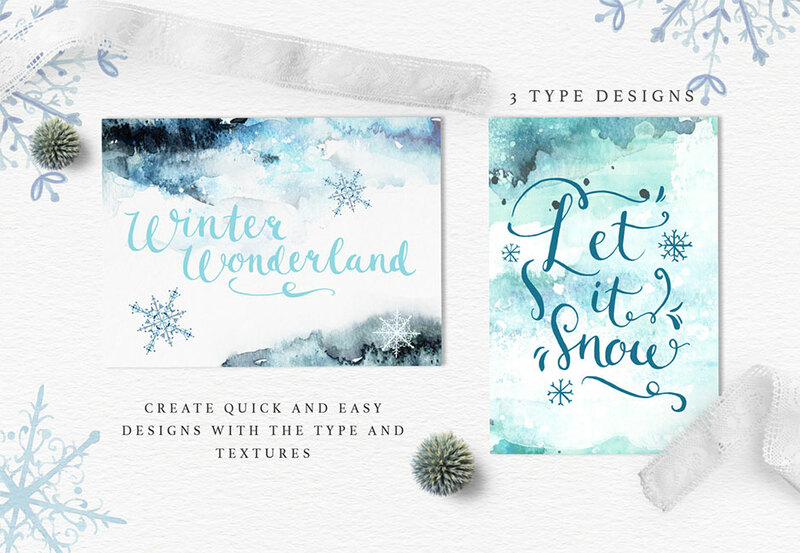 This set of high quality hand painted watercolor winter elements. 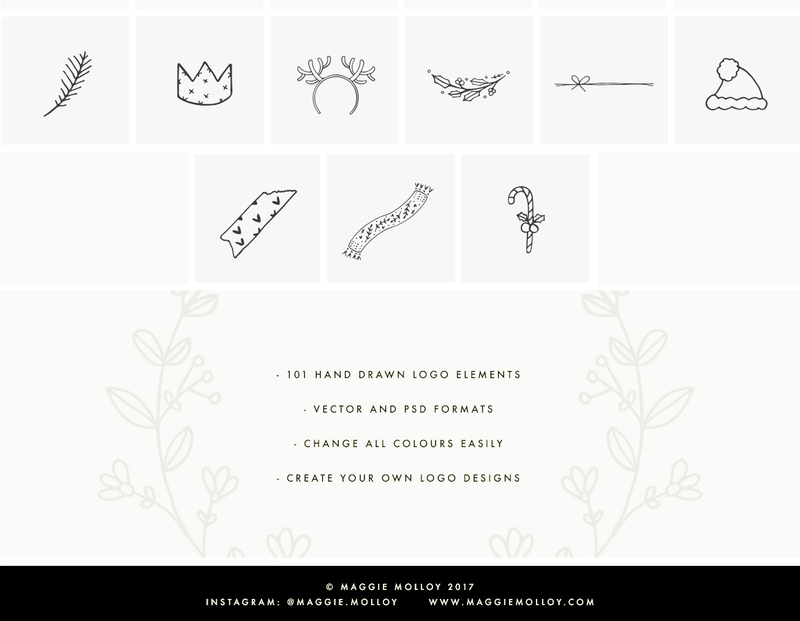 Perfect graphic for DIY, invitations, greeting cards, quotes, blogs, posters and more. 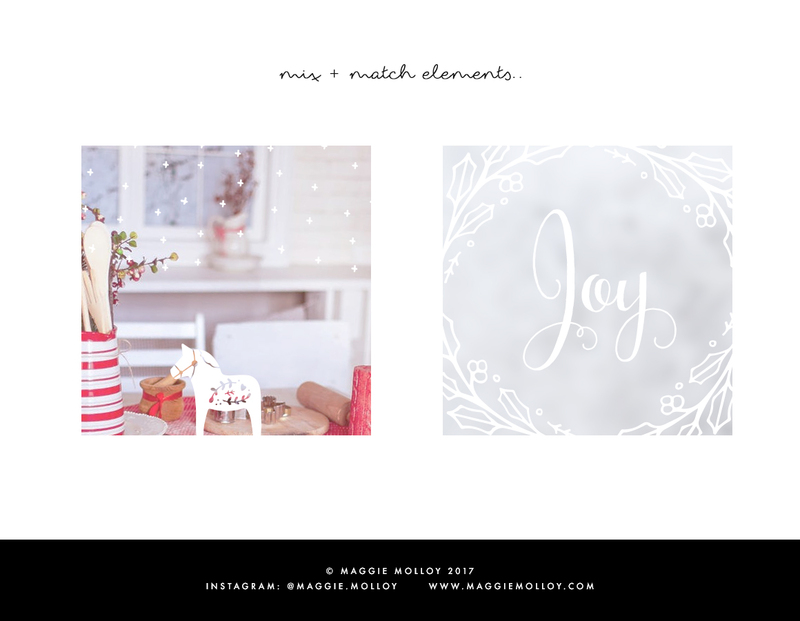 I’m so glad to introduce you a festive Christmas collection! 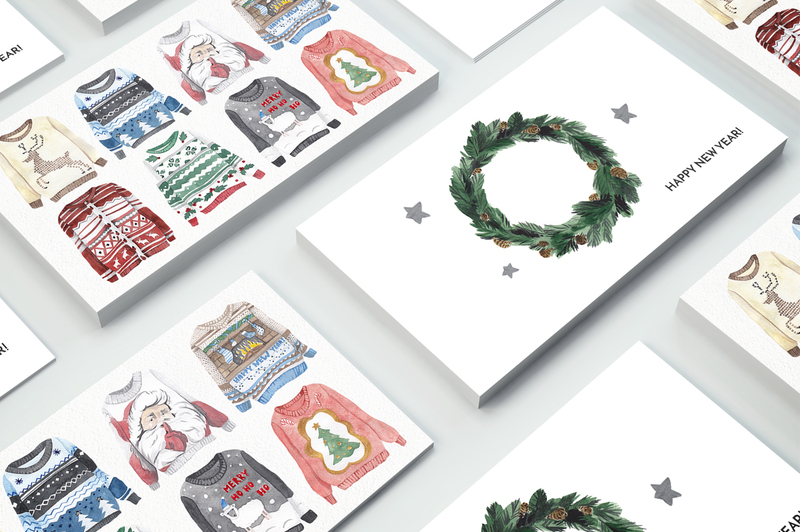 This is a collection of traditional ugly Christmas sweaters and lovely decorative elements, such as gifts, socks, hats of Santa, pine twigs, candies and omela + minimalist card templates. 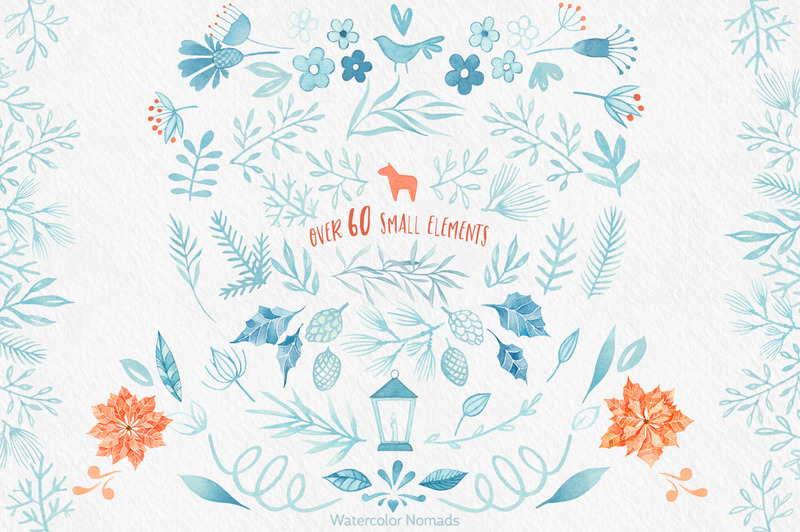 All watercolor illustrations were painted on paper, then scanned at high resolution and cleaned to create your clear end products. 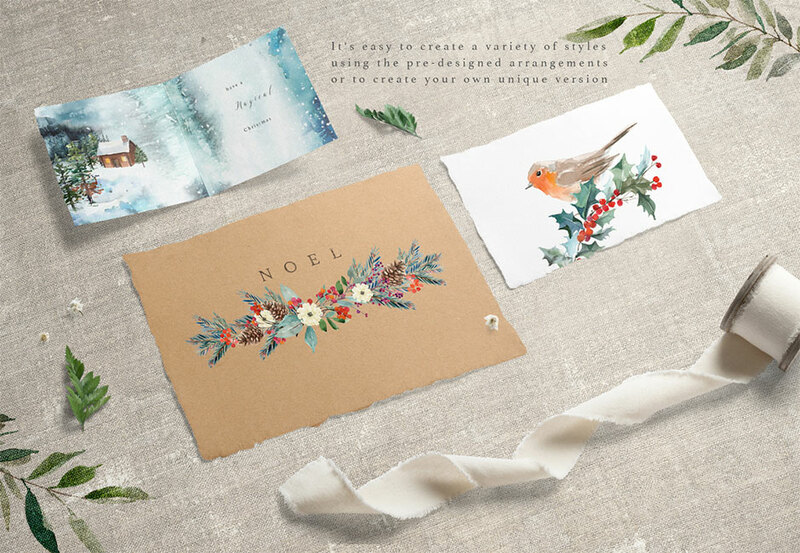 Perfect for invitations, Xmas decoration, Noel, Happy New Year projects, greeting cards, posters, wall art, calendars, surface patterns, scrapbooking, gift wrapping paper, textile design, advertising, social media, packaging, cases, logos, quotes, blogs, web, banners and for many, many more. 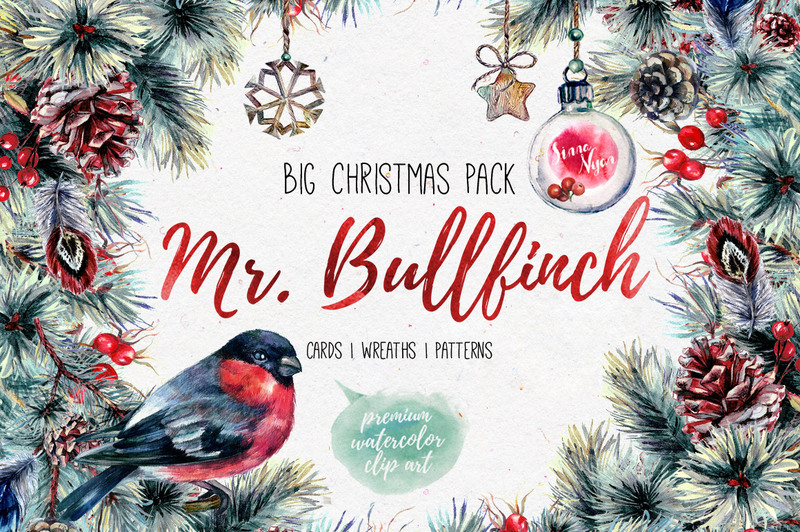 With cheerful Christmas feelings let me introduce to you Mr. Bullfinch and a Spirit of Christmas Watercolor Clip Art Pack! 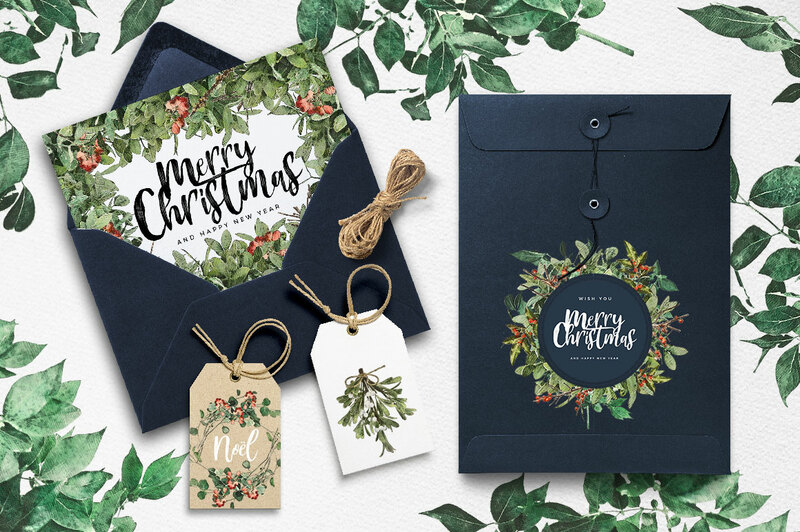 This pack can be used for different purposes: to create trendy posters, cards, t-shirt prints, festive invitations, phone cases, logos, packaging, fabric prints, websites, tags, badges, branding identity, stationery and more! 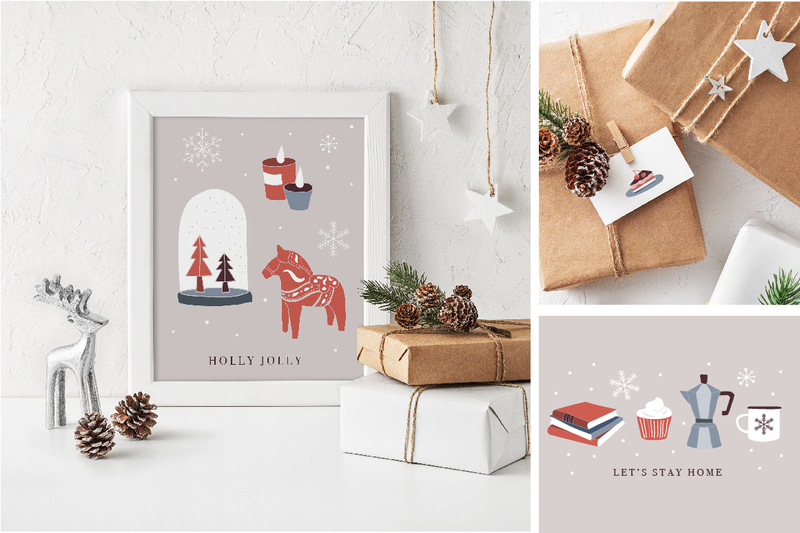 All items are created with the fondest memories of festive emotions from the bottom of my heart. 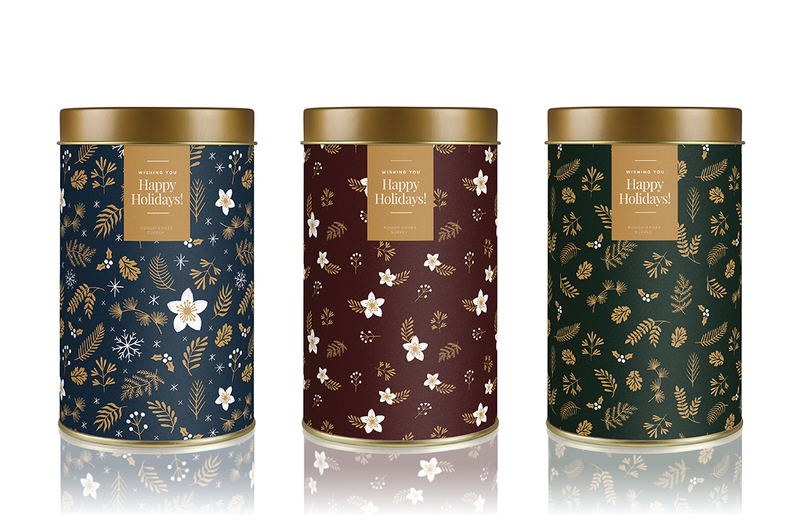 Add a piece of Christmas happiness to your holiday projects! 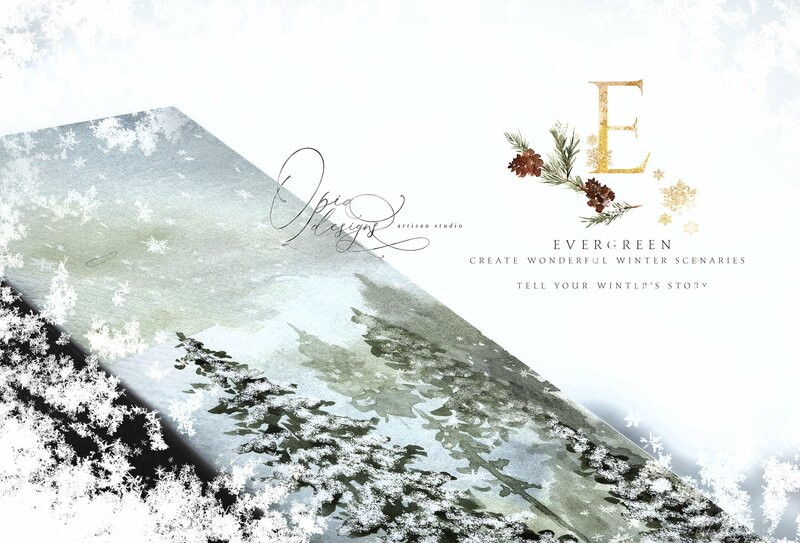 Wish you a happy creation! 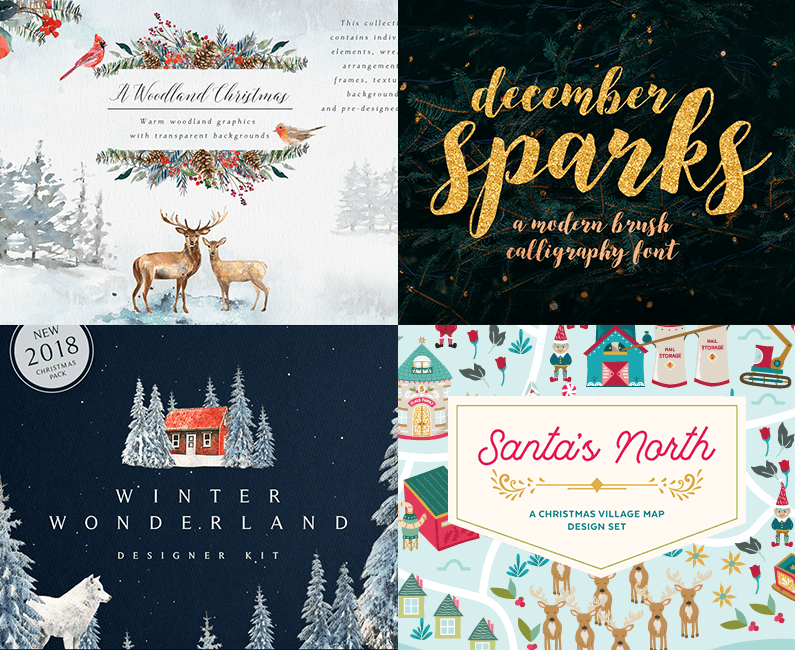 This bundle brings you the best artistic, hand-crafted resources that the design world has to offer. 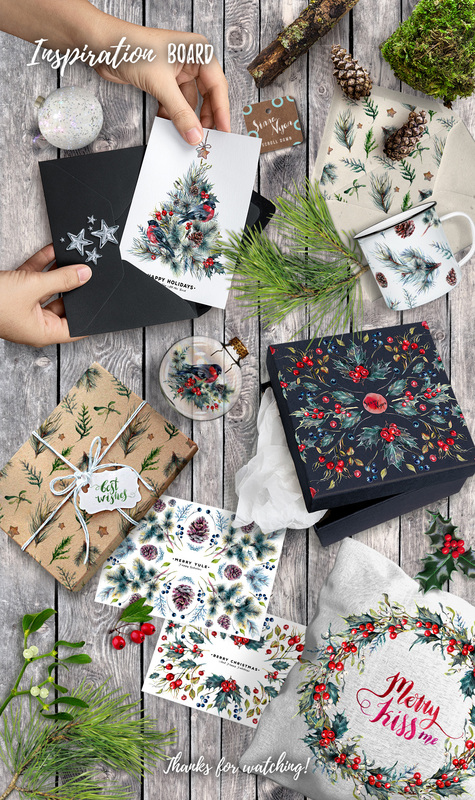 We’ve teamed up with designers like Julia Dream, Twigs and Twine, Denise Anne, My Creative Land, and many more to organise an unbeatable bundle of incredible Christmas products! File size is approx 8.71 GB (10.9 GB unzipped), split into 20 parts. 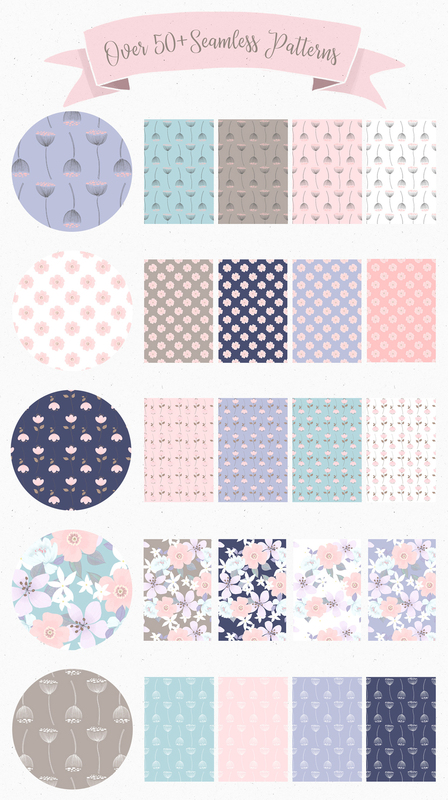 We've also included 1 large downloads containing all 20 designers. WOWZA!! What a beautiful bundle! So happy I got that “last chance” email and looked over this one more time. Thank you DC and designers! BTW, would it be too much to ask for a reasonable sized image for this and every other bundle? I like to save a pic with the file so I know which bundle it is. Thank you! Thank you so much for taking the time to leave us such an awesome comment and we’re super glad you got to grab your copy too! 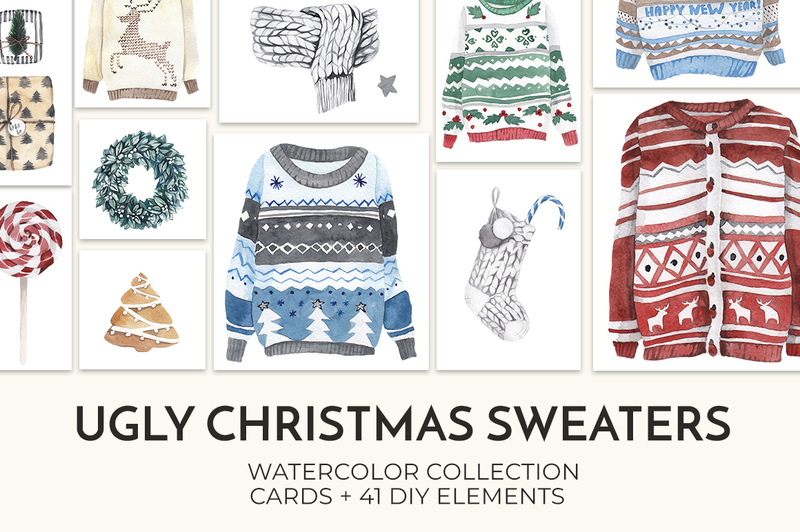 This Bundle does it all for my needs for Christmas Greeting cards. Yay we’re so glad that you love this bundle Bonnie and hope that you get great use out of all of your new resources! I was intrigued by your offer. My intrigue turned to disappointment. 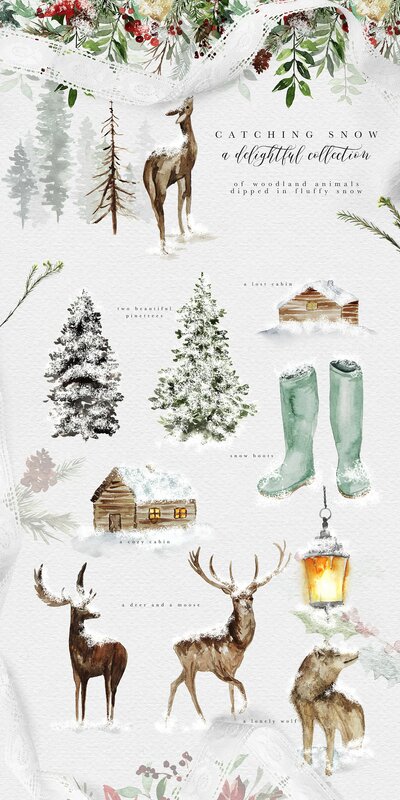 Lots of wintry scenes, Santa Claus. elves, animals, cottages, card prep, etc, but nothing about our Saviour and the true meaning of Christmas. What about Jesus? What about Bethlehem? What about Bible references?Approximately,70% of Americans call themselves ‘Christian’, yet many are so concerned about offending a small percentage of the other 30%. I am not offended by Hanukkah, Mawlid el-Nabi, or Solstice references. There are still people like me that want our friends and relatives to ponder what we believe is important about Christmas, even though we are not politically correct. So much of modern ‘Holiday’ advertising shows Christmas trees, Christmas presents, and even Santa Claus, but dare not mention the word ‘Christmas’. 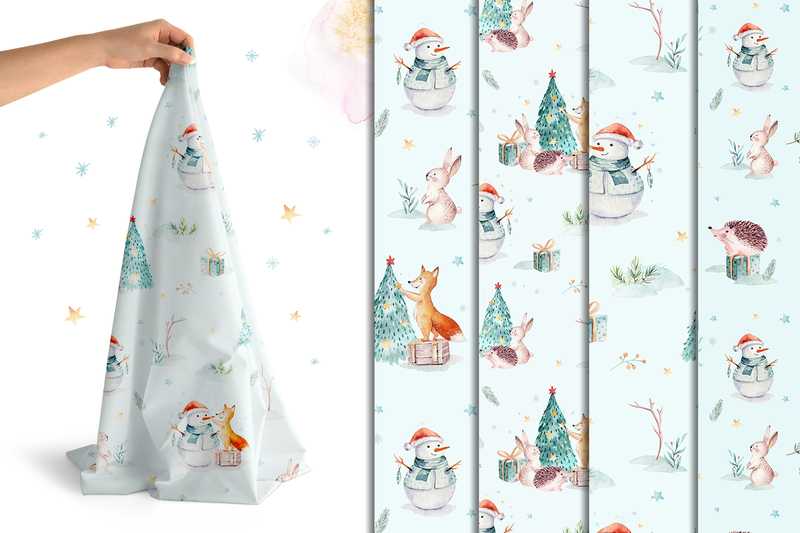 Thank you for presenting this Christmas bundle because it is truly magical, but I would be interested in something more ‘Christmasy’, if I may coin a phrase. Merry Christmas. Thank you so much for your comment and for your feedback! We are so sorry for any disappointment caused being unable to find any Christian themed resources in this particular bundle. As our community is so diverse and are spread across the world, we try to ensure that our bundles can appeal to the vast majority of our community so my sincerest apologies if this bundle s not quite what you were hoping for. We really appreciate receiving your feedback Mark so thank you so much for taking the time to reach out to us and this will be suer useful for us to ensure that our bundles are better catering to our community’s needs! 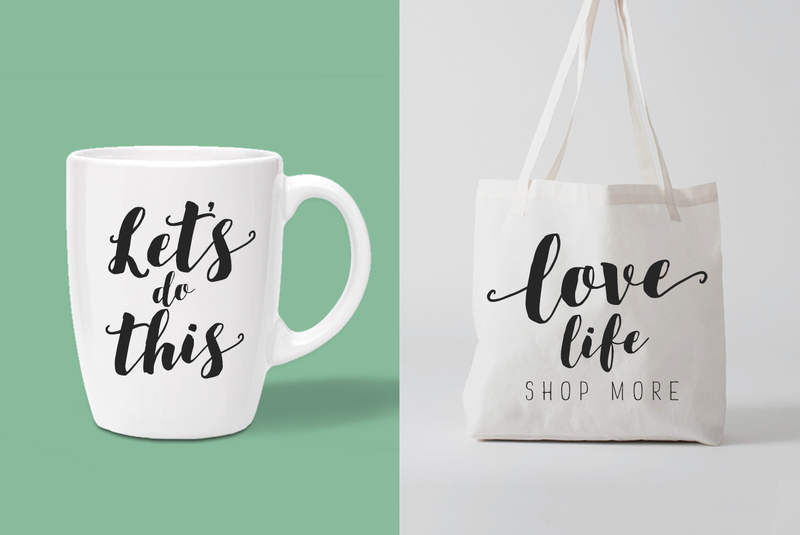 Hi this is a fab bundle. 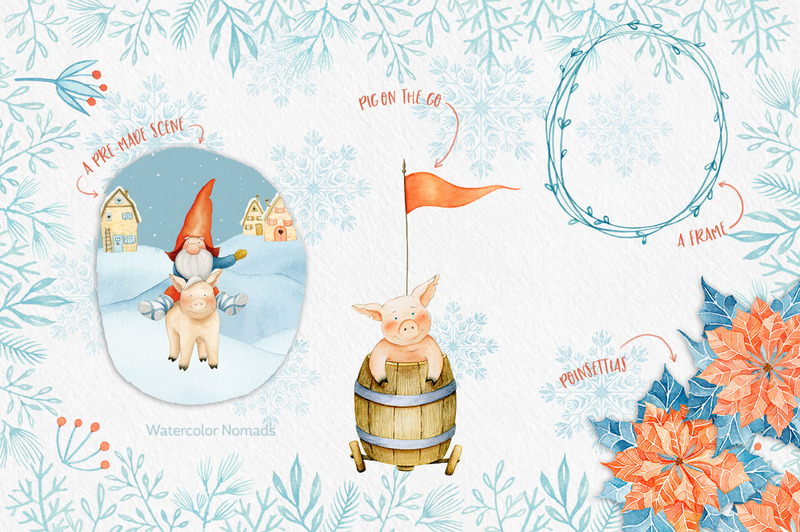 I wanted to know can I use it for greeting cards to sell. Also will you also have design for eid or Diwali. Thank you so much for your comment and we’re so glad that you love it! Such a great bundle, and a great deal! I’m beginning to learn (and appreciate) more and more the hard work, extra hours and effort the Design Cuts team puts in behind the scenes to put together all these fantastic elements. Then you try your hardest to include something to make EVERYBODY happy: a nearly impossible task. 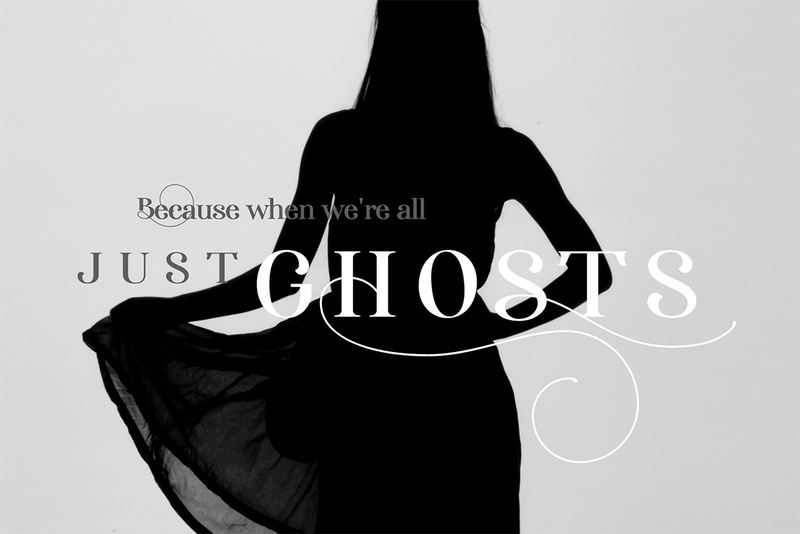 At the end of the day, you all always make it seem so effortless….but I’m sure everyone knows better. 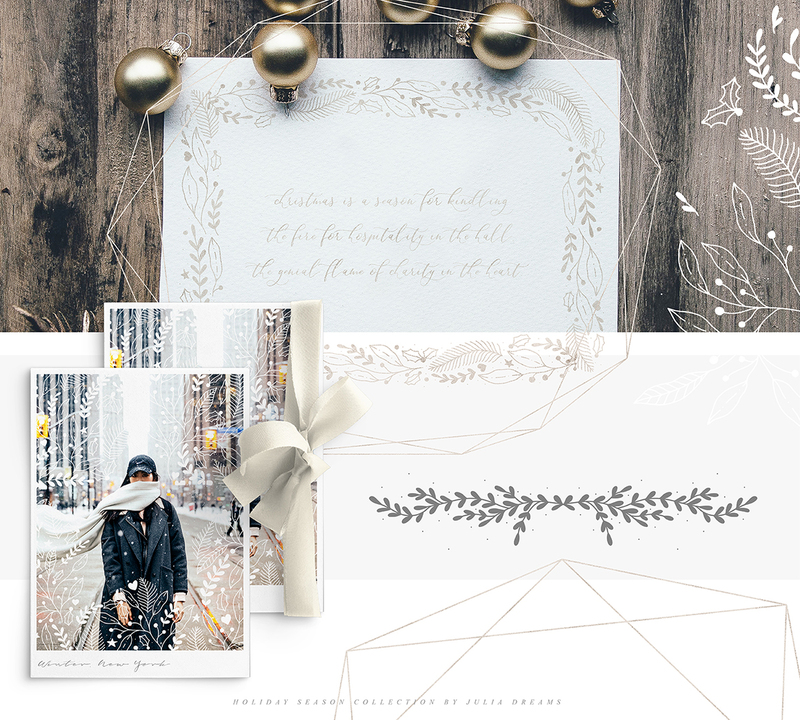 Thanks, Design Cuts team, for yet another fantastic holiday bundle, another great year, and a most appreciative hug from everyone who loves you (myself included), and everything you do! Thank you so much for your comment Richard and your kind words really mean the world to us! I would like to purchase HOWEVER …I am on a data plan for internet (believe it or not – I am very rura) . 10GB would cost me a lot. Is it possible to order this and download portions over time, as needed? And for how long would the links be available to me? Thanks for the info. Great package! Thank you so much for reaching out to us and we’re so sorry to hear that you are on a data plan. Rest assured we do not expire your downloads so you can download these at your own convenience. I have also popped you over an email to help you further with this! 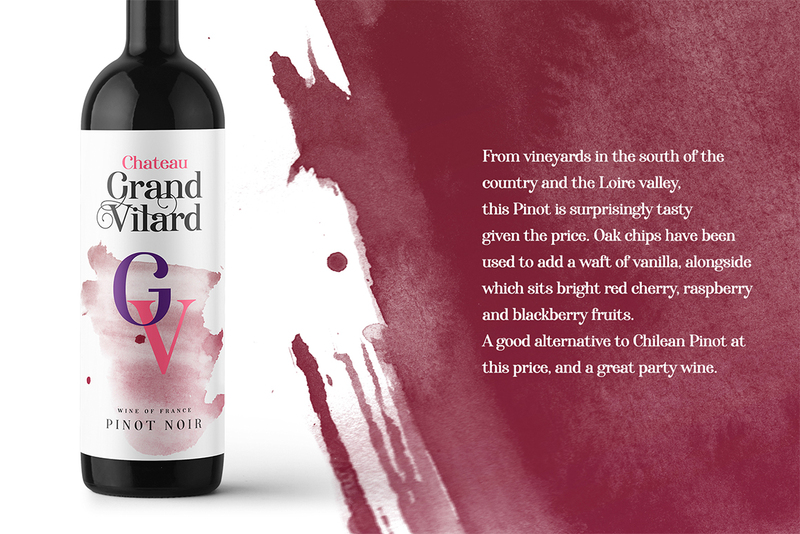 Thank you to all involved in the creation and production of this package. It is an awesome deal. I have just downloaded it and am ready to have some FUN!!! I appreciate your passion and diligence to serve up only the very best to your community. Thank you so much for taking the time to leave us a comment and we’re so thrilled to hear that you are ready to have lots of fun with all of your new resources. Please, Annabel can you help me a little bit ? 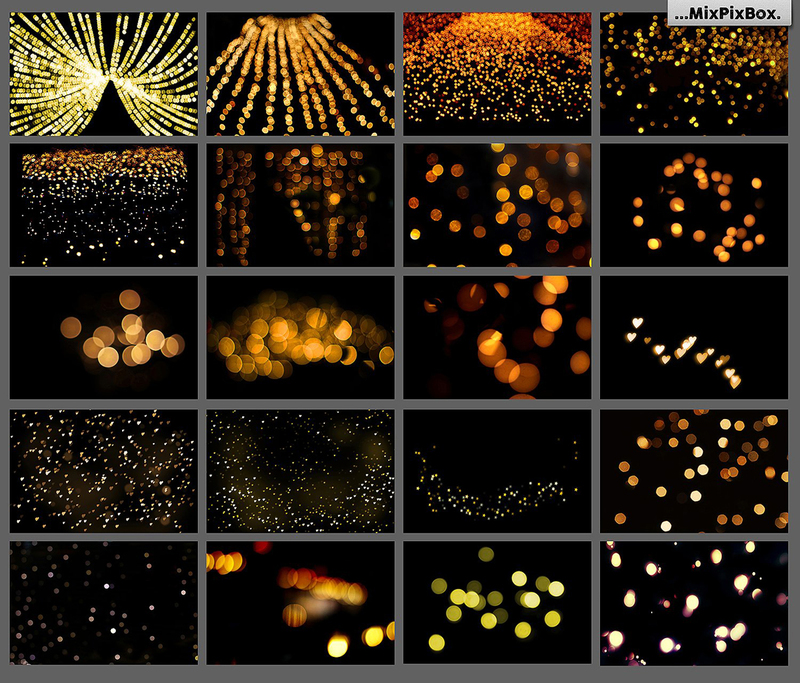 In the Winter frame’ s set there is a directory “100 Golden Lights Photo Overlays”. 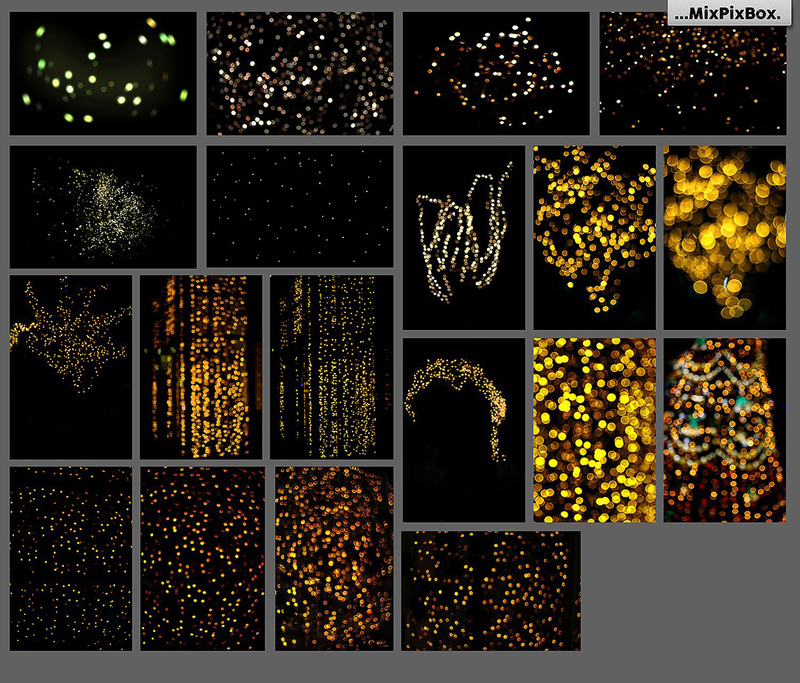 In it, I would want to use these “golden ligt” files, as on the photos of example. I mean : put over one of my photos the golden_light_42, for exemple. BUT, these files are not in a png format with a transparent background. Instead, they have a black background. 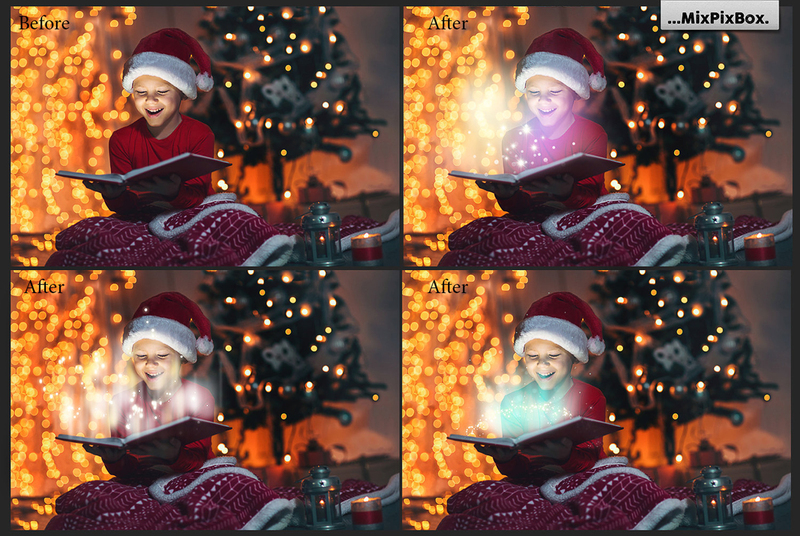 Is there a particular way of using them, or does it belong to me to select all the black with the magic tool and delete him ? 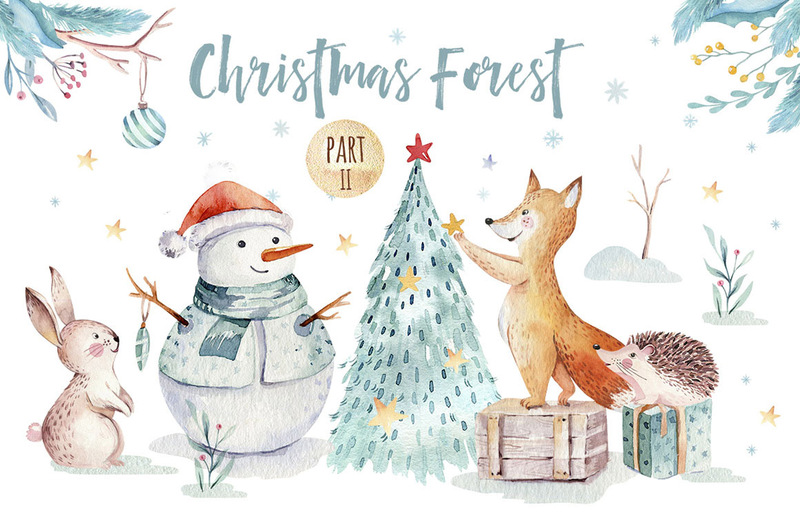 It’s awesome to hear that you are having so much fun taking your new Christmas bundle for a spin and I hope that you have great fun working with all of your new resources! 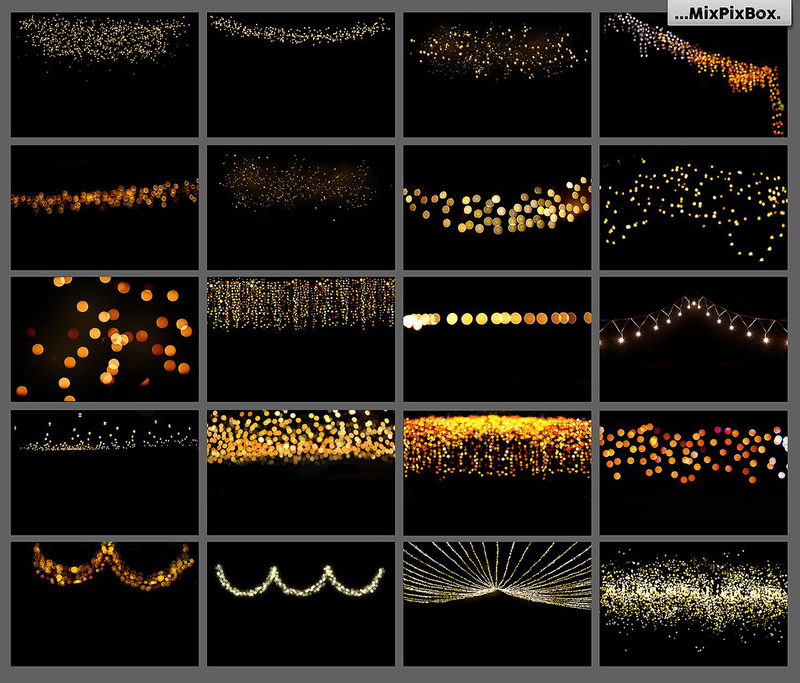 I’m so sorry for any confusion caused by your 100 Golden Lights Photo Overlays having black backgrounds but rest assured, I can certainly help you with this! 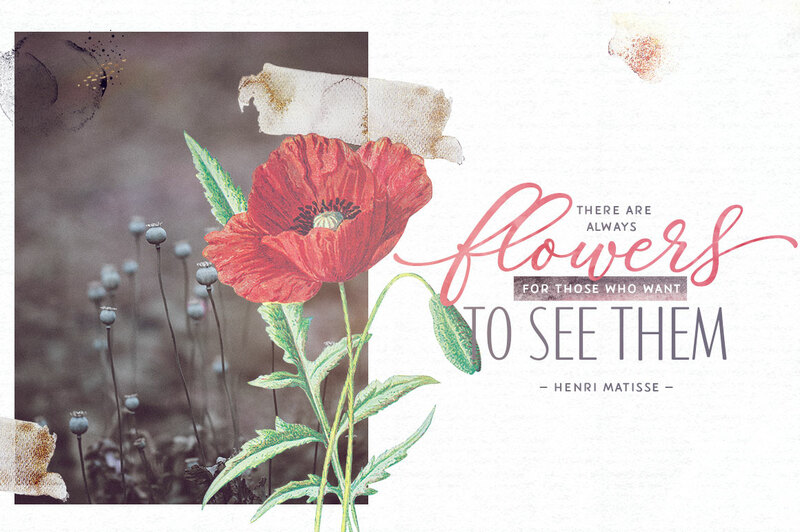 So to apply your overlays to your photos, create a new layer for your overlay and position on top of your image. 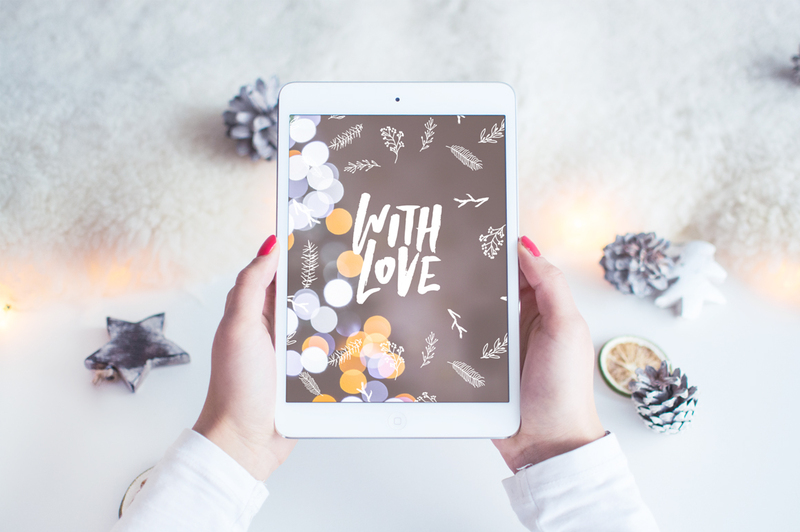 Change the opacity setting of your overlay from Normal to Screen and you should see your image appear through the overlay with the overlay design applied. 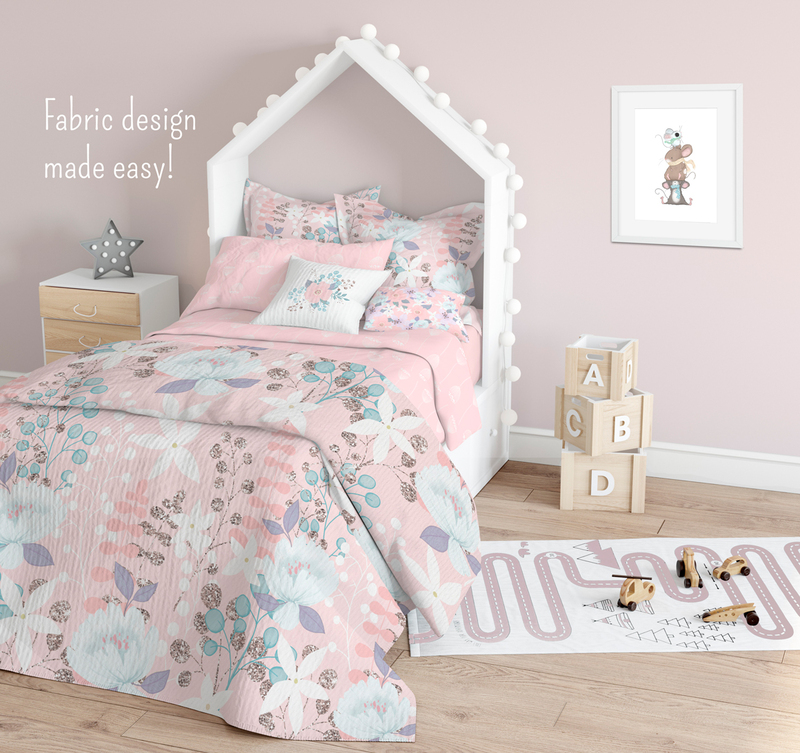 I have also popped you over an email to be able to go into further detail on this so I hope this helps Polly 🙂 Happy designing! I SO want this bundle!!! There’s a “2018 is coming” in the middle of all that snow! Thank you so much for your comment and we’re so sorry to hear that these are not quite what you are looking for, for your particular projects. We hope that you are able to find some great new additions to your resource collection in some of our other current Bundle and Black Friday deals and if there are any packs that you are looking for in particular, please do not hesitate to pop us over some links and our Product Team would love to check them out! Waouh !! Il m’a fallu pas moins de deux jours pour explorer toutes les ressources de ce pack absolument incroyable !! Merci mille fois pour ce cadeau merveilleux ! Je vais essayer de tirer le meilleur de tout ce que ces géniaux créateurs ont fabriqué pour nous !! 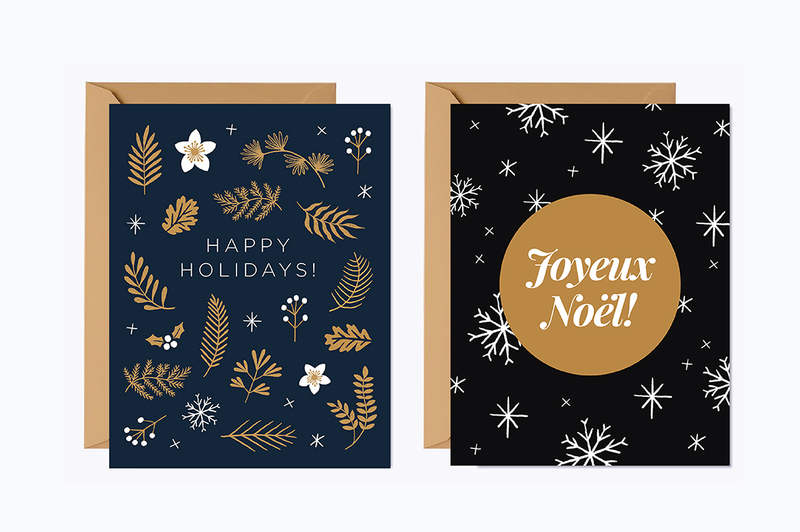 Je vous souhaite à tous de joyeux préparatifs de Noël !! 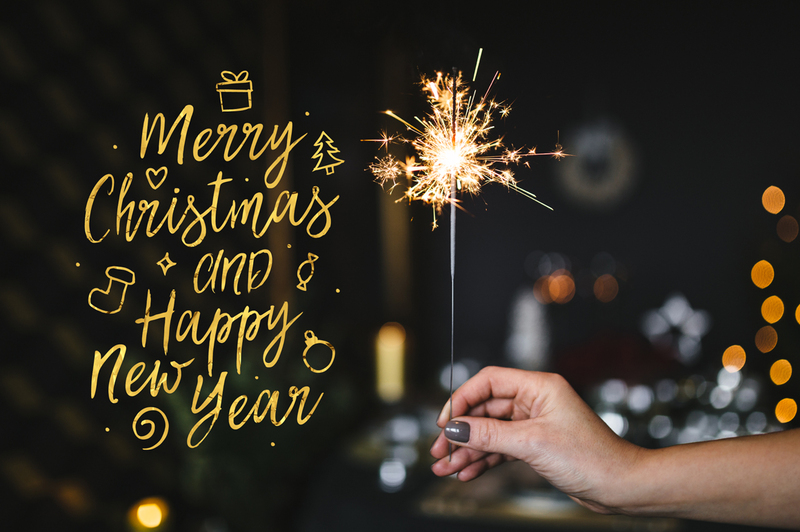 We hope that you get lots of great use out of them and we hope that you have a lovely Christmas too! As a nice Jewish girl living in sunny Santa Monica, I keep coming back to this bundle. I am so in love with it! 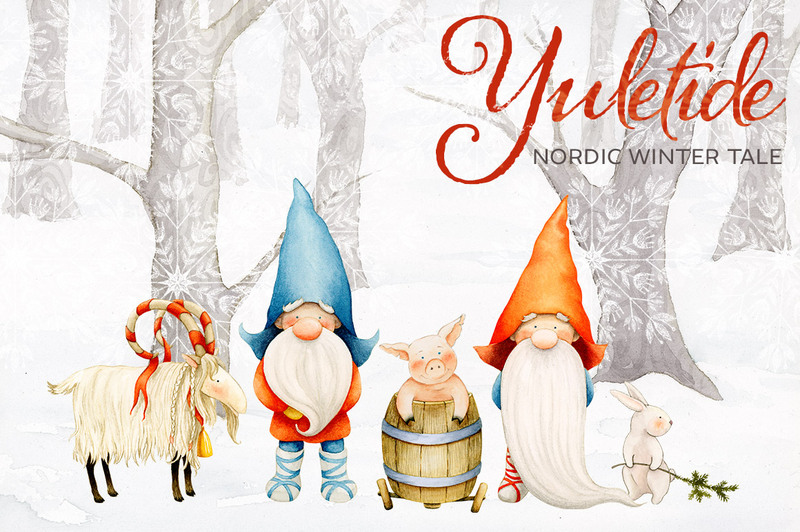 I love the Nordic Winter Tale. Wish we had MORE images from stories which are NOT so modern. So many wonderful folk and wonder tales. It’s not just the subject matter, but the delightful artist’s style. Then there’s frost and snowflakes. 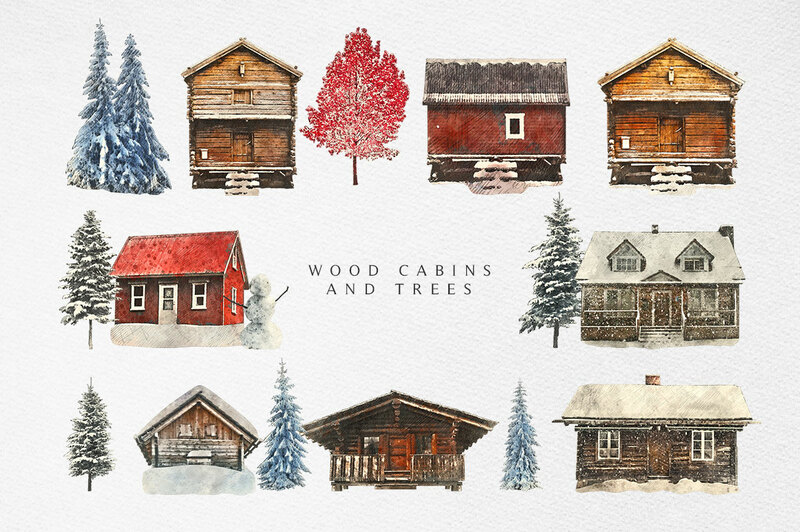 The wonderful forest creatures and homes. Of everything offered this season, definitely my fave. I’ve bought so much from you all through the years, it’s hard to justify buying more. But this bundle has something really special and magical for me. Thank you all for ALL the great products. For 2019, I’d love more mythical, fairy, folk and wonder tale inhabitants and environments. 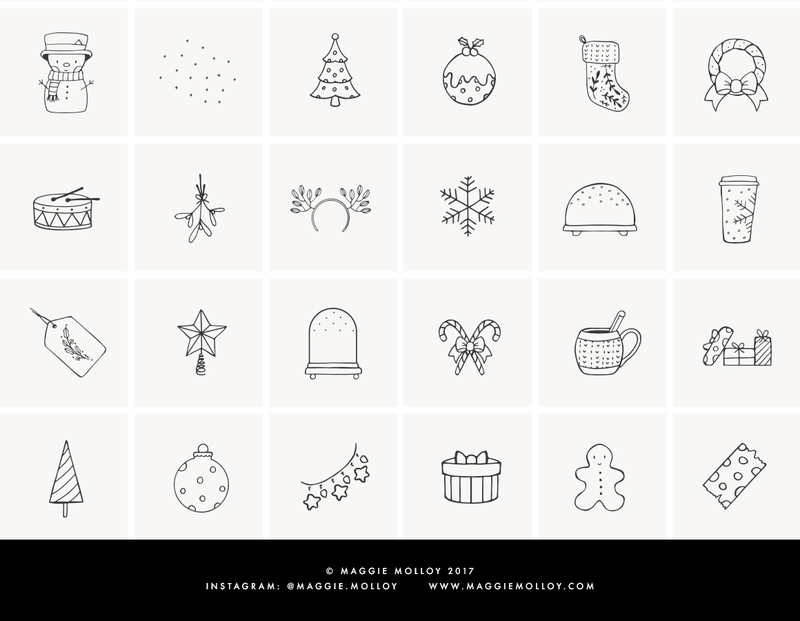 I’ve a wonderful book called “Pagan Christmas.” About the objects, such as mistletoe, holly, trees, red mushrooms, elves and more, which have their basis in pagan beliefs, predating the Christians. I’d love to see more than just Easter and Christmas. I keep asking for cool yoga poses too. 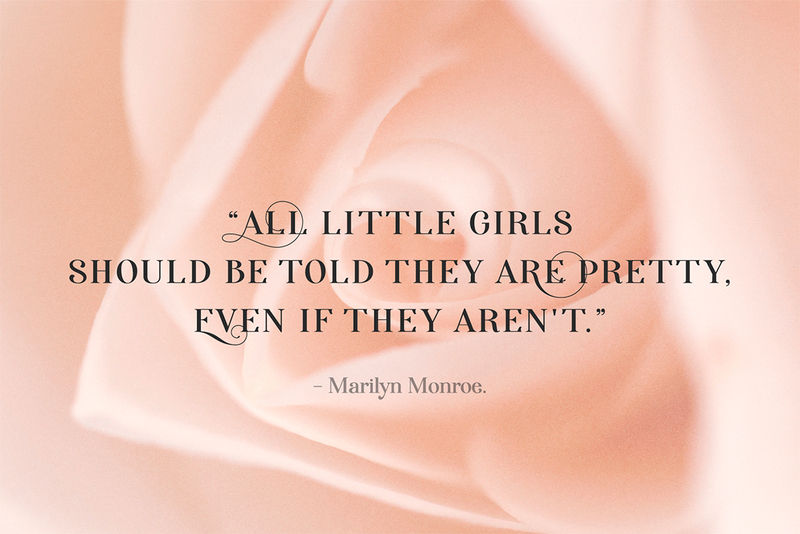 Not just skinny women, please. People in all shapes and sizes practice yoga. Idealized bodies are ok for some. But I am tired of seeing so many unrealistic bodies. I’d love mermaids and selkies, dragons and griffins, people in non-Western clothes, people from previous cultures and from all over the world. Something for people who love fantasy and fairy tales and varied cultures. IF they are out there. 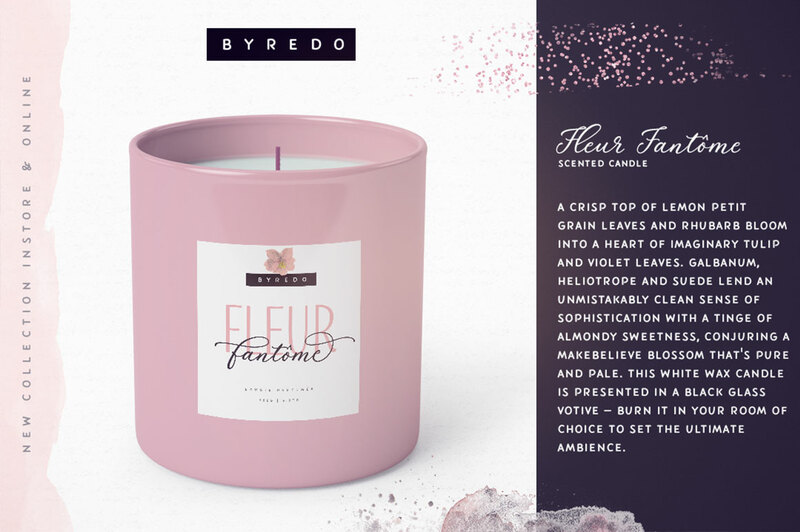 Is it possible to offer mockups that look like the previews? I keep asking. I keep looking online too. I simply cannot find real rooms, bedsheets, purses and tote bags, real items beyond the trite and true office supplies. I want what I see in the artists’ previews. If someone responds by saying just use mockups (which happened in the past, and really hurt my feelings, cos I DO search online), please give real info as to who is creating the superb mockups I am seeing in your artist previews. I hope it’s ok to make requests. I know you work so hard. As an early and widely published/exhibited punk rock photographer, that when people tell me what they like, I am able to provide more of the images people prefer. 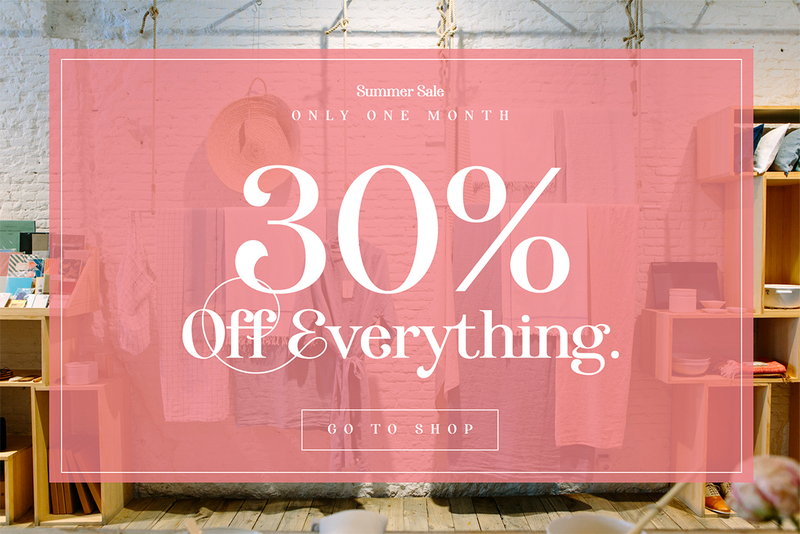 My gratitude to all you at DesignCuts and your fab customers. Happy Holidays. Here’s to a better 2019. 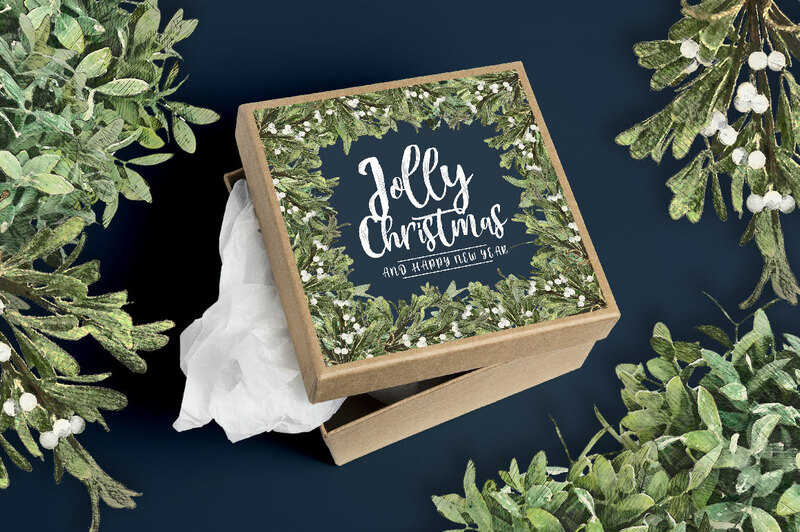 (PS maybe offer a bundle that is more religious for the person requesting Jesus, covering both Christmas and Easter. Then ANOTHER bundle for those of us non-Christians or who aren’t offended by other religious images. Some Chanukah, some Hindu, Buddhist images would be fab! In an ideal world, that would be great. But please don’t bundle them together! PLS keep overtly religious Christian images separate from other religions. I think that’s a much safer, less offensive way of dealing. 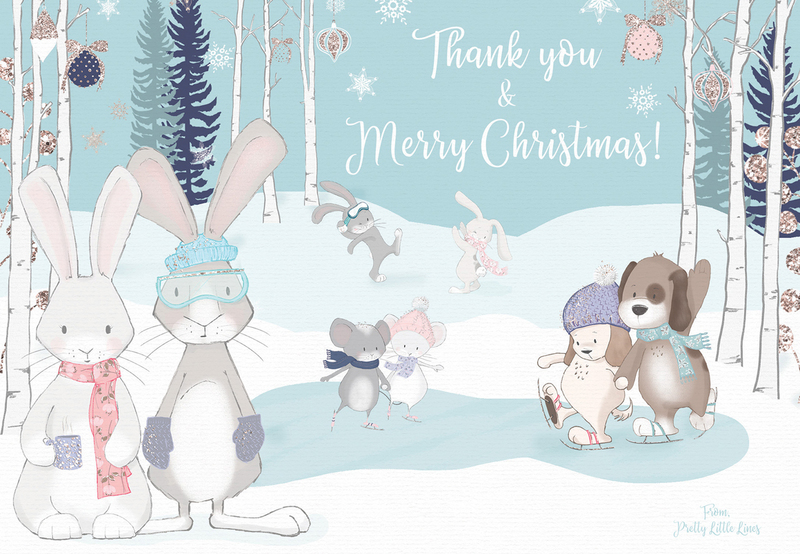 All of us here at DC HQ hope that you have a lovely holiday too Jenny and thank you so much for all of your support! Thank you so much for your comment and we love a challenge lol! We love receiving feedback from our community so thank you so much for taking the time to reach out to us Melinda. Rest assured I have popped our Product Team a request for future for you, and if you find any packs in mind that you would love to see included in a future deal, please do not hesitate to pop us over some links- we would love to check them out! 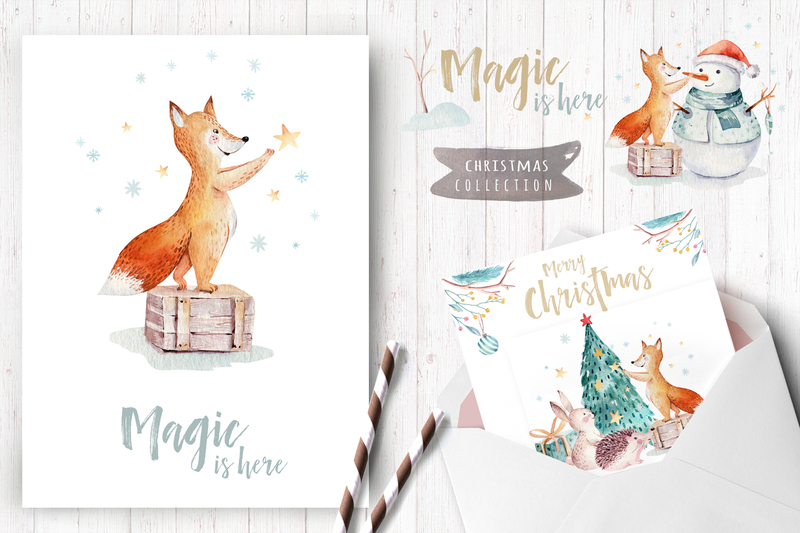 A lovely magical Christmas bundle. Personally, I agree with you not having any religious symbolism/images. 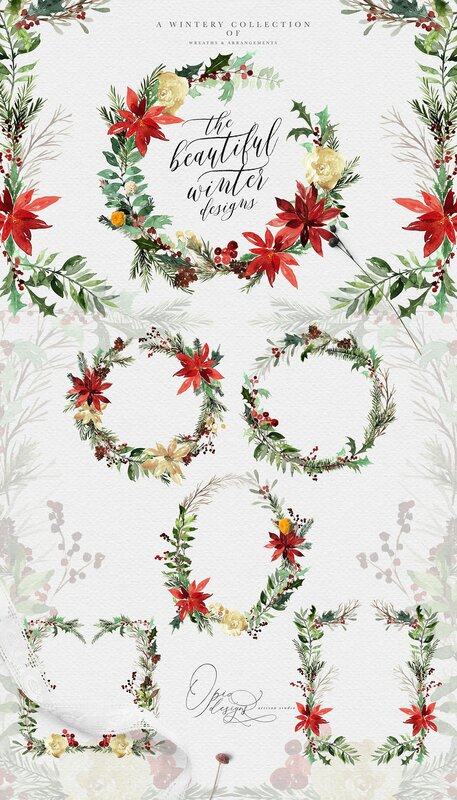 I am pagan myself, and my cards are usually Solstice celebrations, but I don’t expect you to provide such symbolism. I can find that elsewhere or create it for myself. And the same for those wanting Christian images. 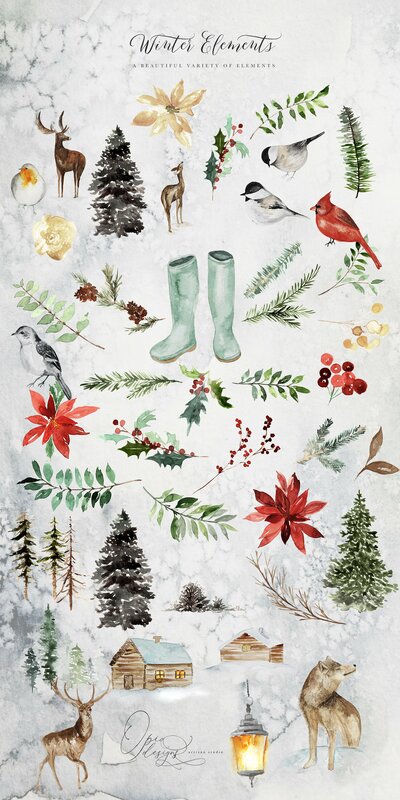 I like to think of Christmas as a beautiful winter festival (summer for the ‘down-unders’!) and a celebration of babies, new life, families, and all that rebirth delightfulness. A hopeful time when we look for light in the darkness, which everyone can celebrate – whatever their religion/beliefs/race/species! 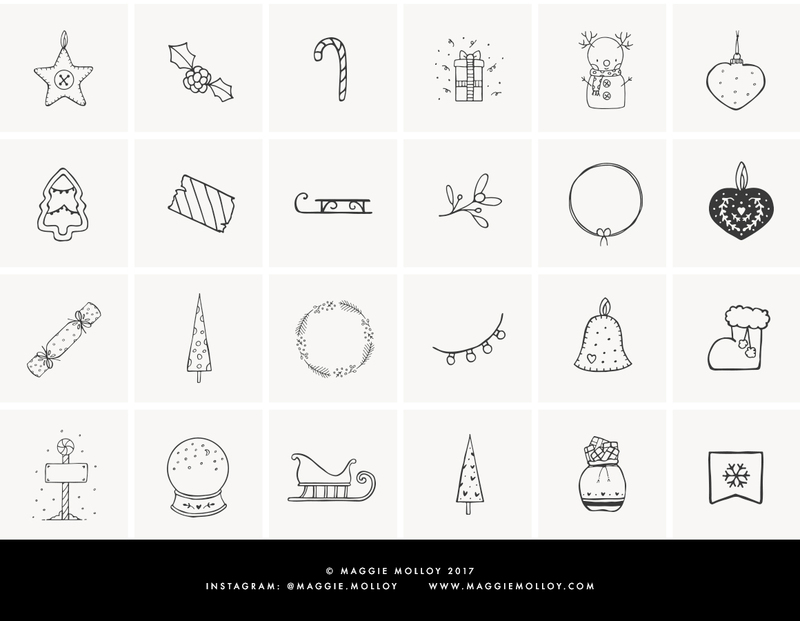 We hope that you have lots of fun working with these and celebrating the holiday season! 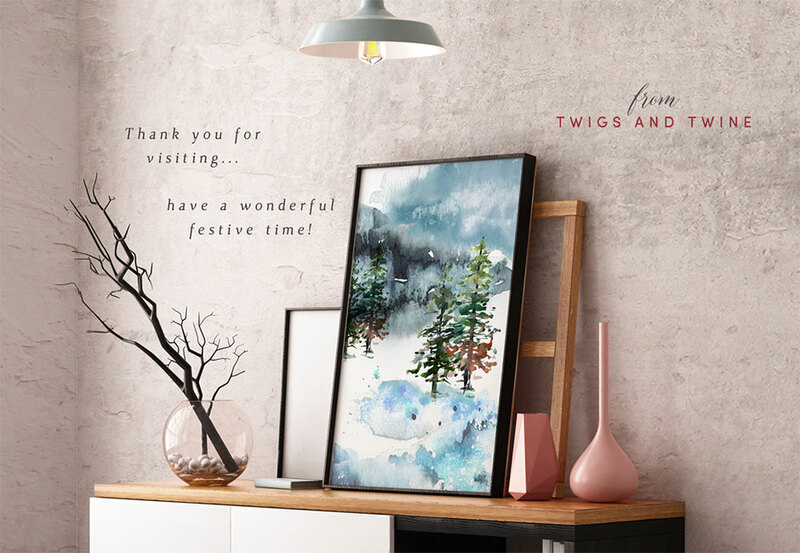 Hee-hee we’re so glad that this one is such an insta-buy for you Inga and hope that you have lots of fun working with all of your new festive goodies! 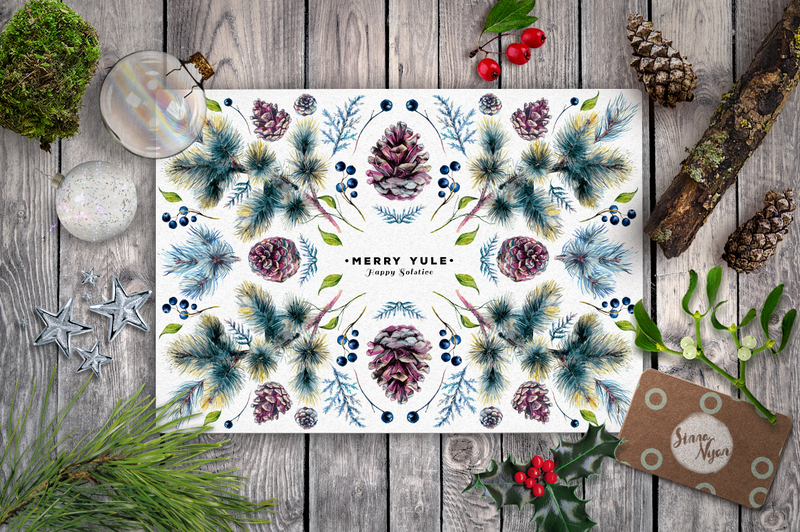 We hope that you have a lovely Christmas too Christine and happy designing! Hee-hee we’re in the festive spirit here at DQ HQ Sabrina and we hope that you really enjoy our bonus Christmas themed bundle! 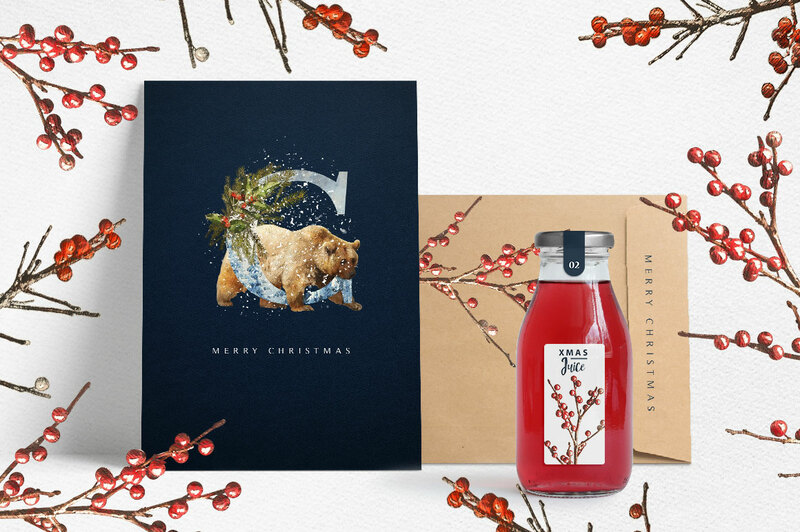 Each year you manage to go the extra kilometre and produce an extraordinary and useful Christmas offering. And, as usual, I’m going to raid my emergency mad money budget to purchase it! I’ll add my voice to those above to point out that Christmas is about the birth of Jesus, God’s Son. That’s the real message of Christmas – God loves us, and because of Jesus, He can forgive us! (2) All that snow is lovely, but here in Australia (and in much of the majority world) it’s a hot Christmas! We have BBQ’s at the beach, not so much with the fireside and woolly cardigans! Thank you Design Cuts team! 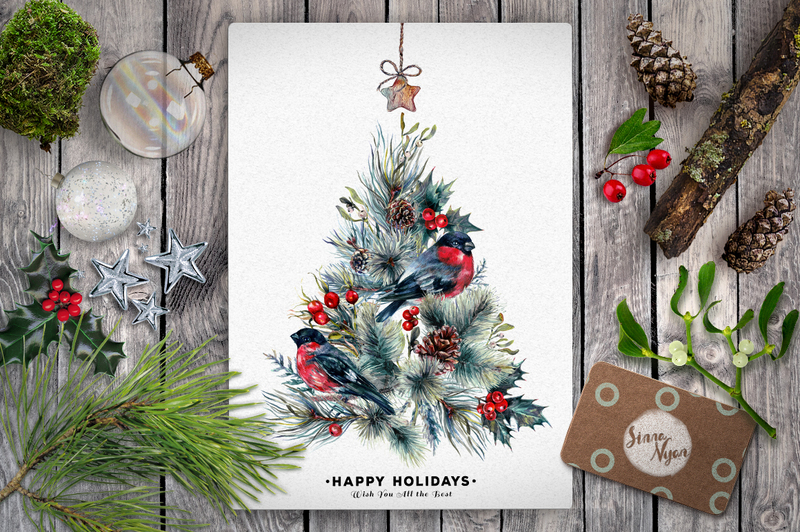 I know it’s still only November, but I’ll take this opportunity to wish you a Merry Christmas, and best wishes for you and your families. Thank you so much for your super kind words of support, this really means so much to us and we’re so happy to hear that you are really excited to add this Bundle to your collection. 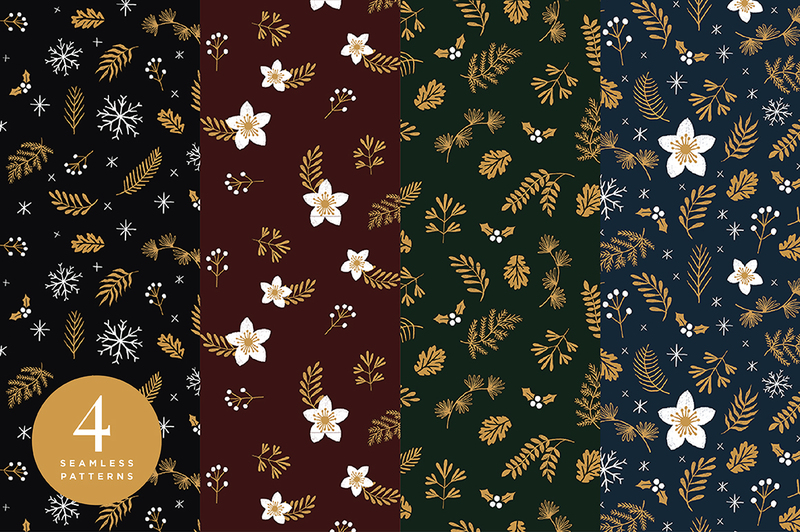 We really love hearing suggestions from our community so thank you so much for taking the time to let us know your thoughts, these are great and will be really helpful in us improving our future Bundles and deals to make your Design Cuts experience as bespoke as possible. Due to our diverse community, we always try to create our bundle deals to appeal to the vast majority, and so we tend to remain neutral in relation to religion for our Bundles so we are so sorry for any disappointment caused Stephen! It’s awesome to hear that your Christmas will be sun and BBQ’s on the beach, that sounds really lovely! Rest assured our Product Team would be happy to take a look at any Summer Christmas themed resources that you might like to see included in a future deal so please do not hesitate to pop us any links over of what you would like to see in a future deal and we can certainly check them out 🙂 The great news is that we also have some very special surprises in store coming very soon for Black Friday so we hope that you enjoy checking out our other deals for some perfect new resources for you! Thanks again for your awesome support Stephen, and we hope that you have a wonderful Christmas too! Don’t forget us down in the Southern Hemisphere! Love the bundle but not for a summer Christmas. Is it available for YouTube videos? Thank you so much for your purchase, we hope that you have great fun working with your new resources! 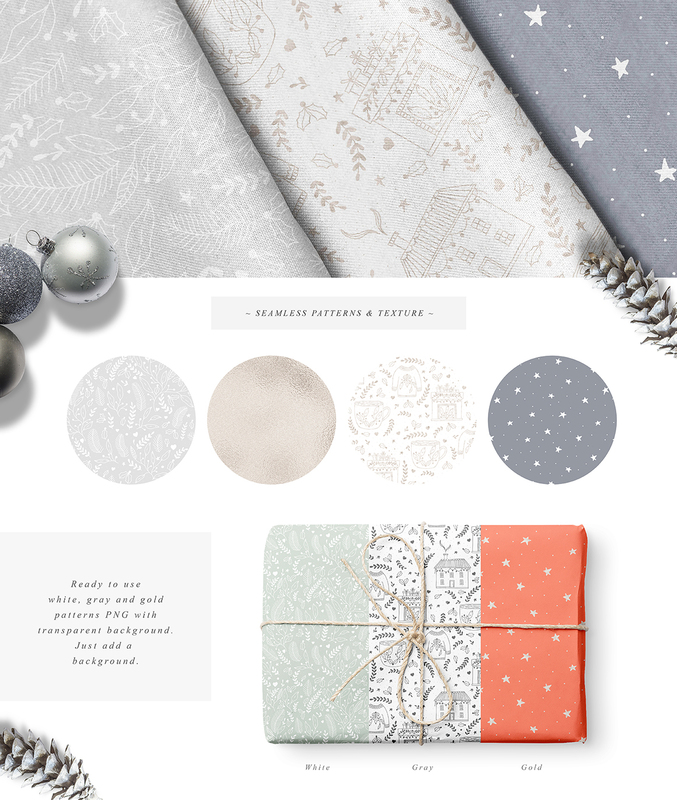 Soooo happy to see this *absolutely delightful* bundle — wowee, love it!! Yay we’re so glad to hear that you love it and hope that you have lots of fun working with all of your new resources! 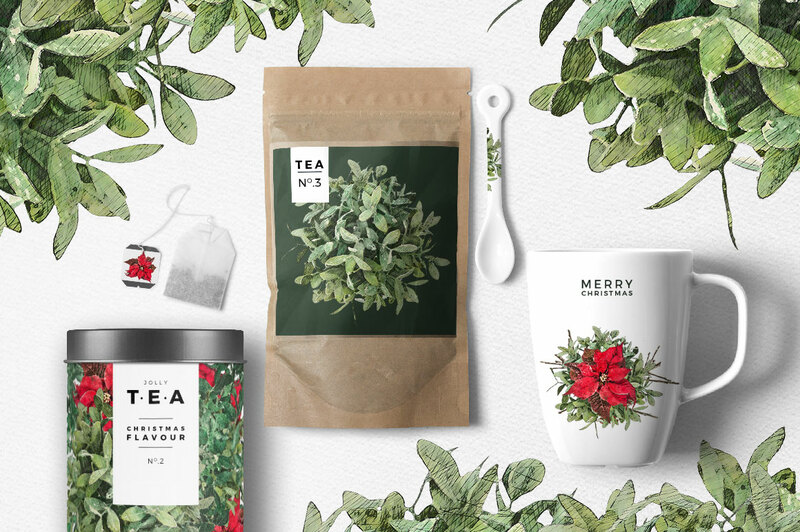 I can never resist your bundles and will get this one too – however, it would be lovely if there was something included that would be more suitable for those of us down under who have Christmas in the heat of summer. Wow wow wow!!! This is great! I agree that a few elements with religious overtones would be a lovely addition too. This is a must buy for me anyhow. We’re so happy to hear that this one is such a must have for you and hope that you really enjoy working with them! Our sincerest apologies for any disappointment caused by this particular bundle not including any Christian related resources. 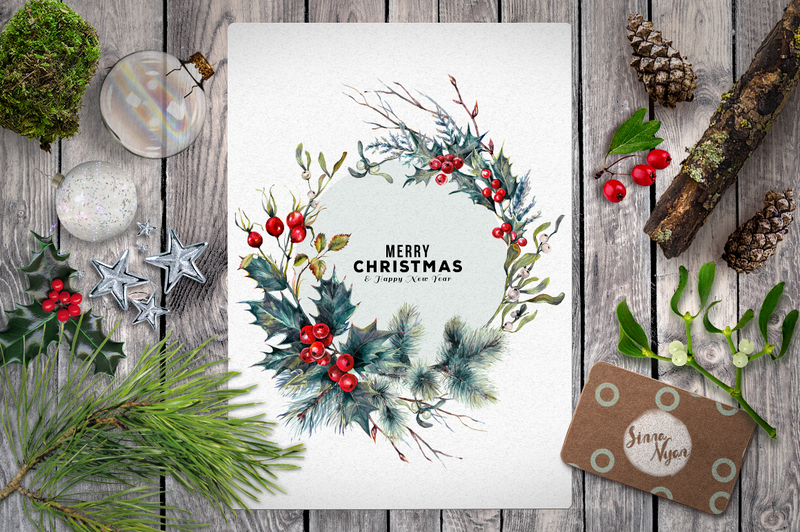 As our community is very diverse, we hope that this festive collection can appeal to the vast majority of our community so we are so sorry if you are looking for specifically religious themed resources. We would happy to help you further with your resource search so please feel free to email us at hello@designcuts.com and we can certainly help! Magical. gorgeous, stunning. 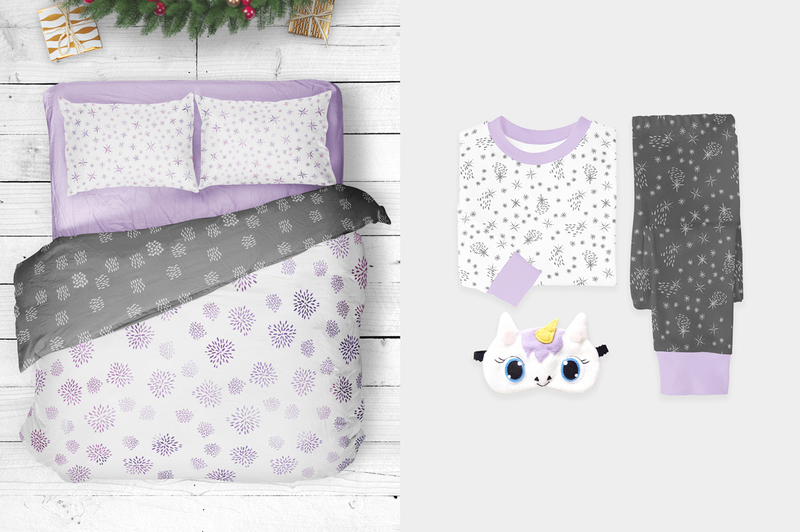 Oh my, this is the most beautiful bundle ever!!!! Aww thank you so much for your super lovely comment Shrimati! We hope that you get lots of great use out of all of your new resources! Wow this is just amazing. Yay we’re so happy that you think so Chris and thanks so much for commenting! Holy cow, you guys scared me when I saw the email for this. 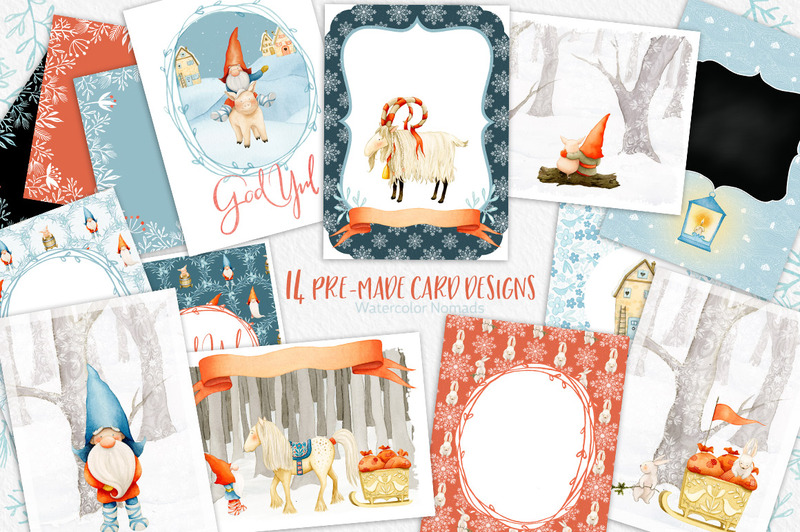 Thought the last bundle had expired and I had missed it! BDN x 2! We hope that you have great fun taking your new bundle for a spin! Thanks Agnieszka, well put. The addition of religious images would complete this deal. Thank you so much for commenting and we’re sorry for any disappointment caused by being unable to see any Christian themed resources in this particular bundle. As our community is such a diverse group from all religions, we try to maintain being fairly neutral when it comes to religious holidays as we hope these resources can appeal to the majority of our community so our sincerest apologies for any disappointment caused! We hope that you enjoy all of these seasonal resources and get great use out of them if you decide to take this one for a spin! Thank you so much for your comment and we’re so sorry for any disappointment caused by the name of this holiday themed bundle! 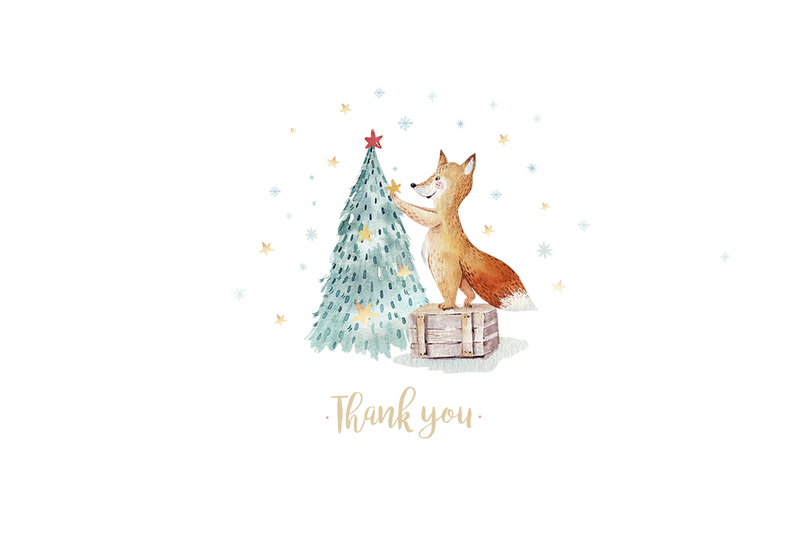 We completely appreciate that some of our community may not celebrate Christmas as a holiday so thank you so much for your feedback, your support is really helpful and we hope that you really enjoy all of these festive design resources for your resource collection! Thank you so much for your comment and I’m so sorry to hear that our Bundle social sharing links are not working for you. Rest assured I have popped you over an email to help!